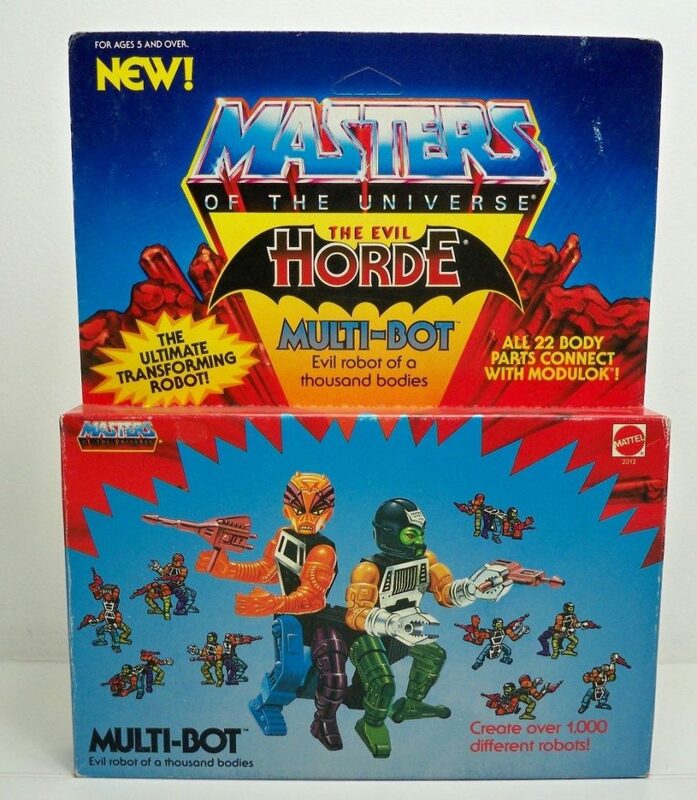 Multi-Bot was a figure I don’t recall ever seeing as a kid. 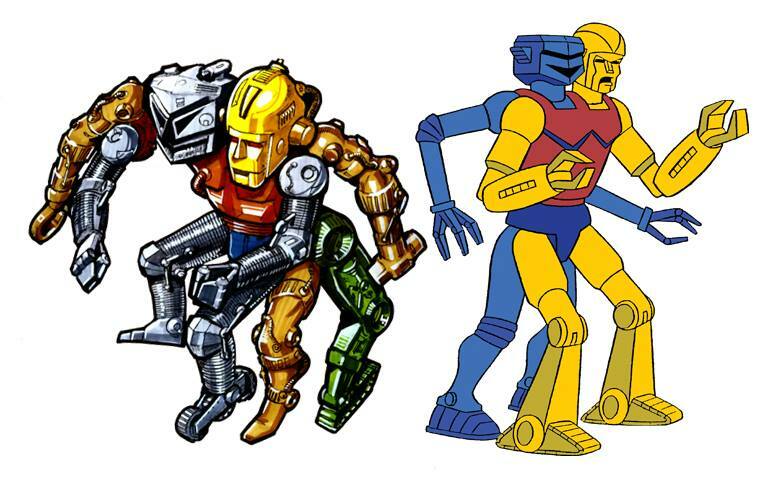 The concept is familiar enough – take the transforming body idea from Modulok and turn it into a robot. 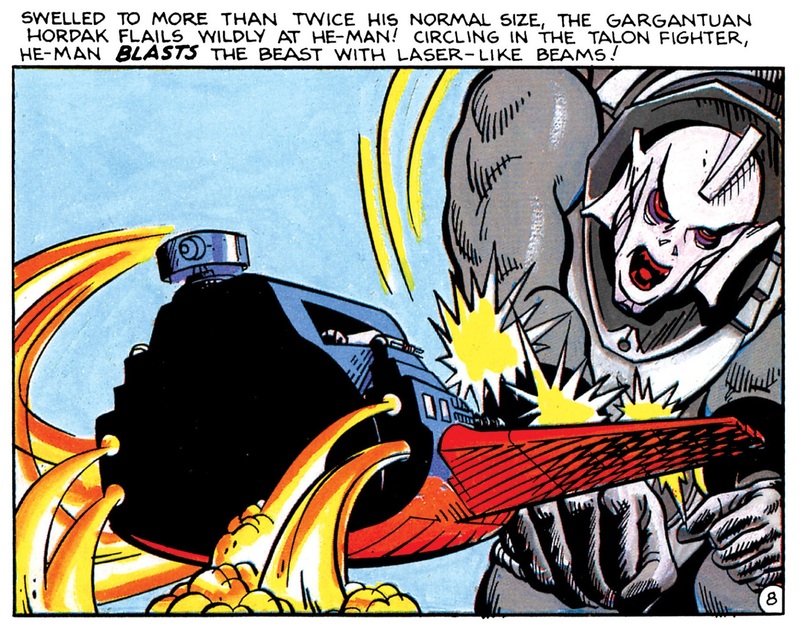 It certainly makes more logical sense for a robot to be able to swap around its body parts, as opposed to an organic creature like Modulok. 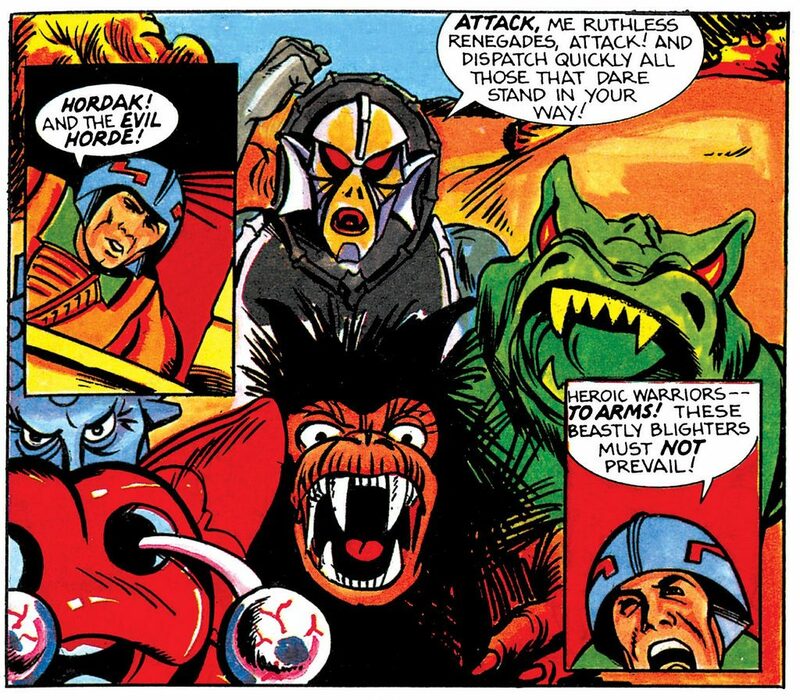 Then again part of the fun of Modulok was the gruesome fun of imagining a monster that could do such a thing. 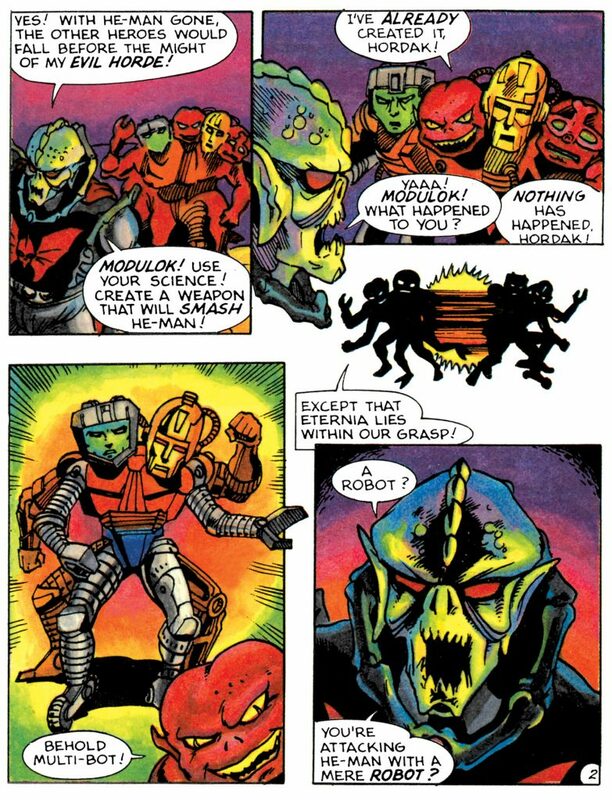 Modulok and Multi-Bot apparently originated with the same concept idea by Roger Sweet, called Modular Man (source: The Power and the Honor Foundation Catalog). 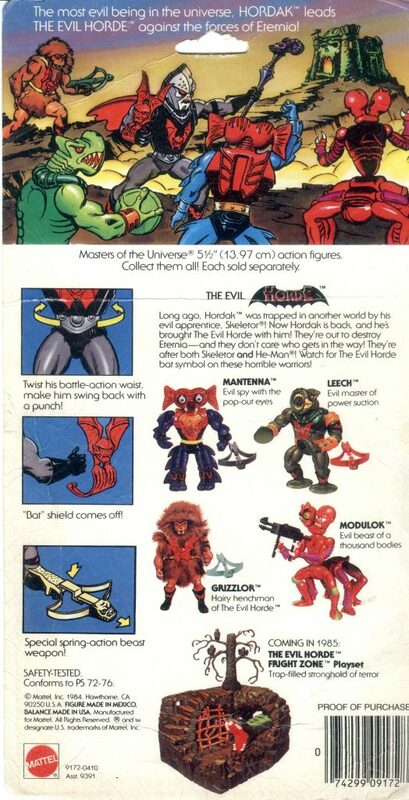 Ted Mayer did the visual design work for both figures in June and July, 1984. 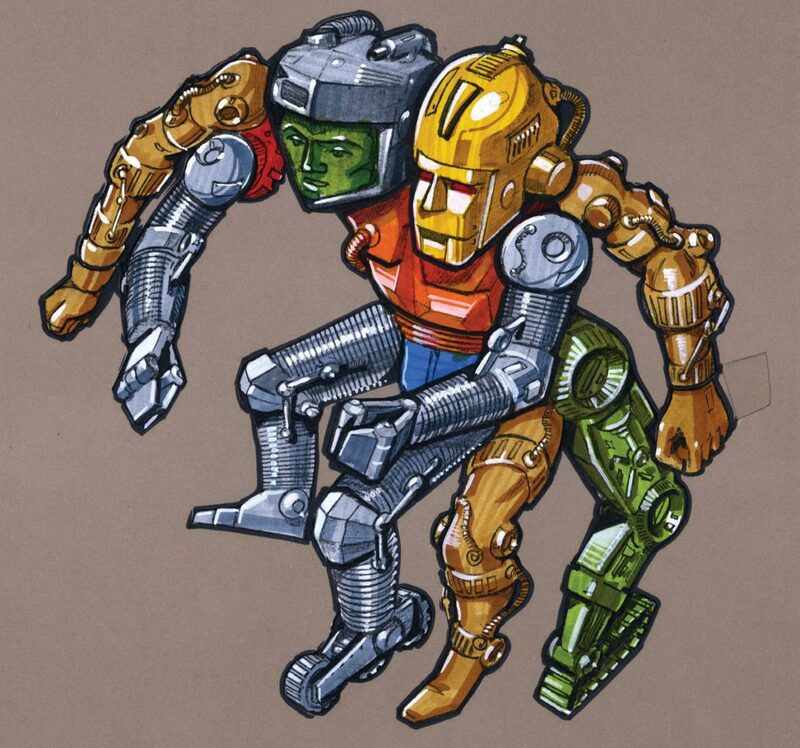 We can see two of Ted’s designs for Multi-Bot below. 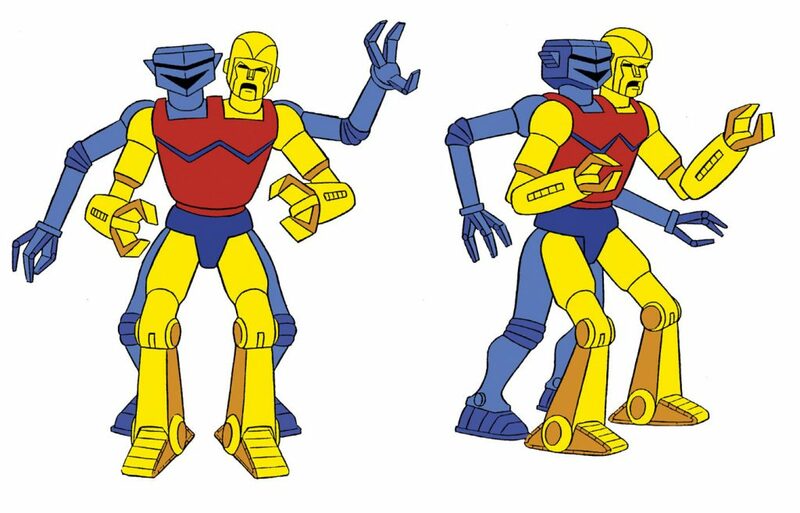 They’re similar, although the right head and left yellow arm designs differ. 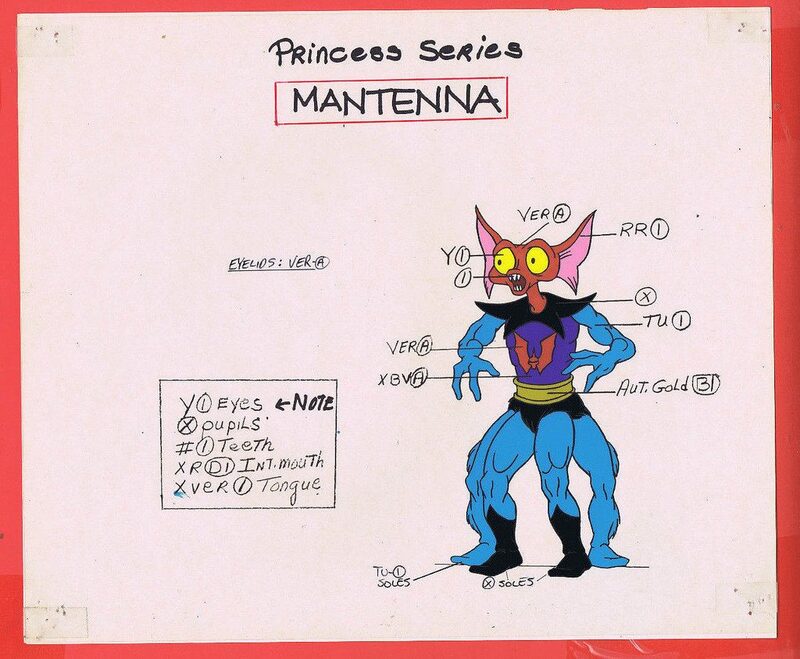 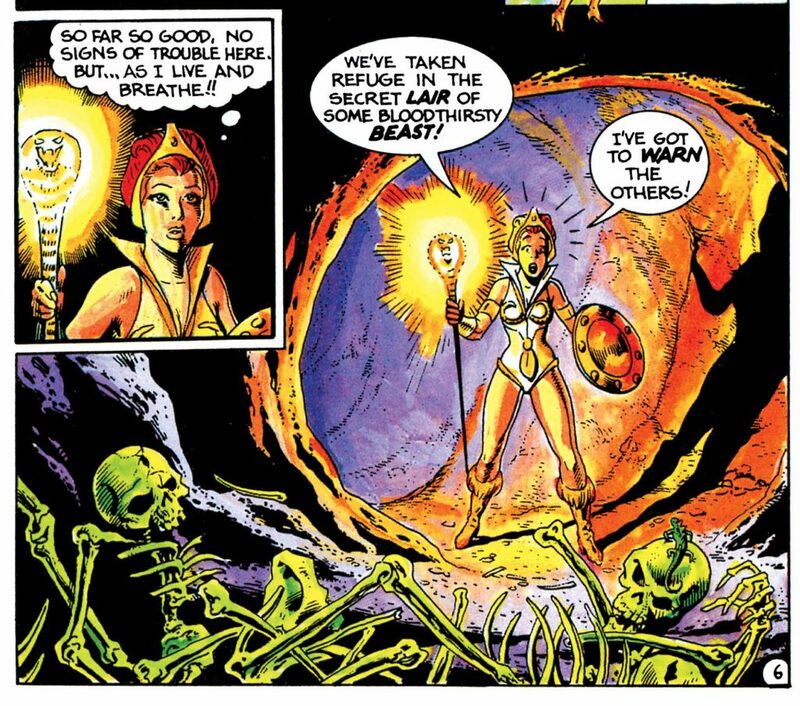 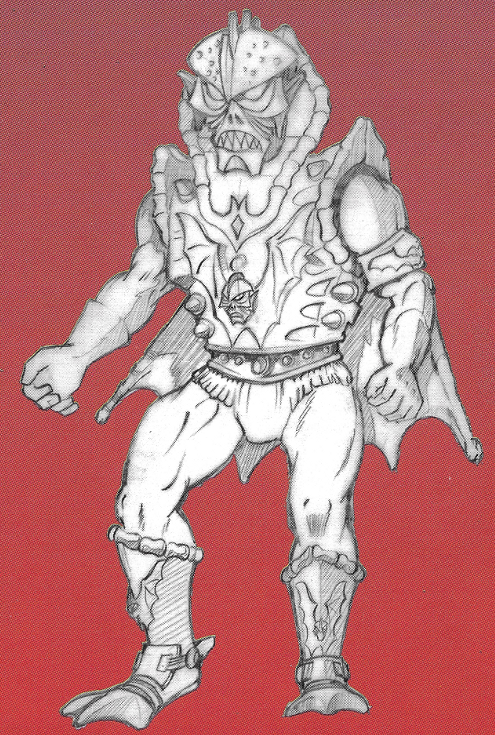 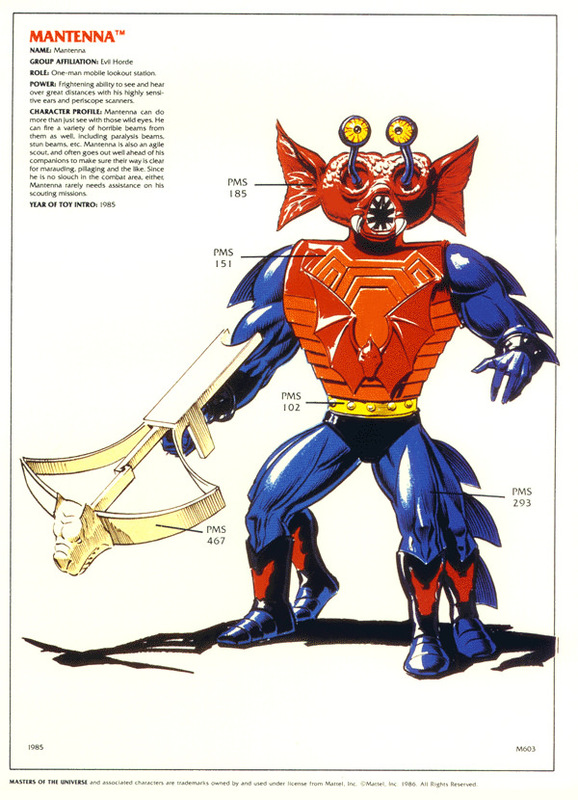 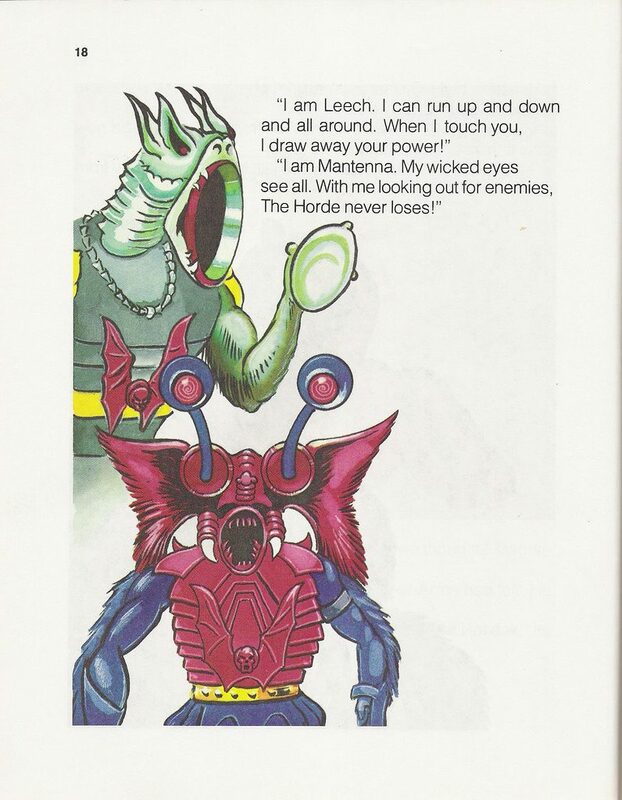 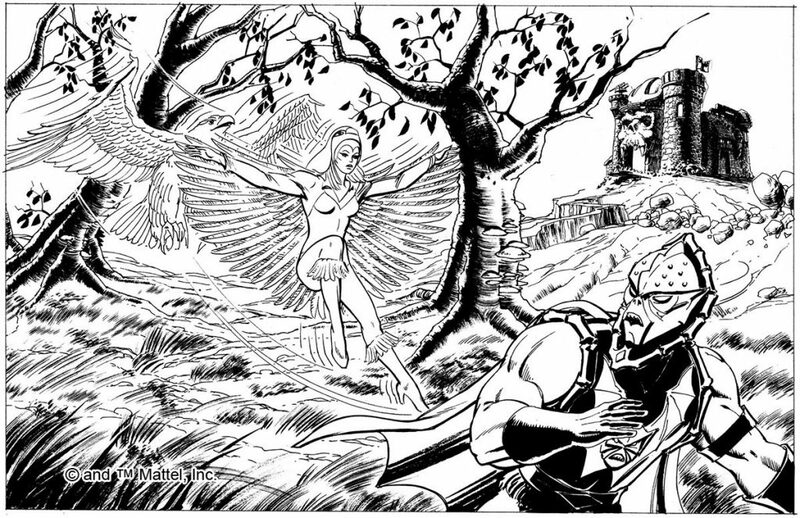 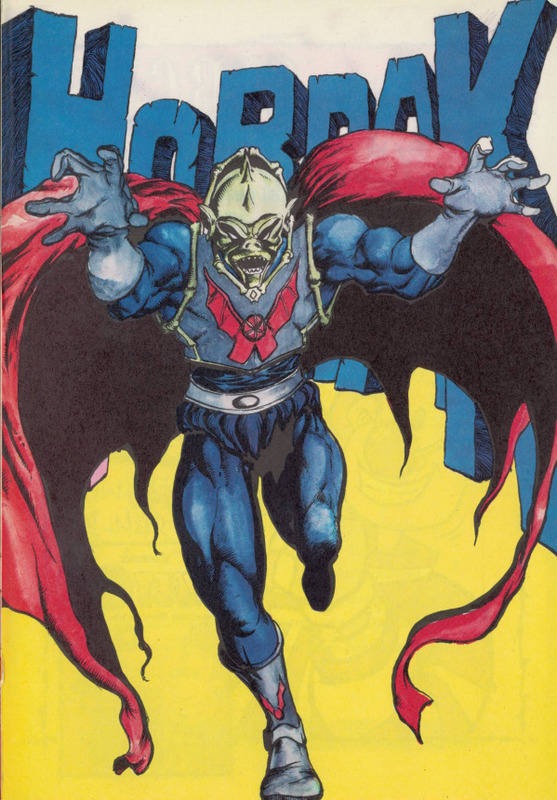 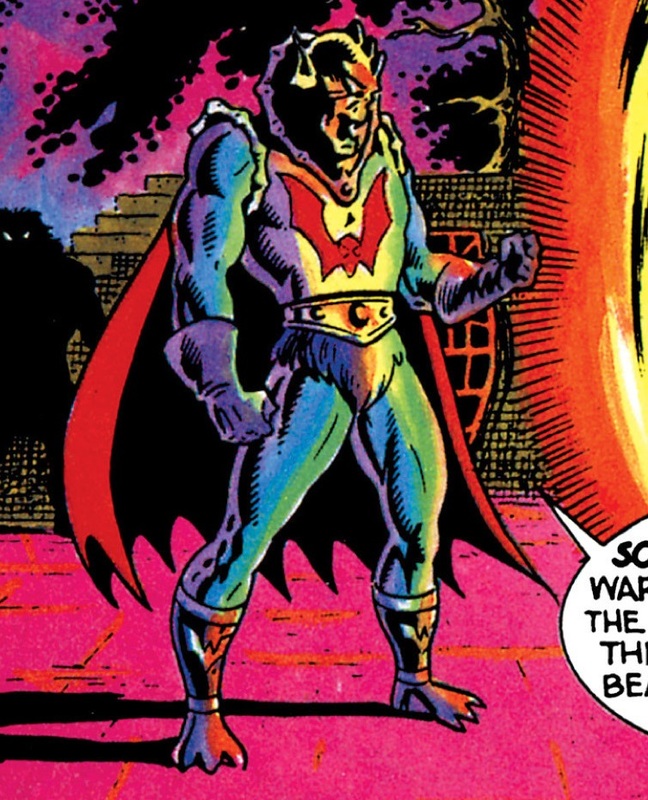 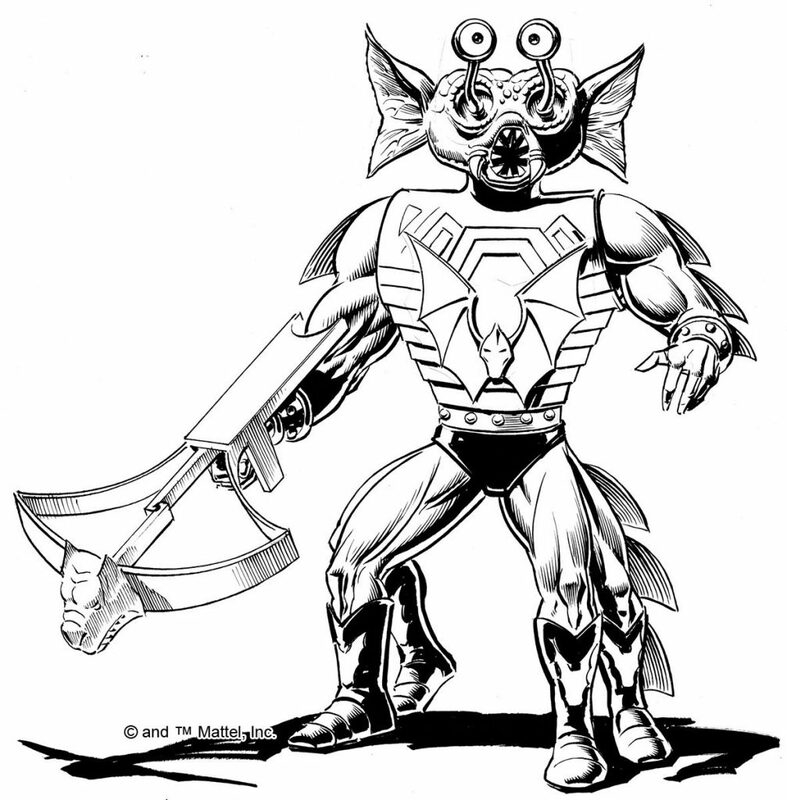 Both of these designs, although different from the final look of the figure, were ported into the minicomic and the She-Ra cartoon, respectively. 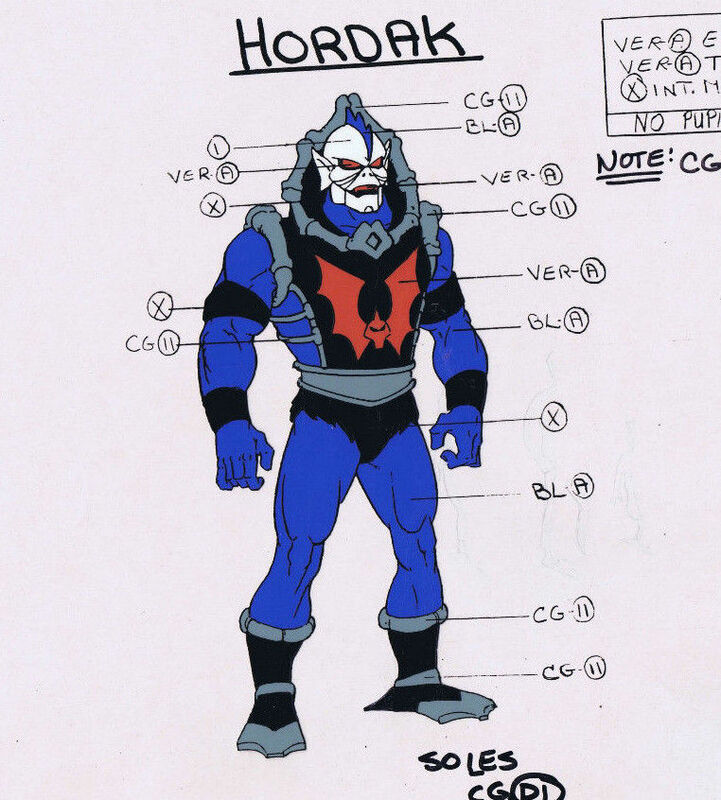 As was often the case, animators and comic book artists needed more lead time in order to meet deadlines, resulting in a mismatch between what was on the shelves and what was on TV screens. 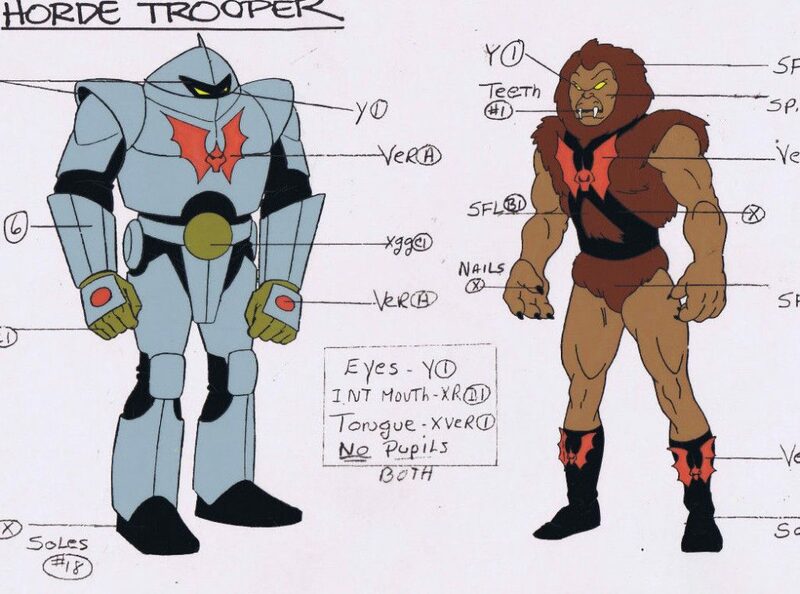 Concept character vs animated look. 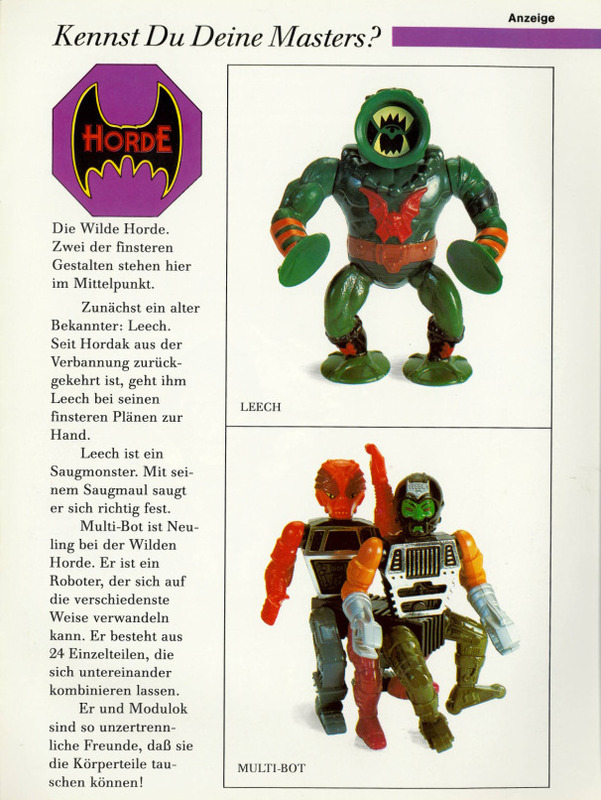 Image source: Dušan M.
The toy design is closer to the Ted Mayer concept design that was used for the minicomics, particularly in regard to the green and black head. 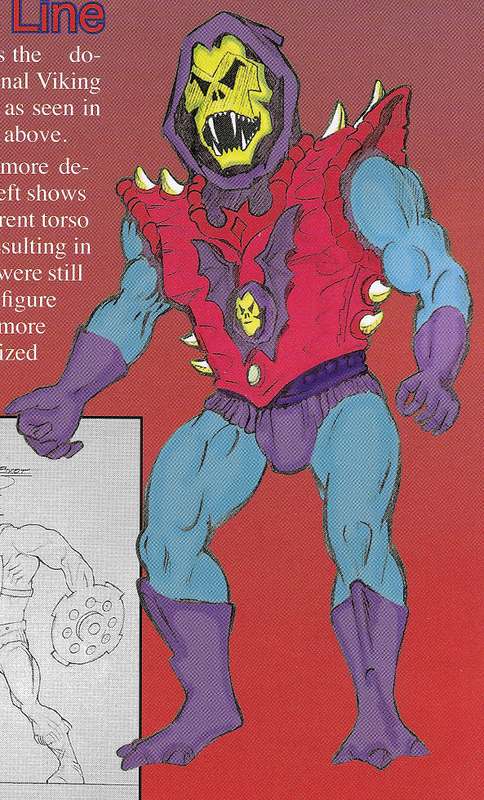 The color choices are generally retained, although switched around a bit. 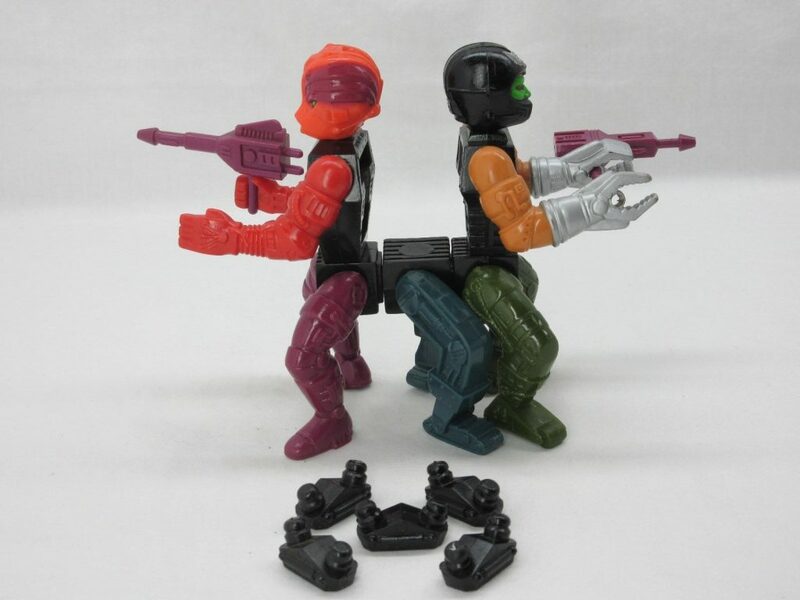 The torso design has been reworked quite a bit, and the figure was given a second torso, giving him greater flexibility to work as two fully independent figures. 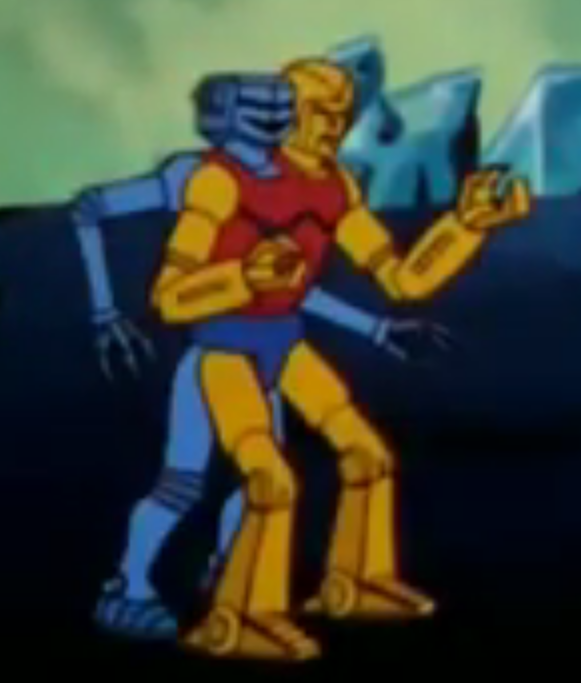 Generally speaking, Multi-Bot about the same height as Modulok, but he’s significantly bulkier. 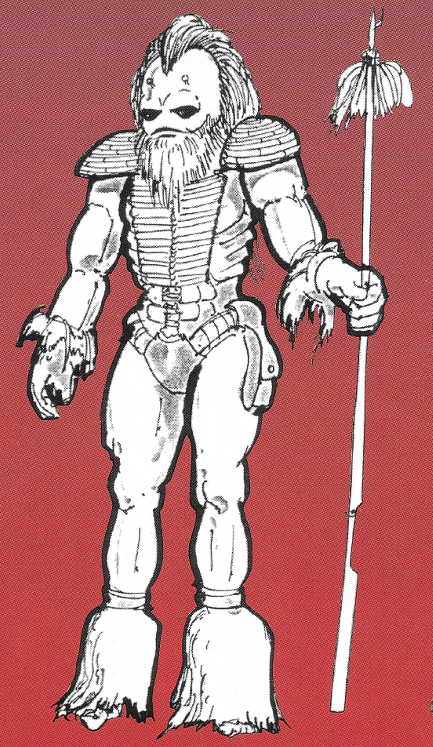 And of course depending on how they are configured either figure can be made to be either short or tall. 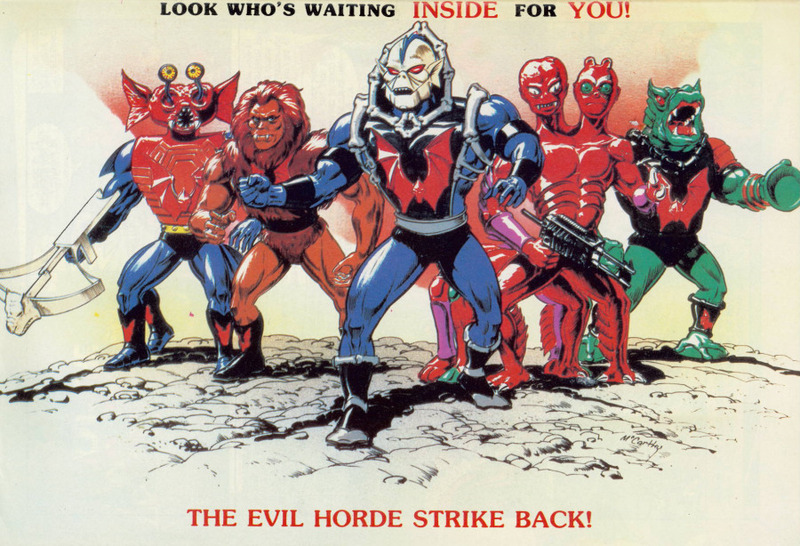 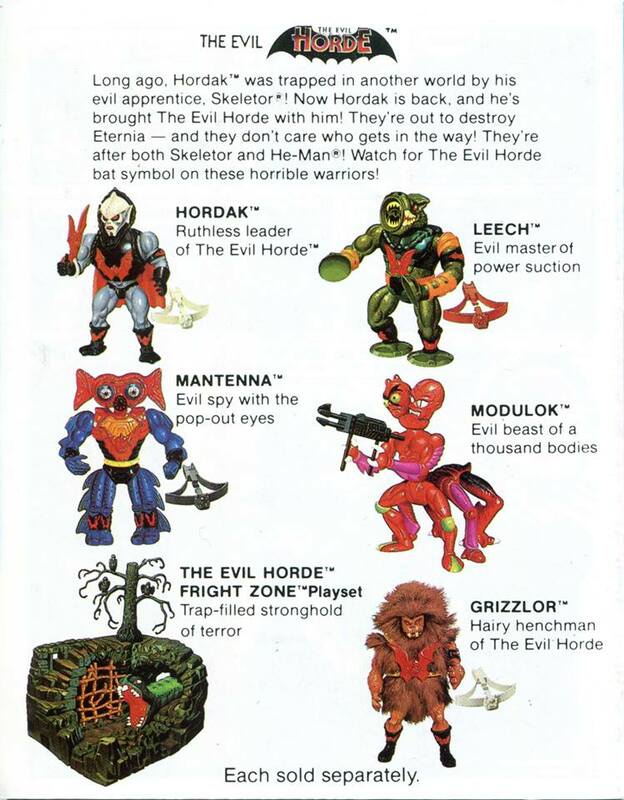 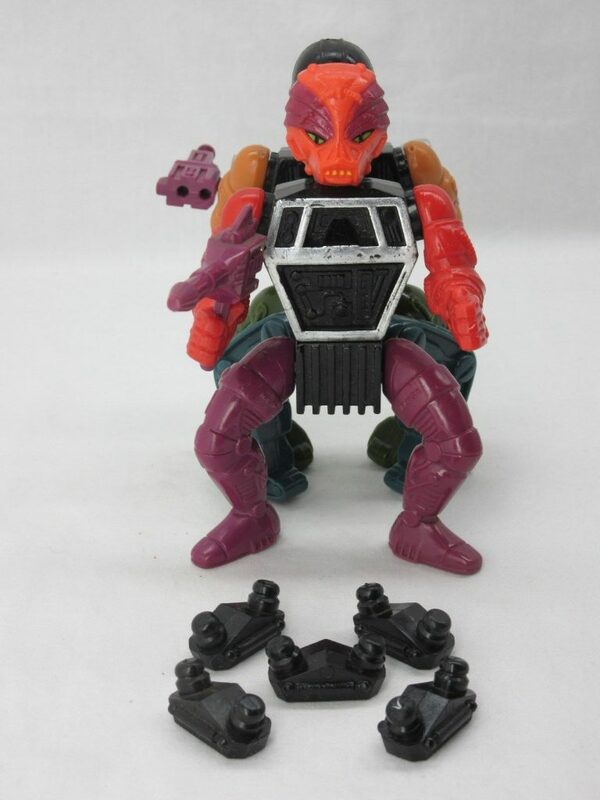 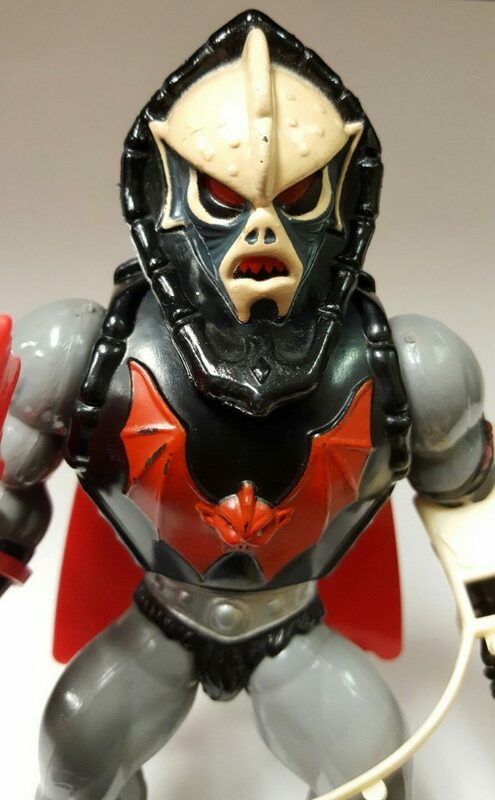 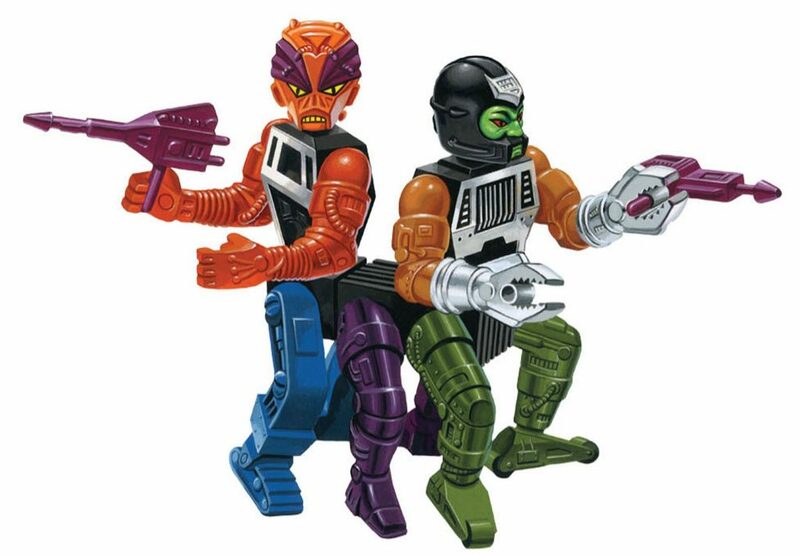 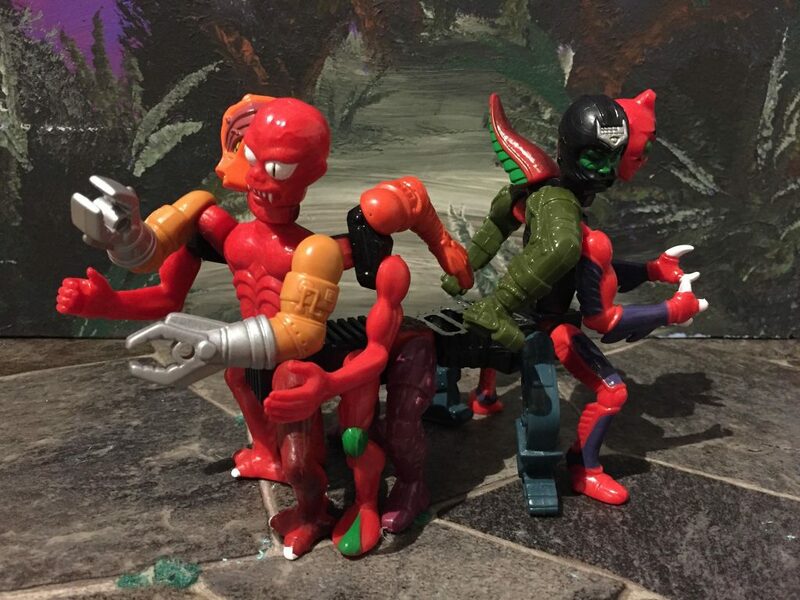 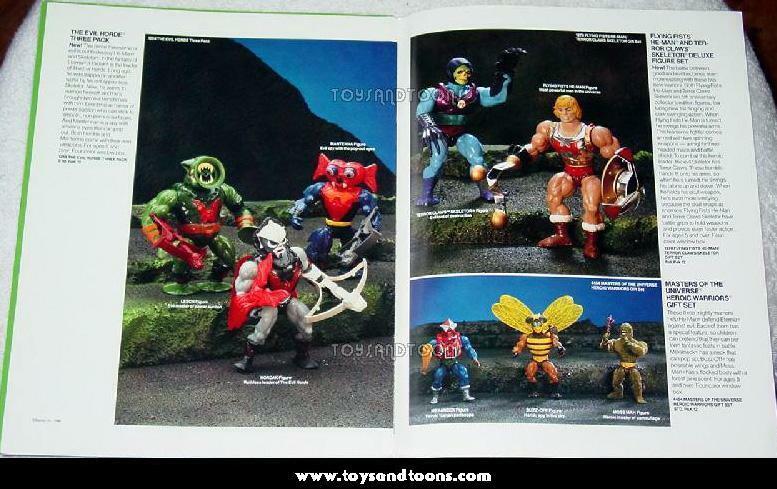 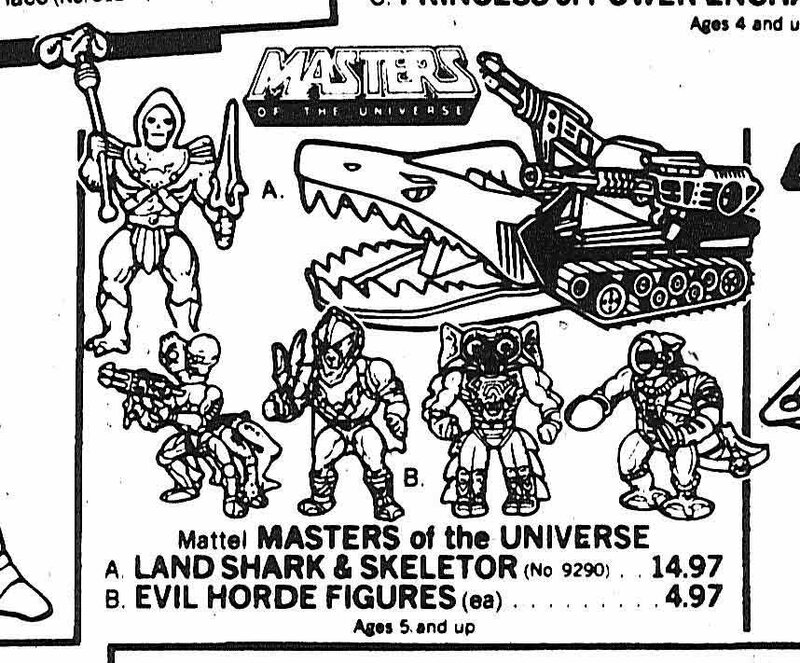 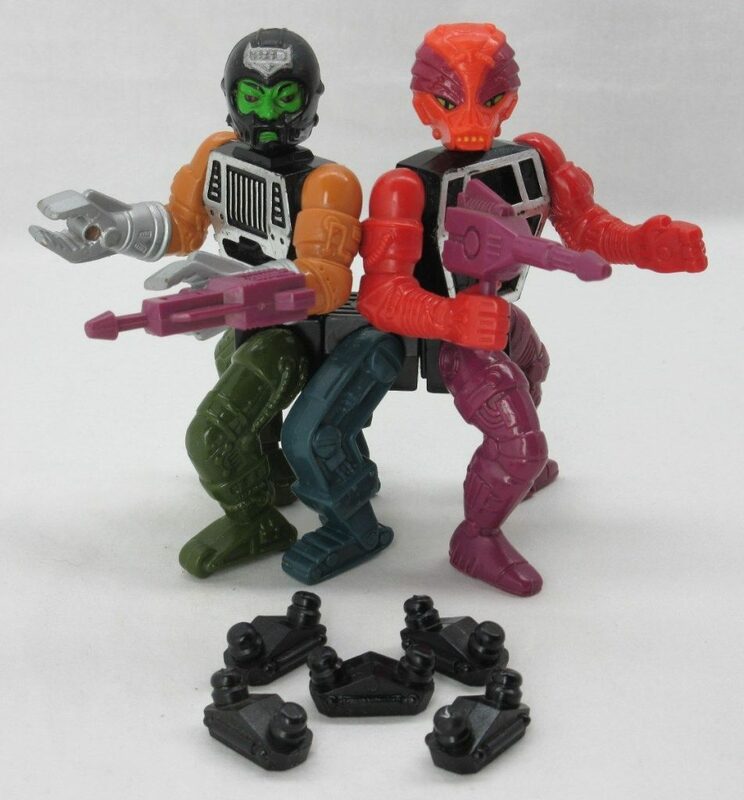 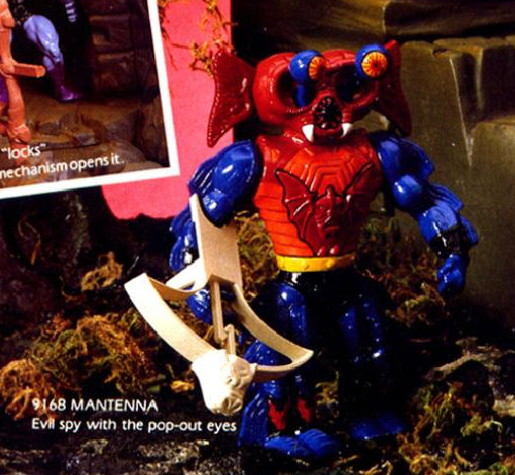 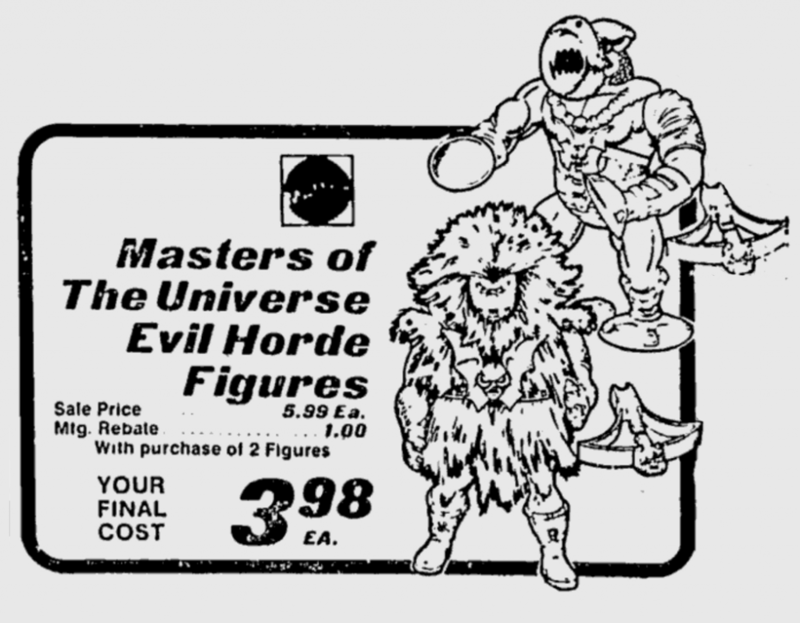 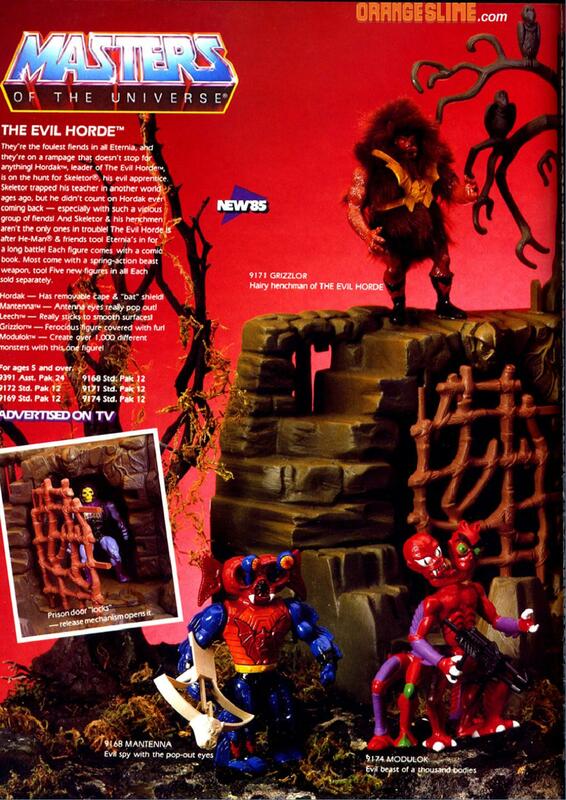 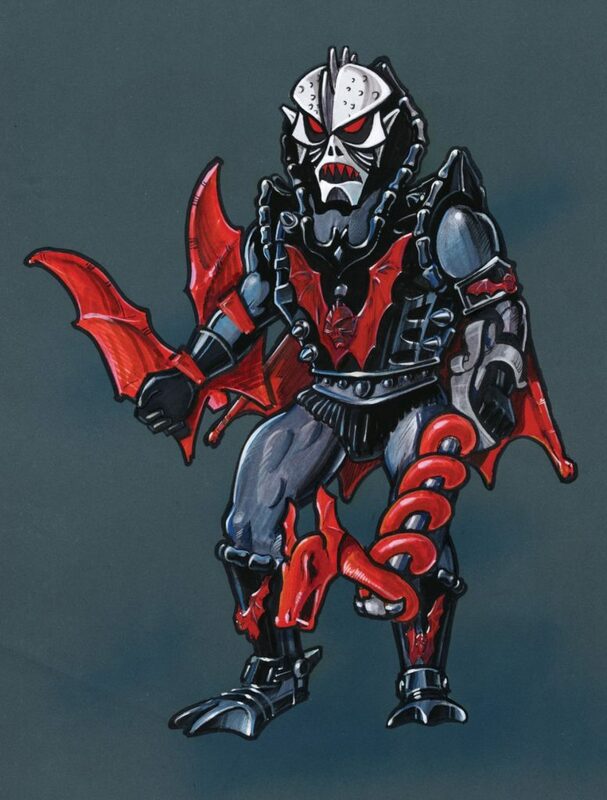 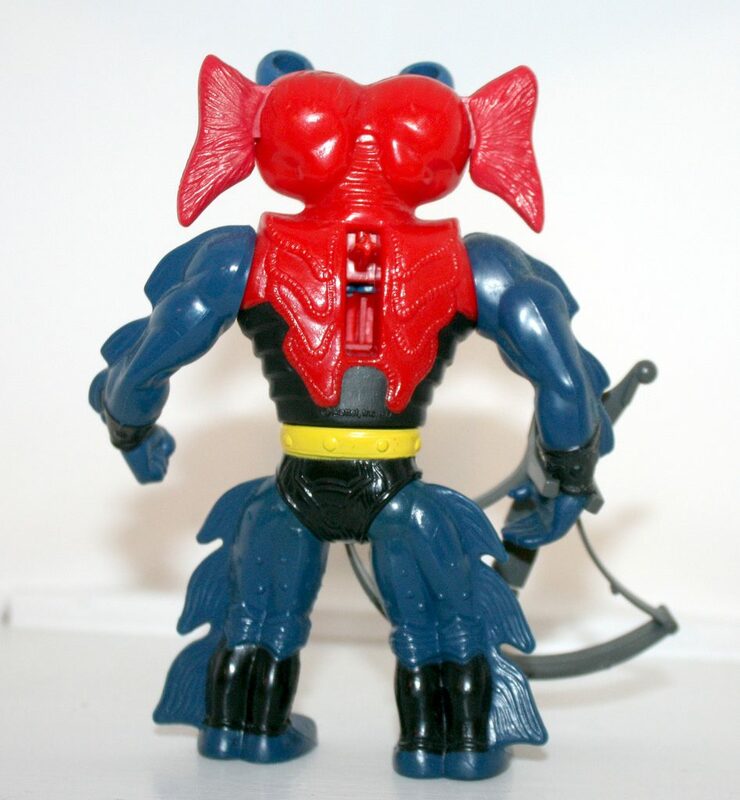 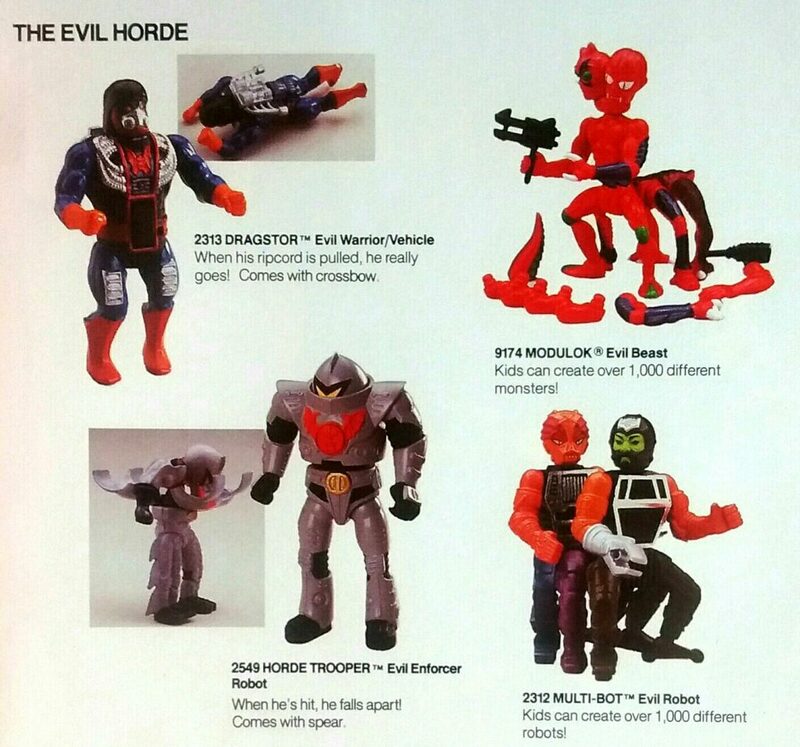 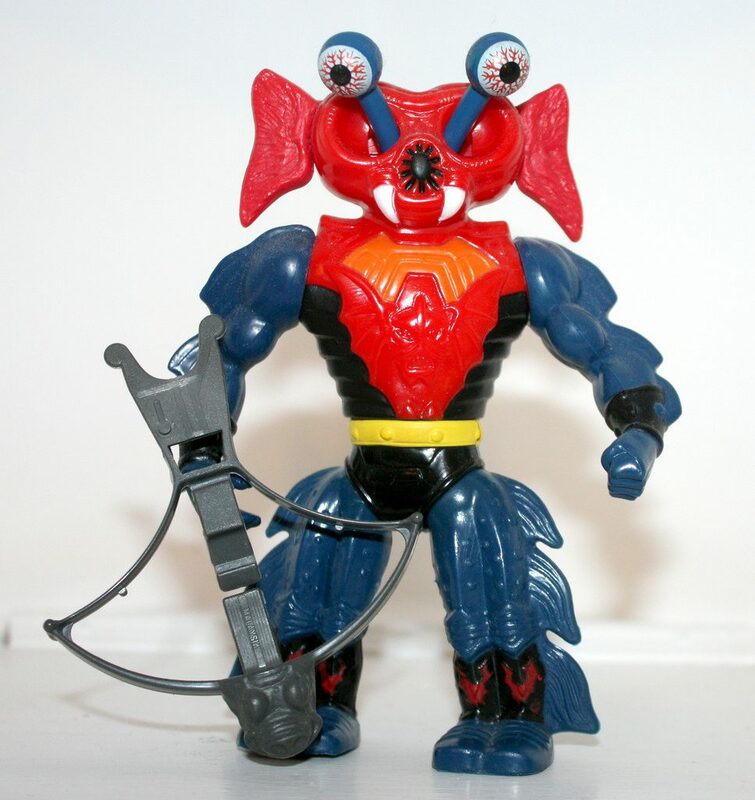 The 1985 wave of Evil Horde figures was generally filled with monsters, while the 1986 wave was mostly comprised for robotic characters, including Horde Trooper and Dragstor. 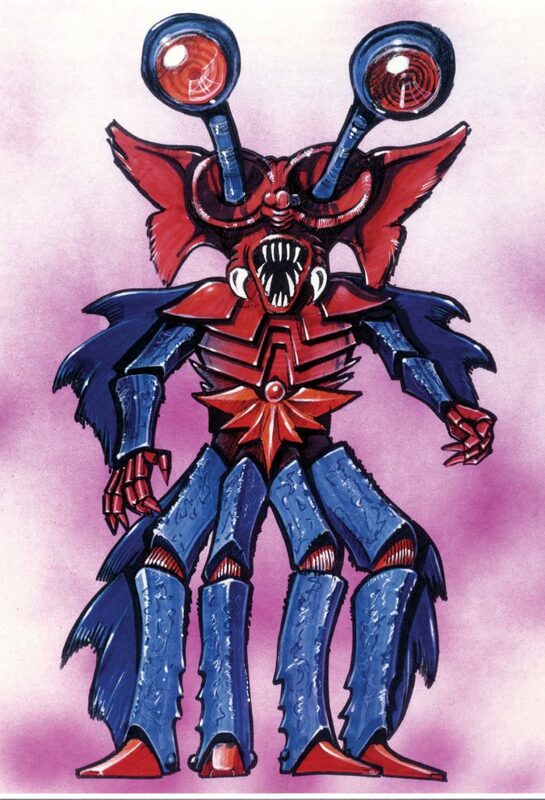 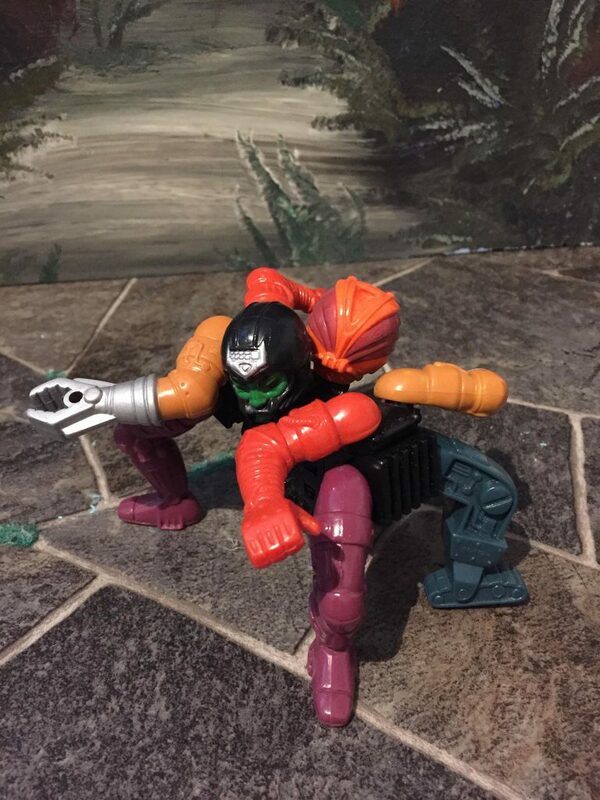 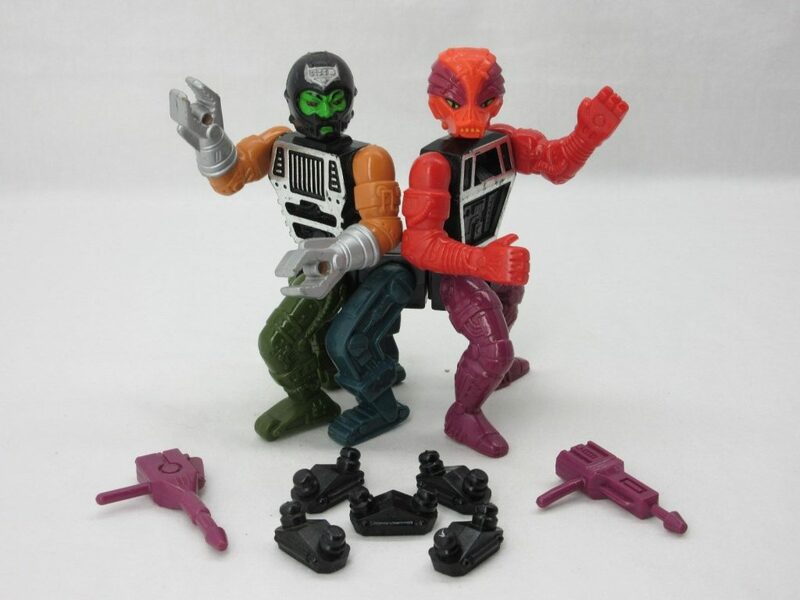 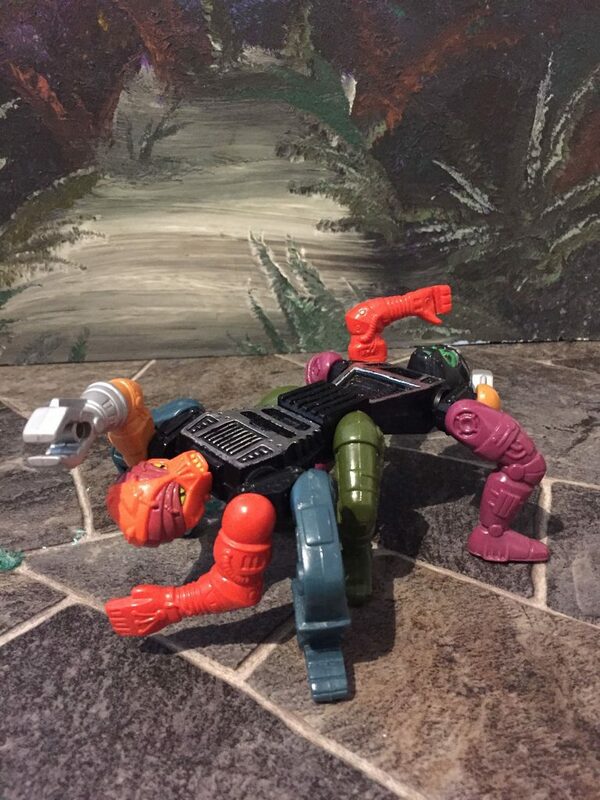 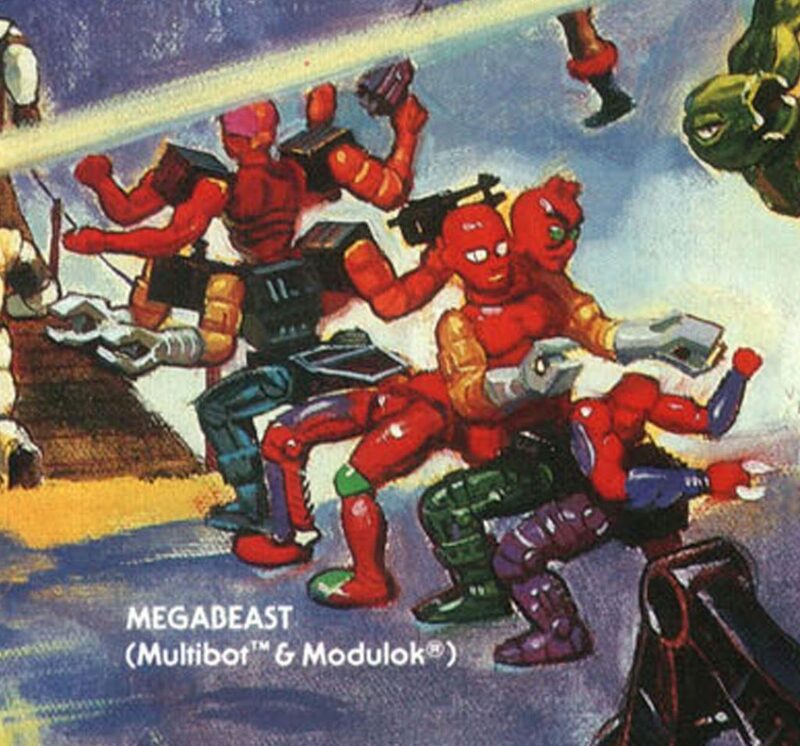 Multi-Bot and Modulok are compatible with each other, and can be mixed and matched to create “Mega-Monster” (also known as “Megabeast”). 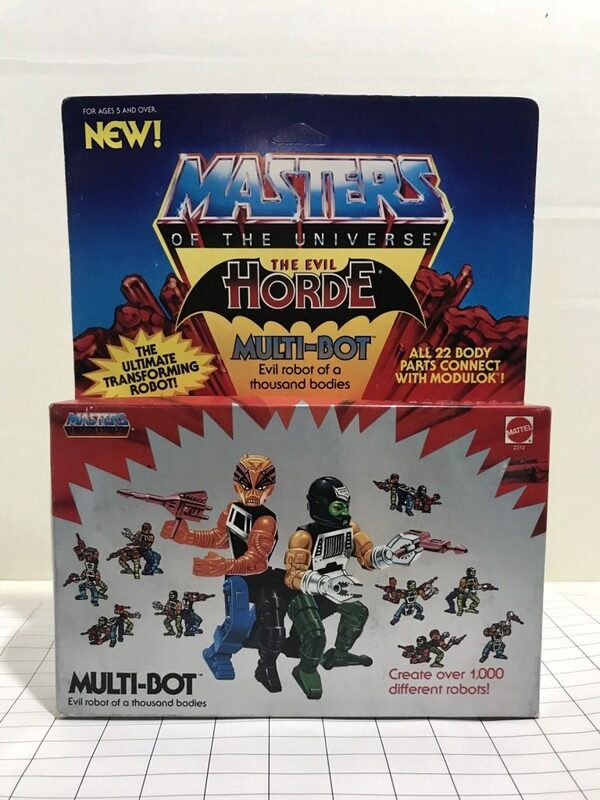 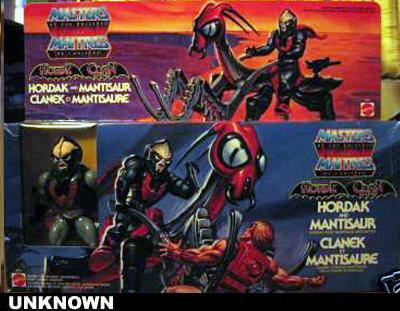 Multi-Bot came in a box very similar to the one used for Modulok, down to the size, shape, and art style. 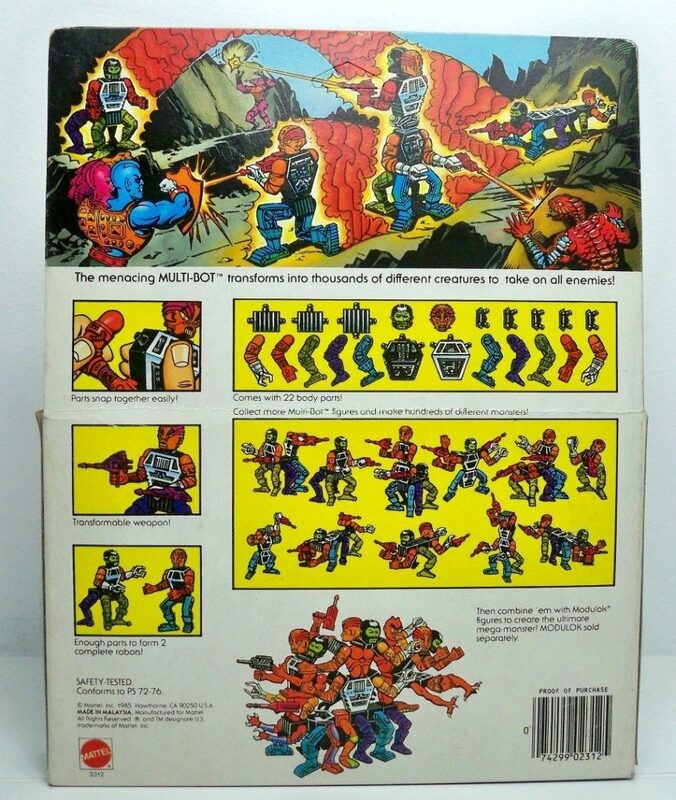 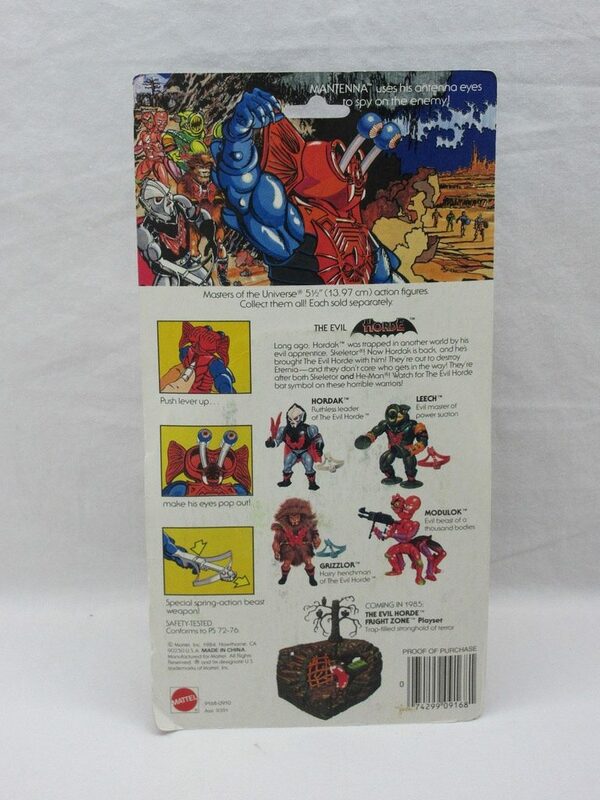 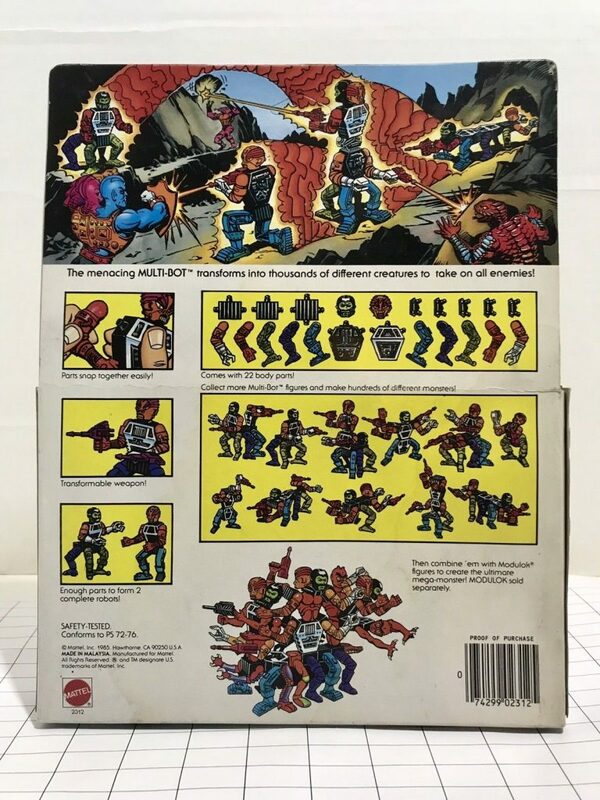 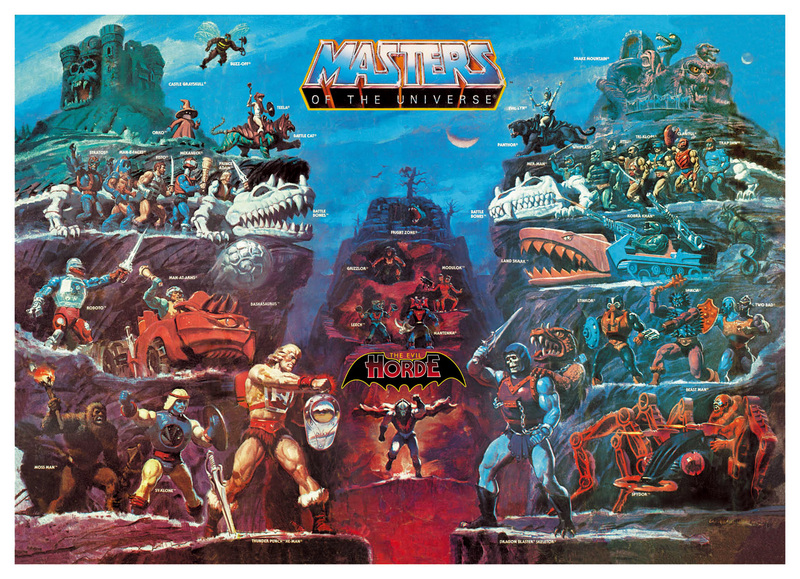 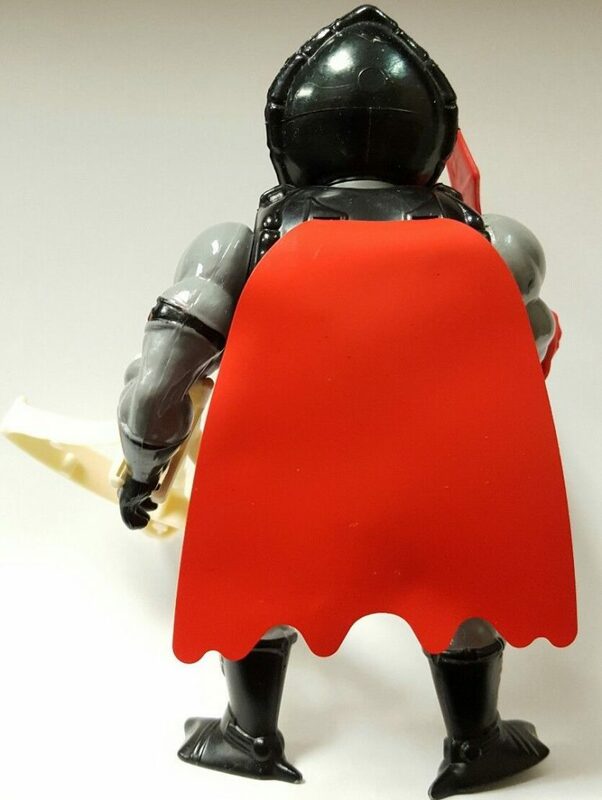 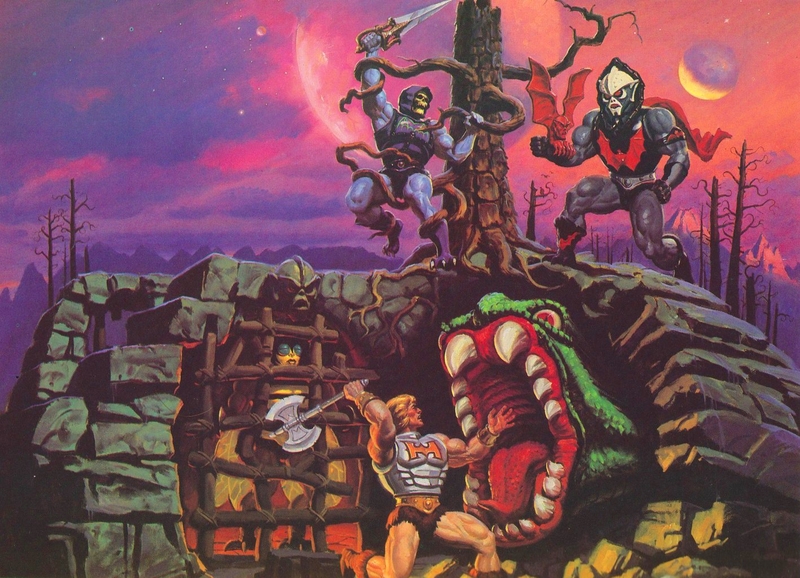 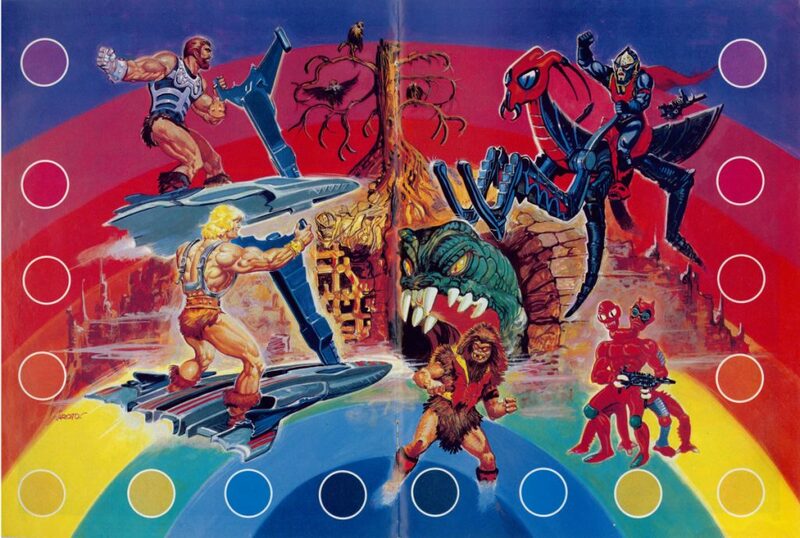 The back features a number of ways to “build” the character, as well as an action scene depicting Multi-Bot transforming while battling Evil Warriors and Snake Men. 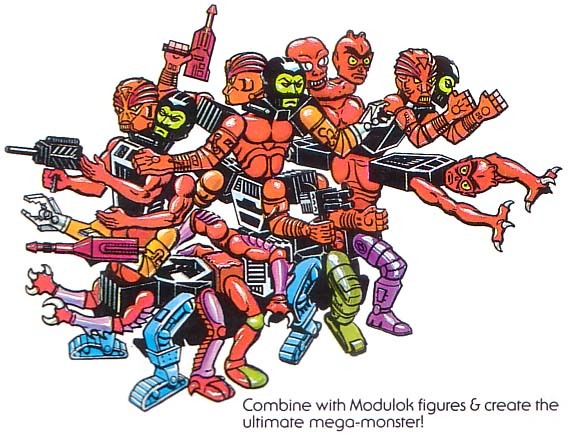 In The Menace of Multi-Bot, we find out that Modulok invented Multi-Bot. 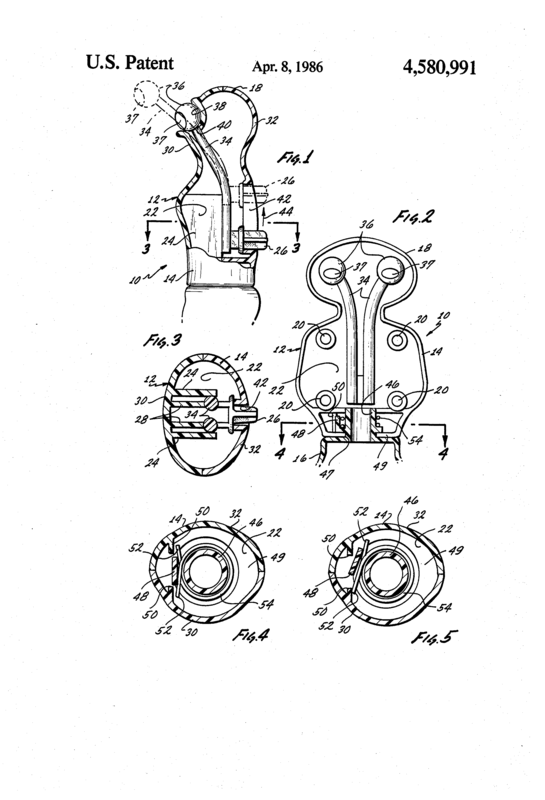 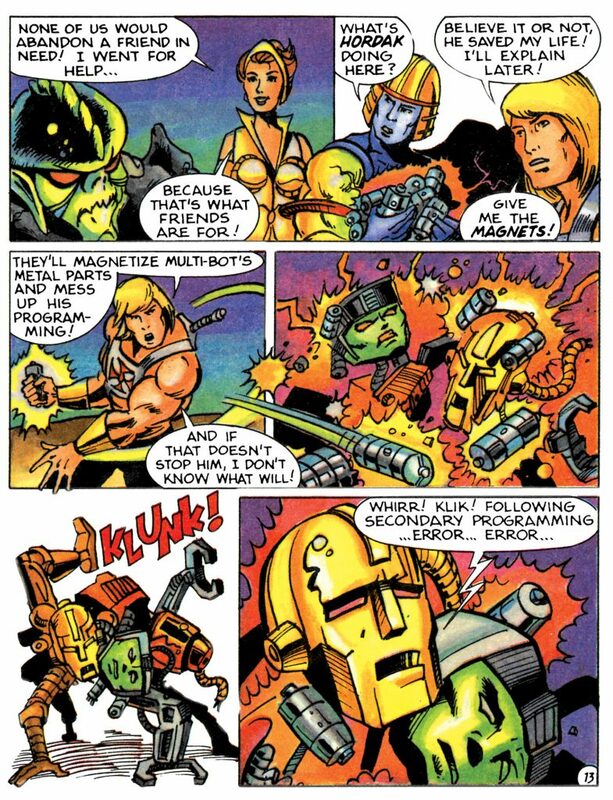 He gives Multi-Bot enormous strength, and the ability to reassemble himself when damaged. 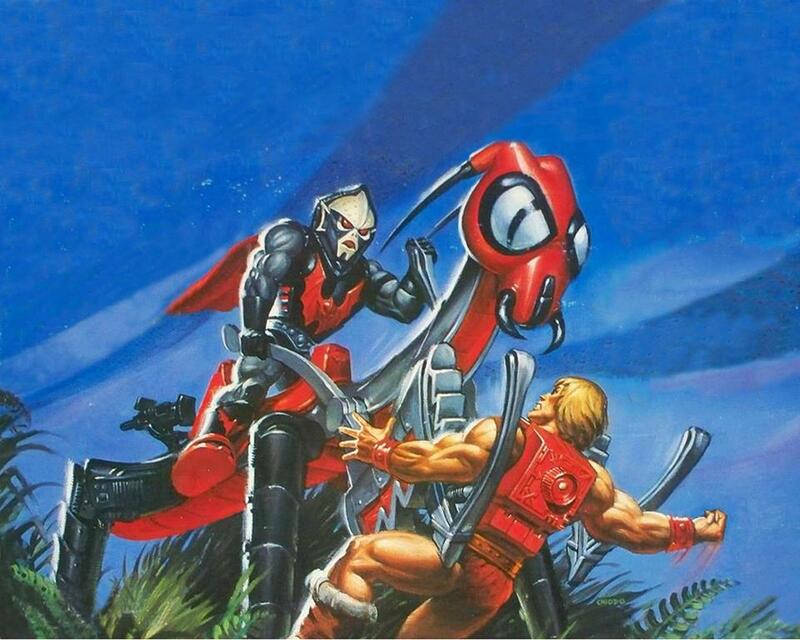 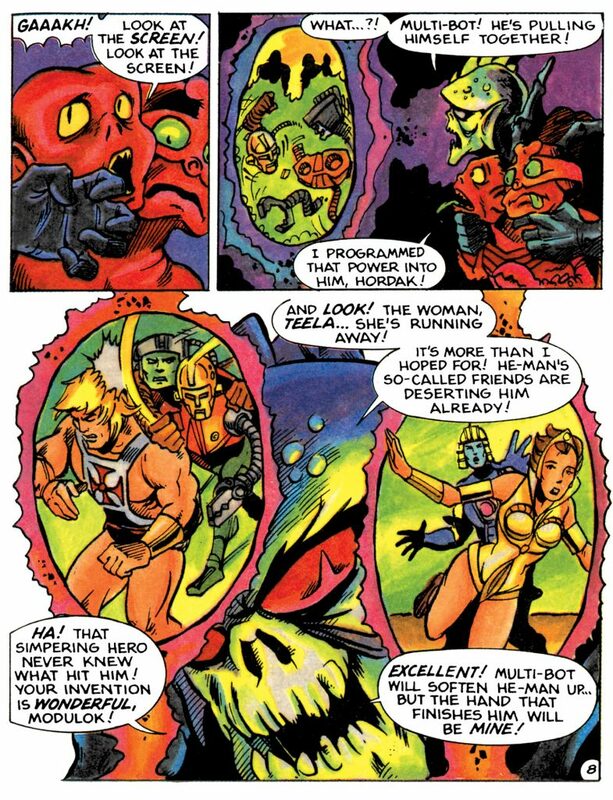 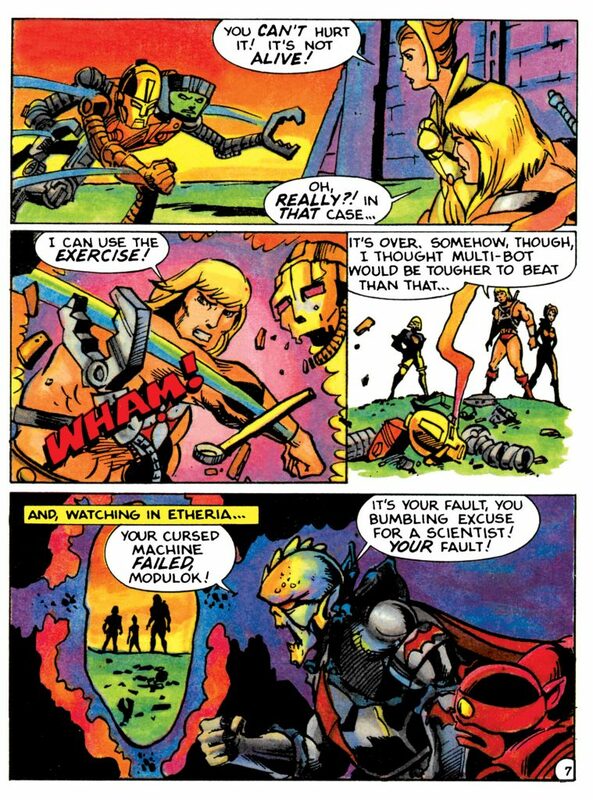 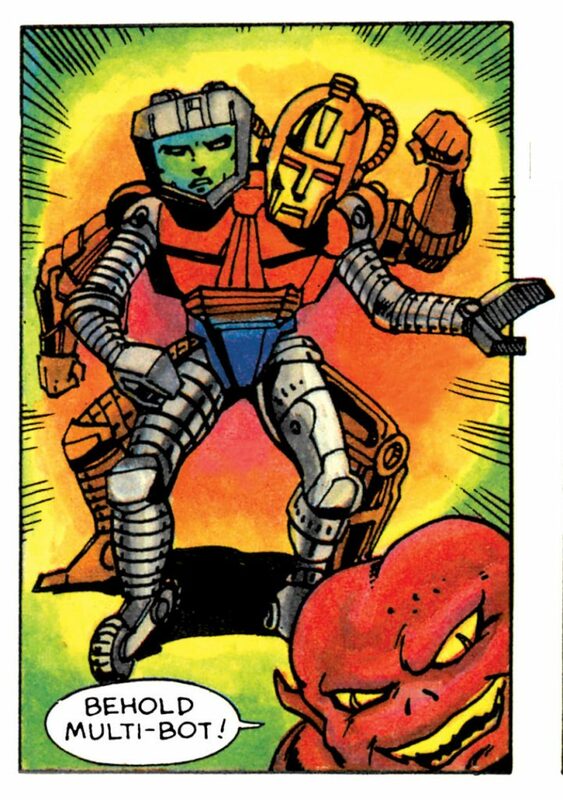 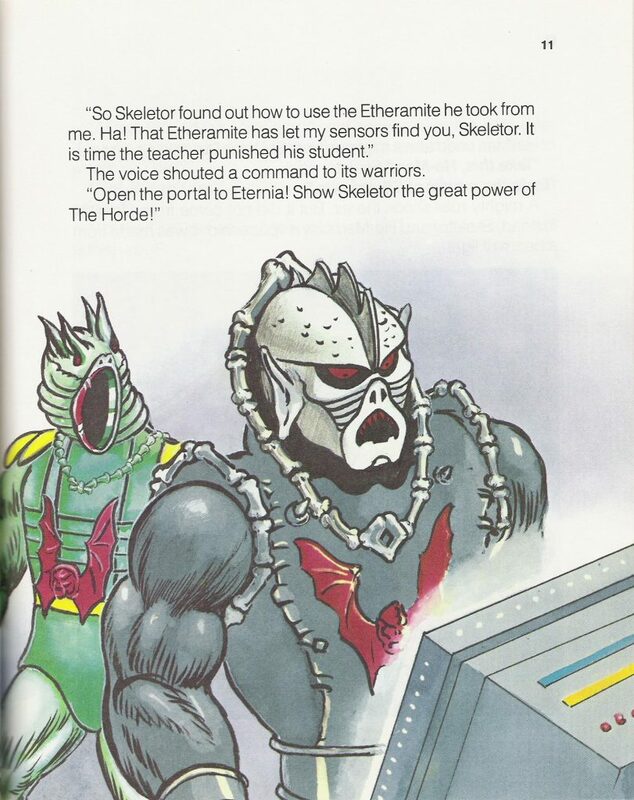 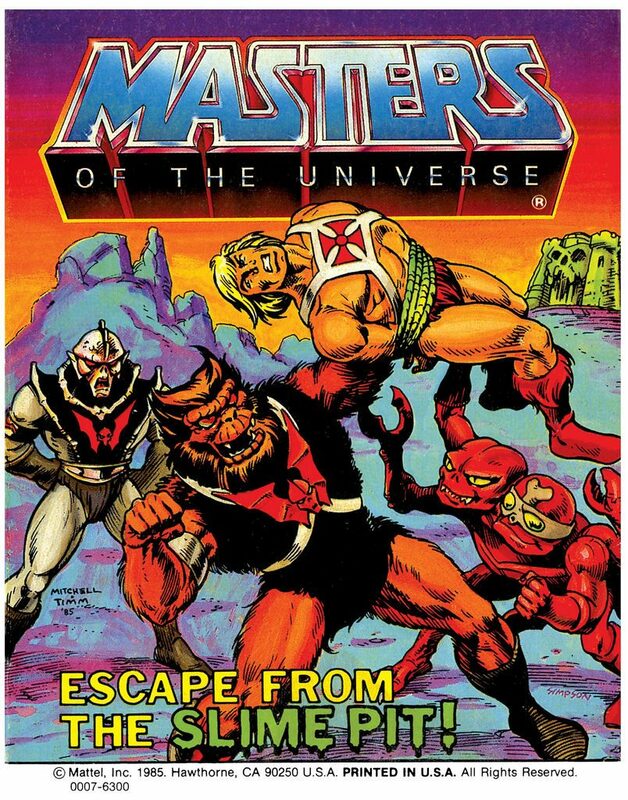 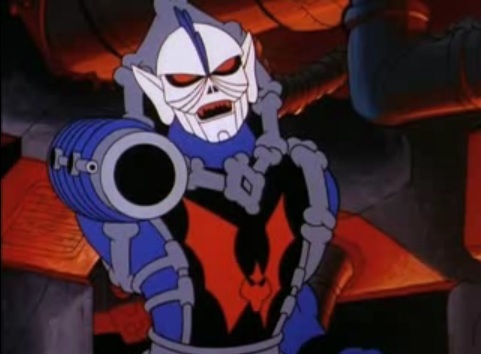 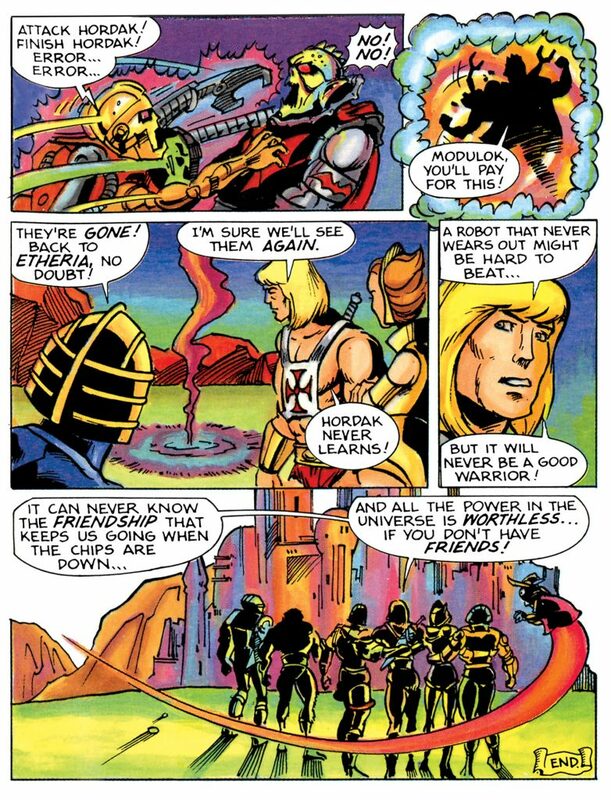 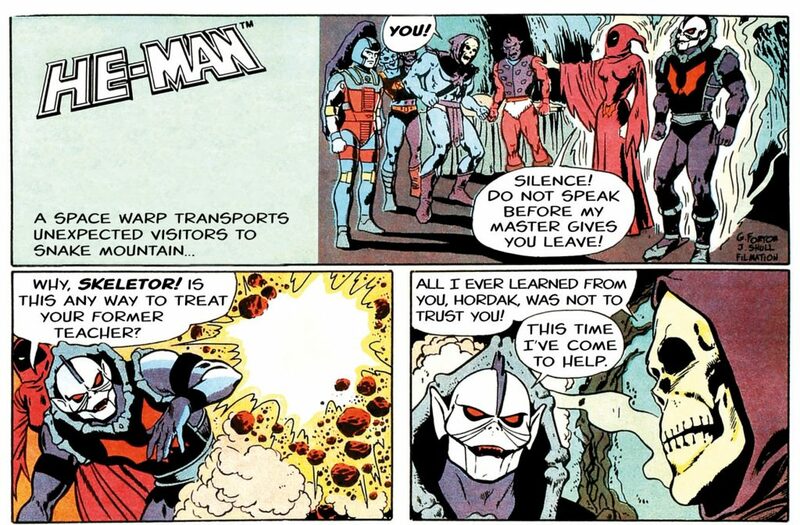 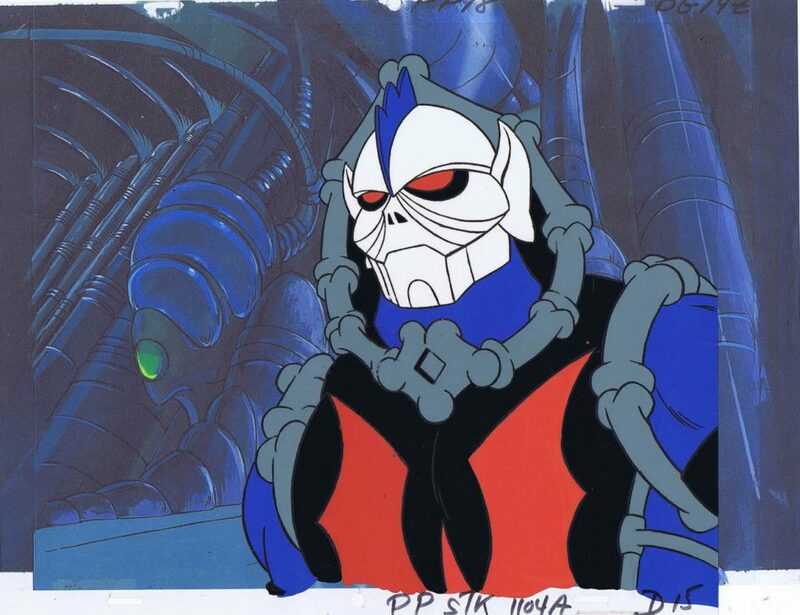 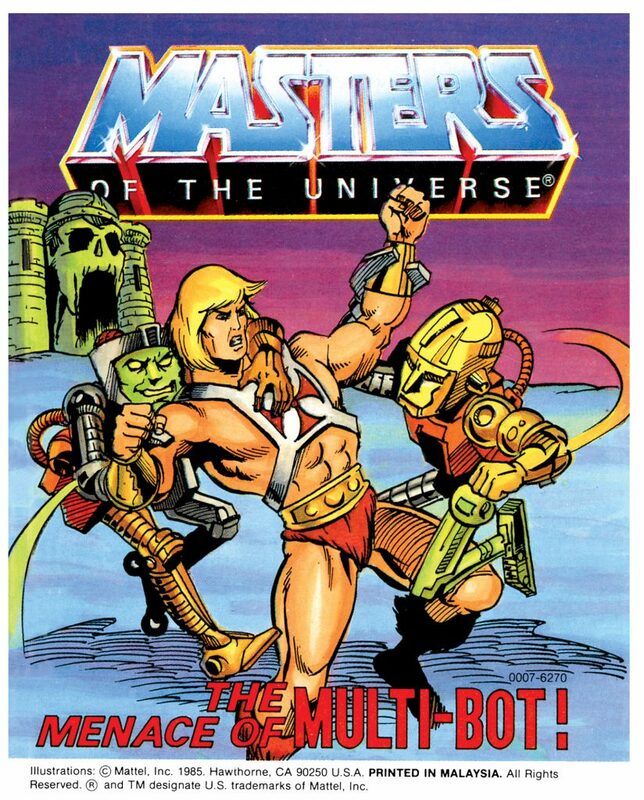 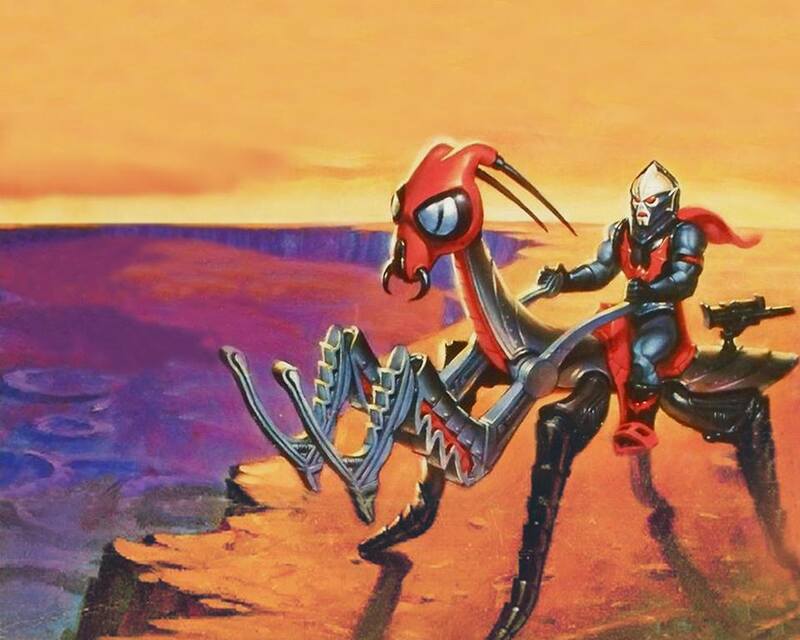 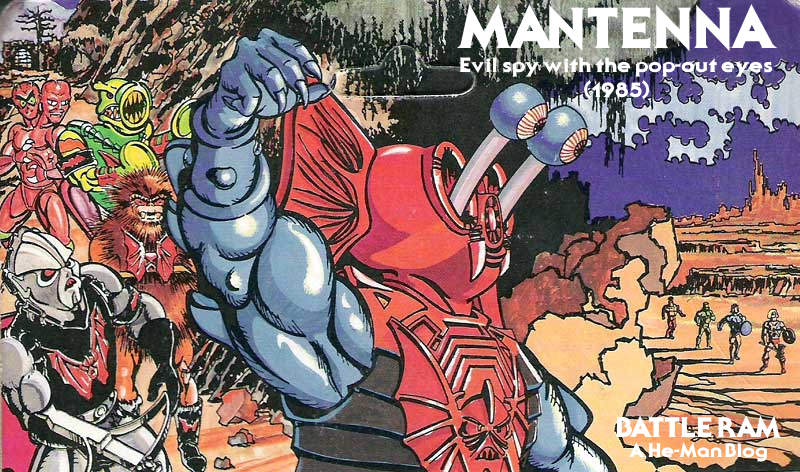 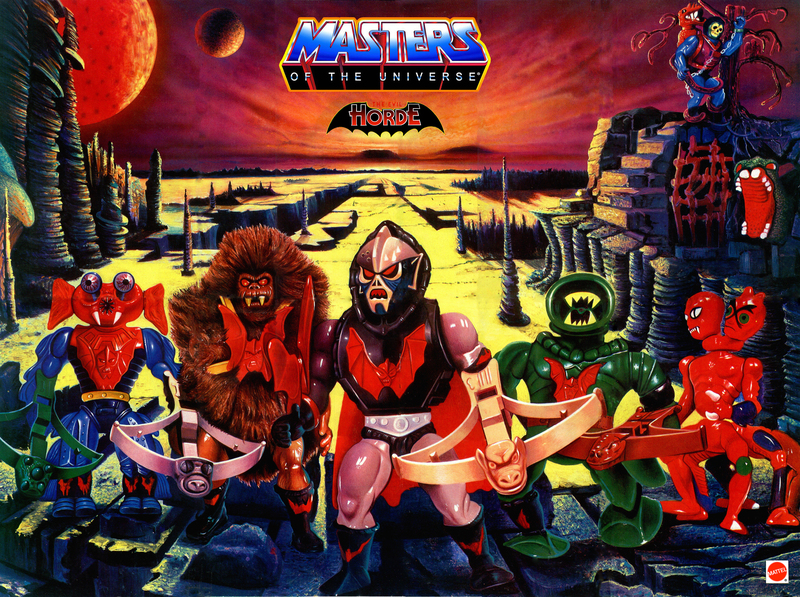 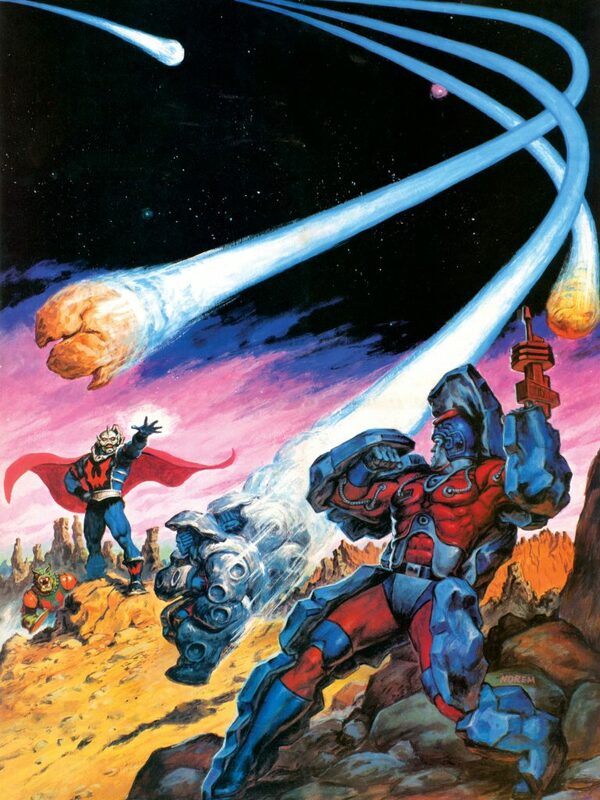 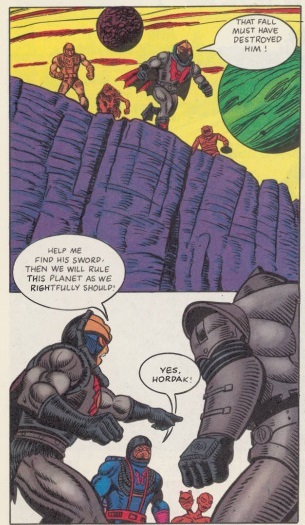 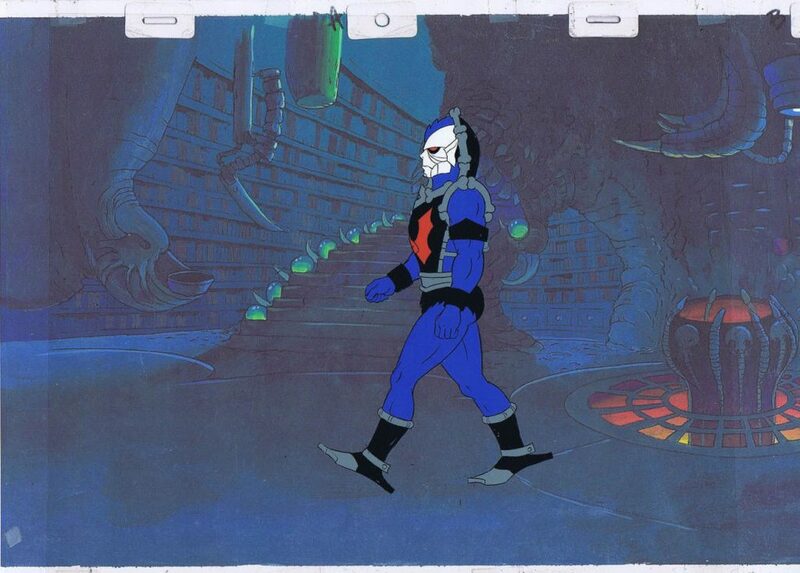 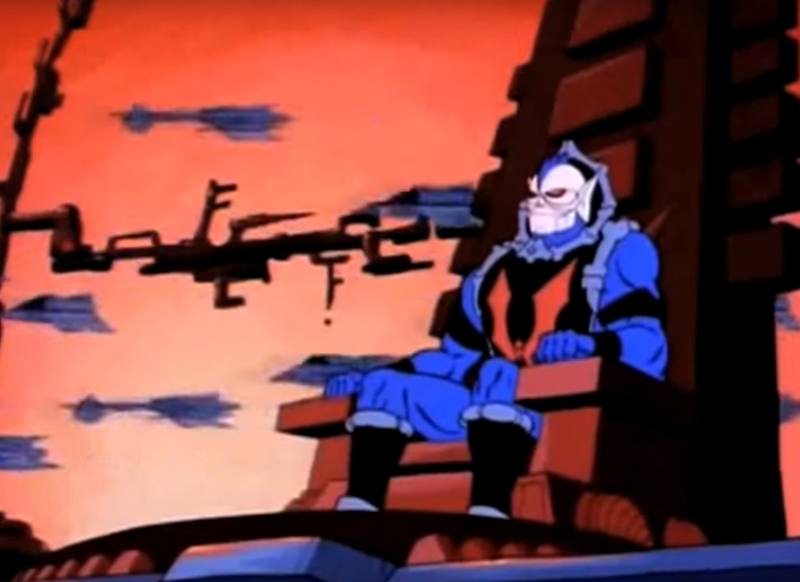 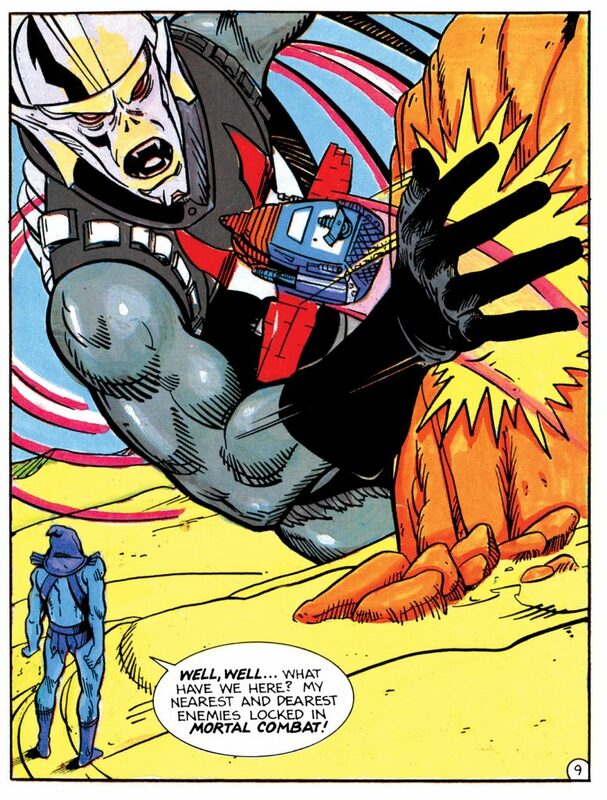 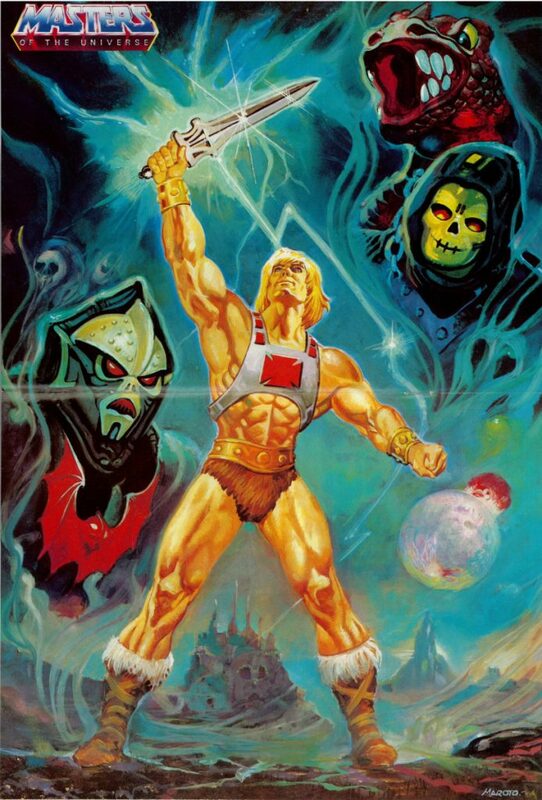 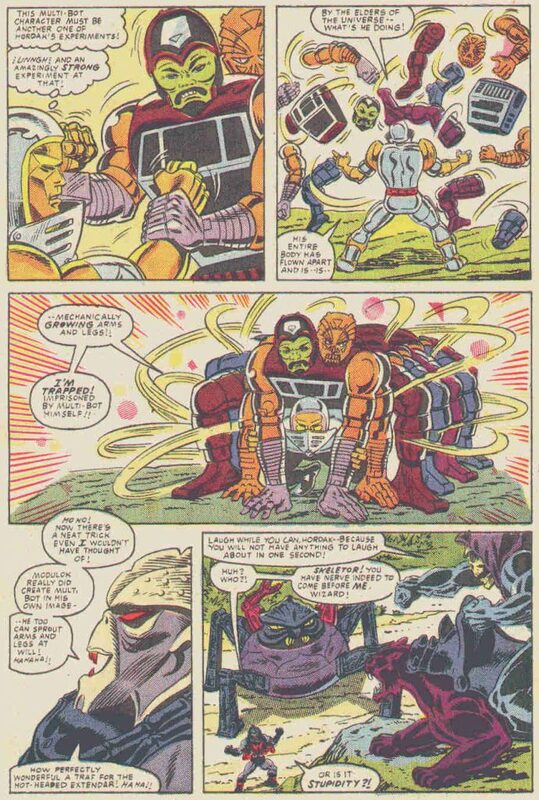 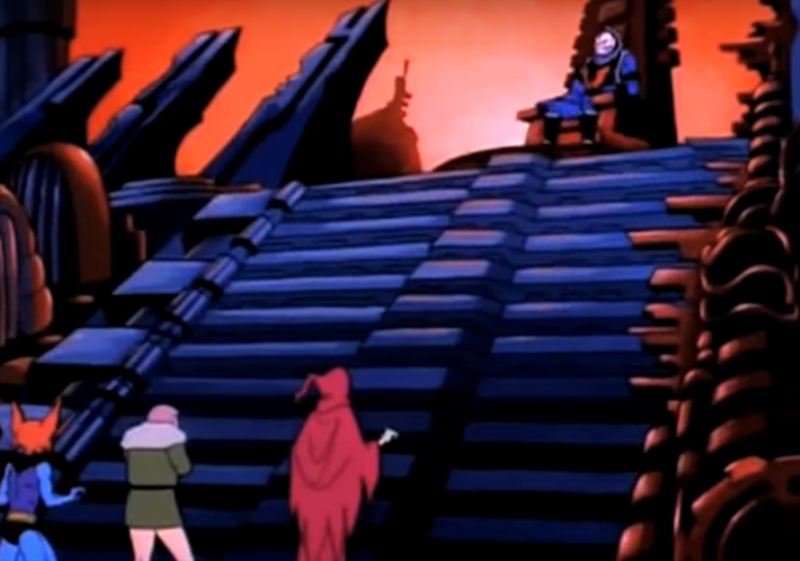 Multi-Bot is sent to Eternia to challenge He-Man (with a secret plan to attack Hordak after He-Man was defeated, allowing Modulok to take charge). 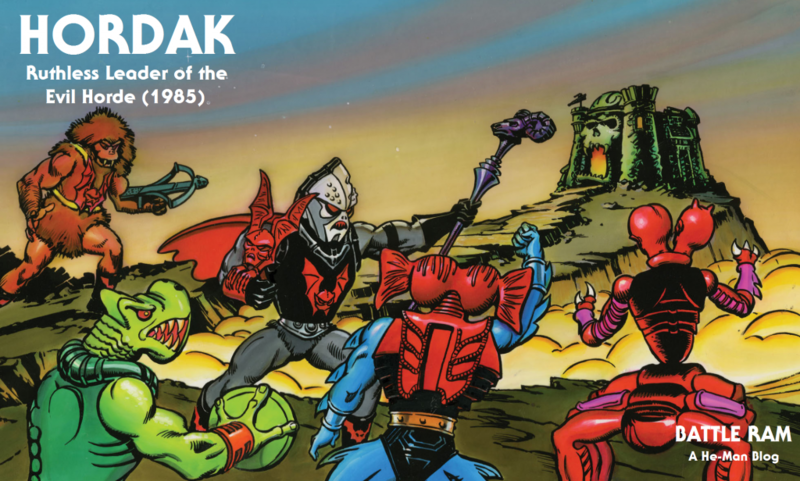 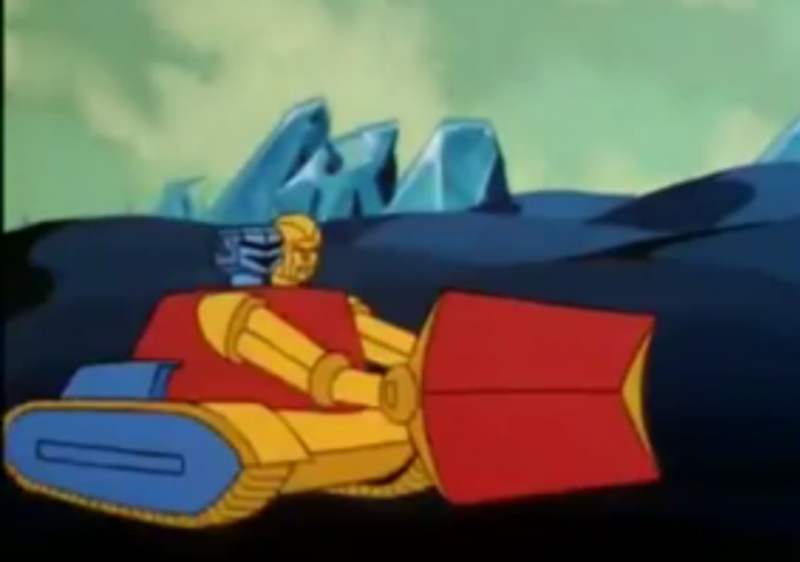 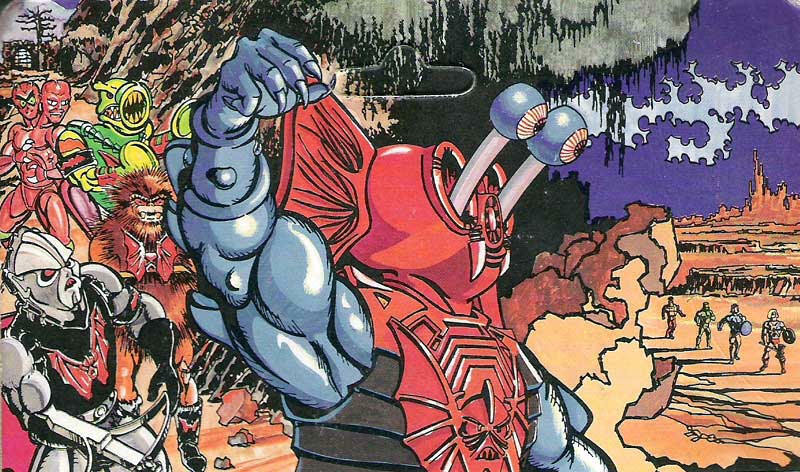 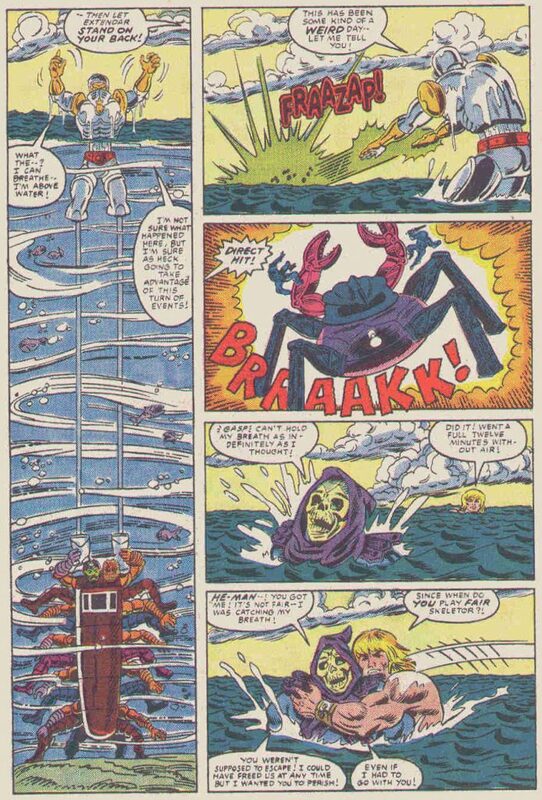 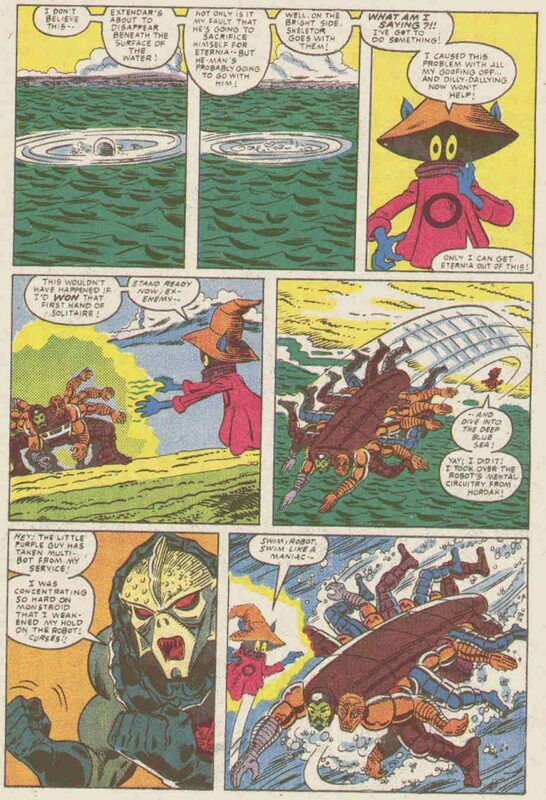 Later in the story, Multi-Bot tussles with Extendar, but in the end Orko forces him to save Extendar from drowning. 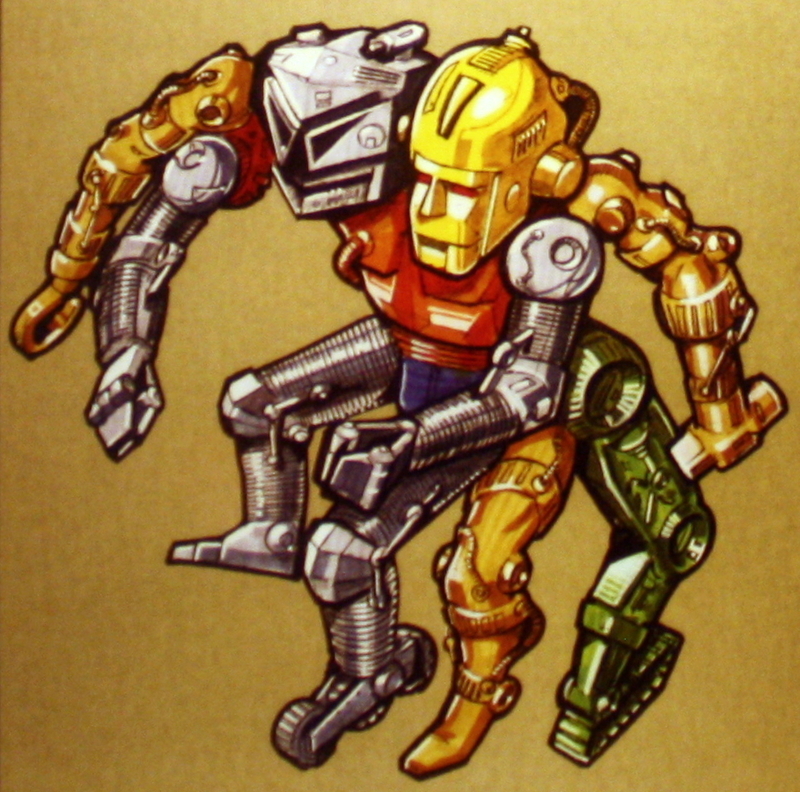 Notice that Multi-Bot is given a goatee, which seems to stem from a misinterpretation of the source material. 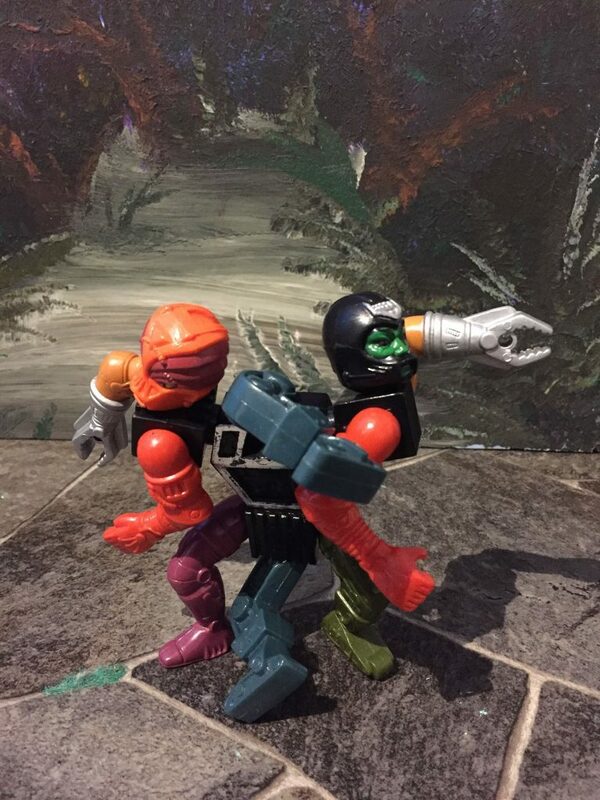 Øyvind Meisfjord has graciously shared the following images and video of Multi-Bot in action! 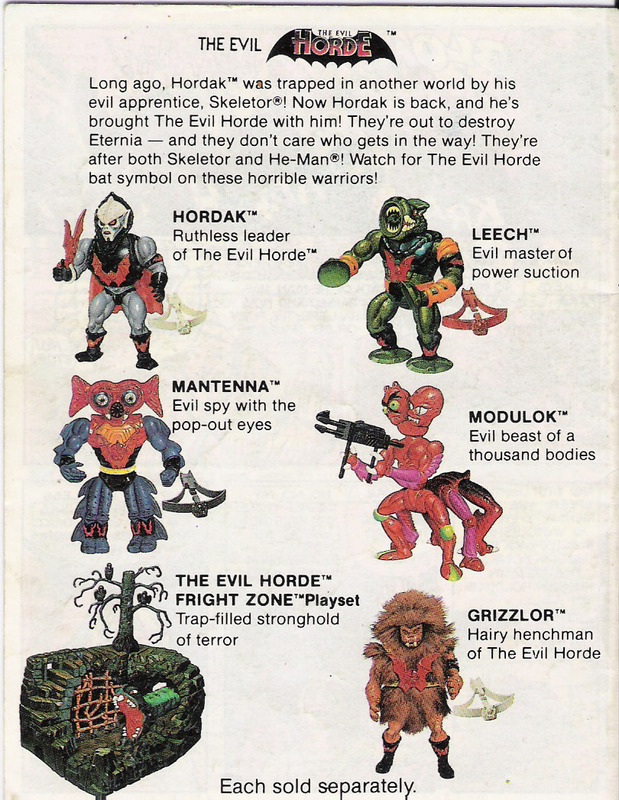 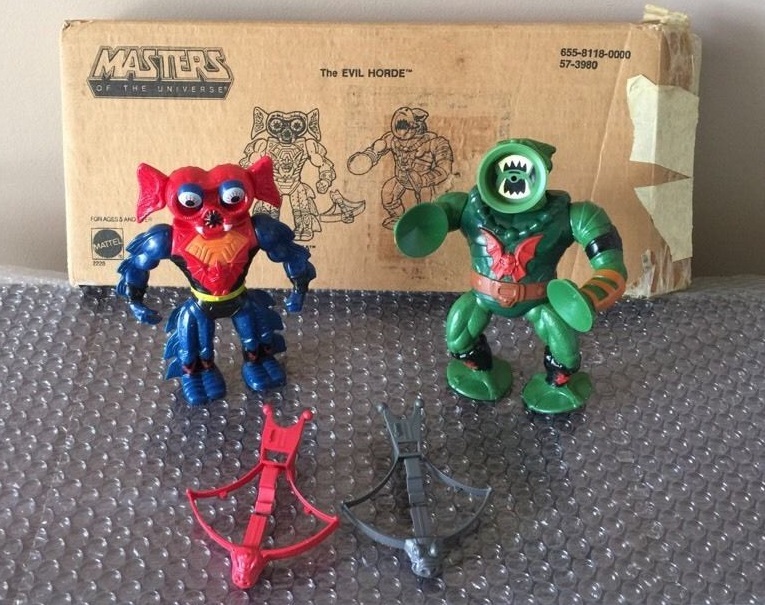 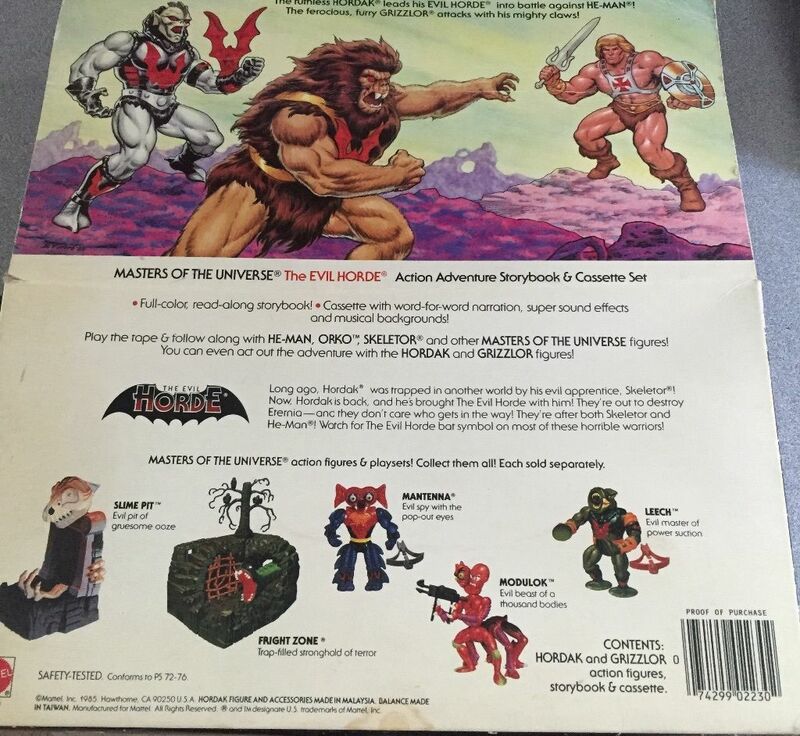 I didn’t own Grizzlor as a kid, but my brother did, and (I got Leech and Mantenna at about the same time). 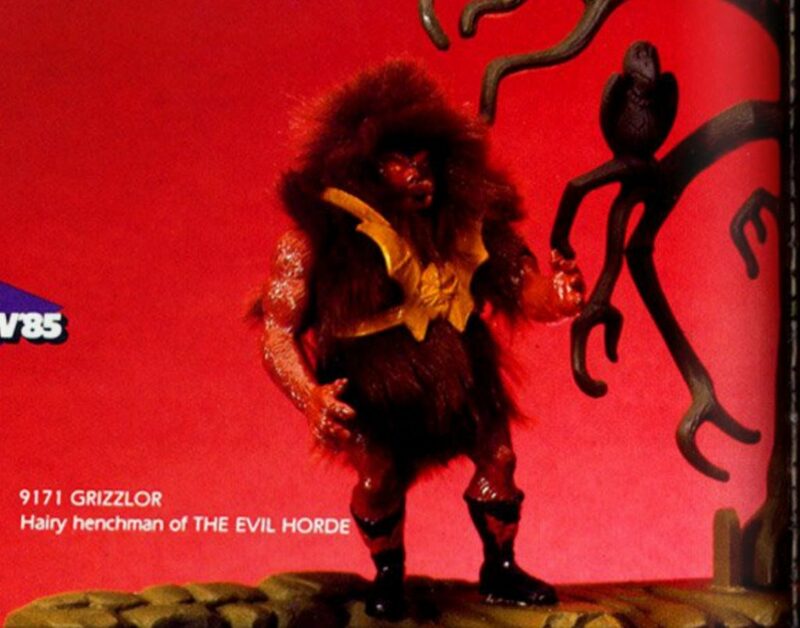 Grizzlor is simultaneously hilarious and creepy, with his wild furry body and his vicious-looking face, like a cross between a Troll doll and mutant bear. 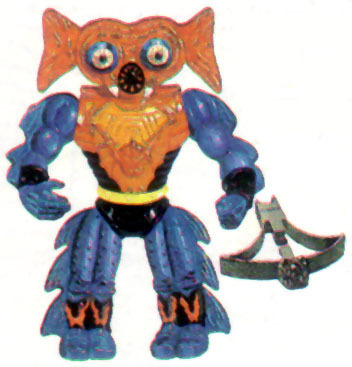 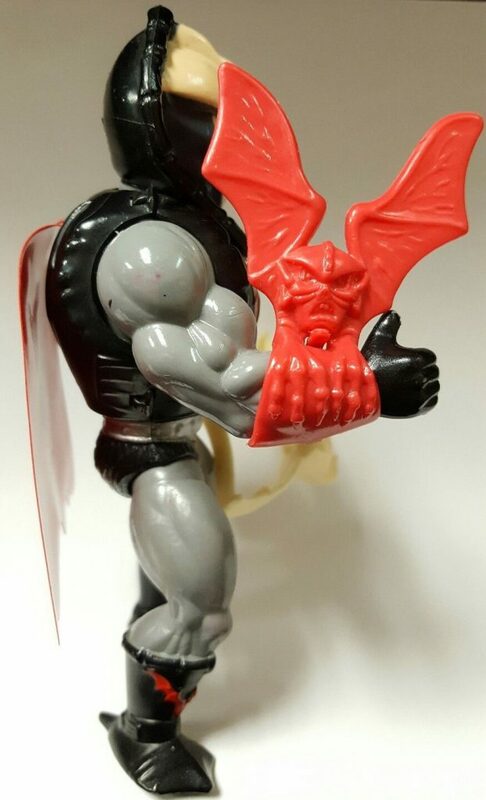 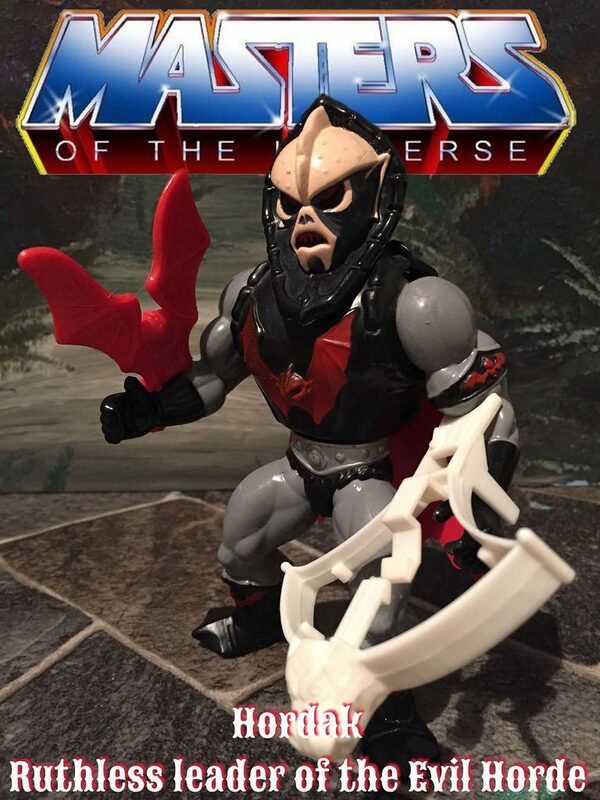 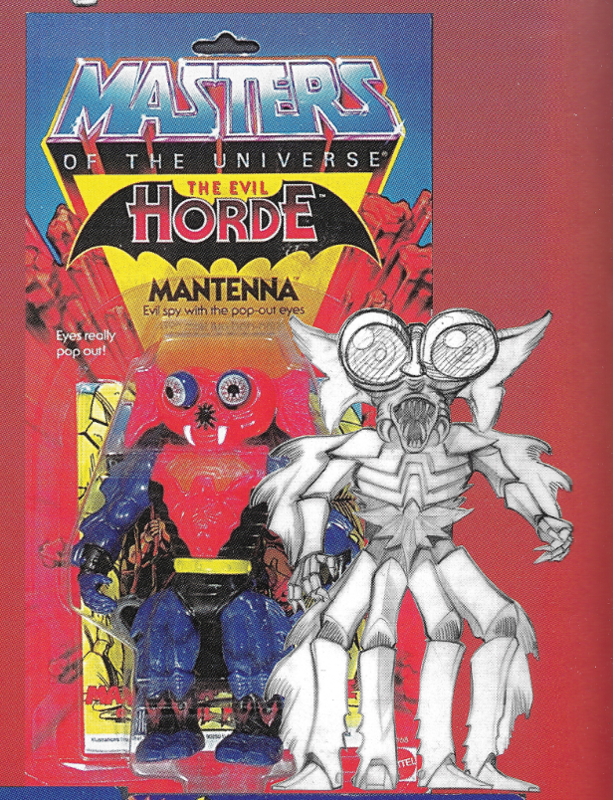 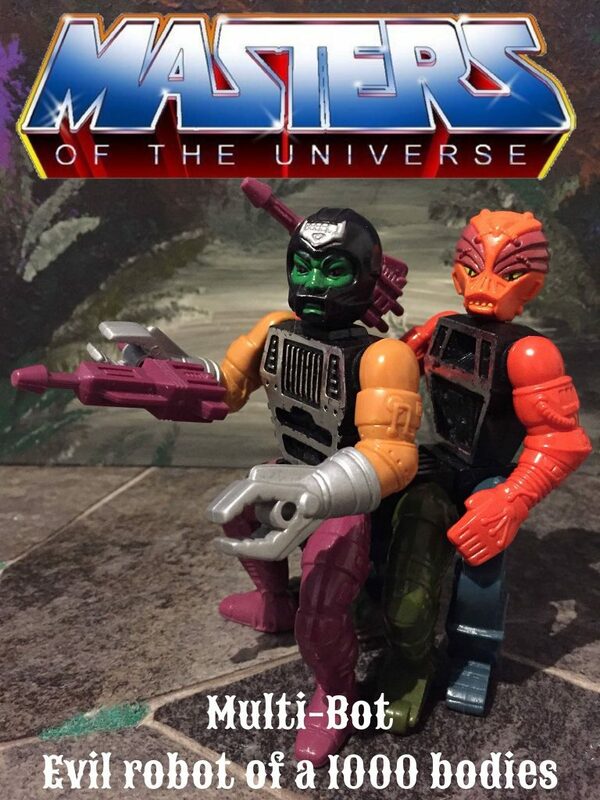 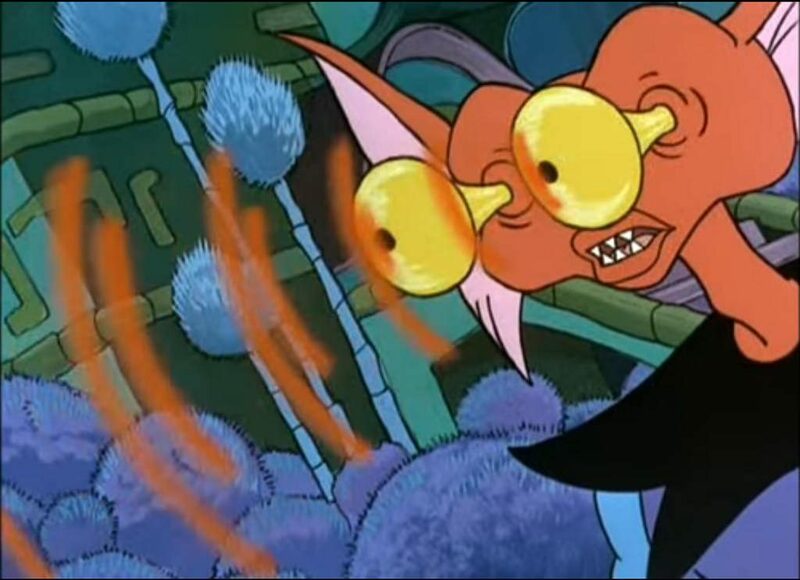 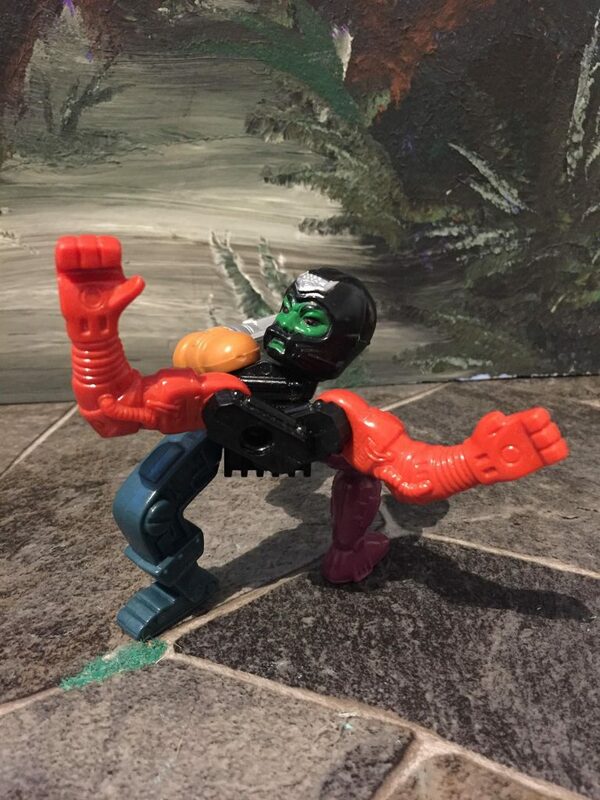 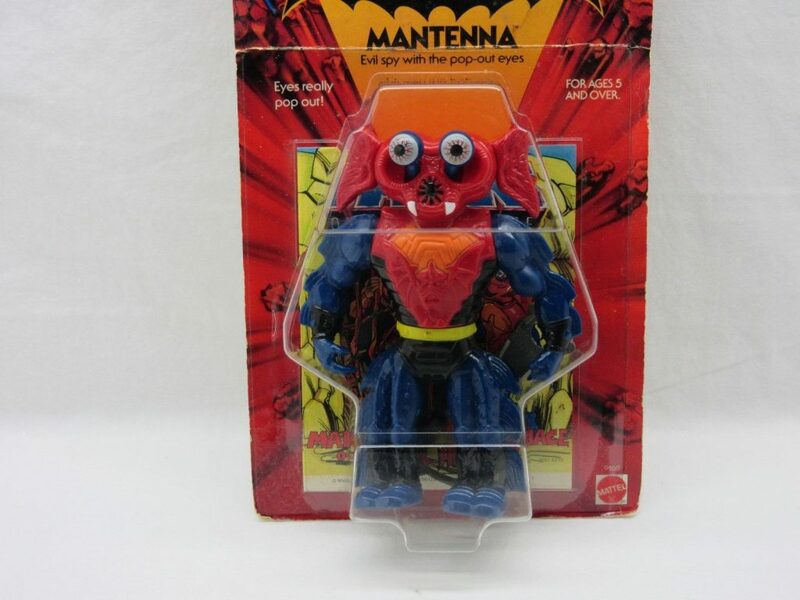 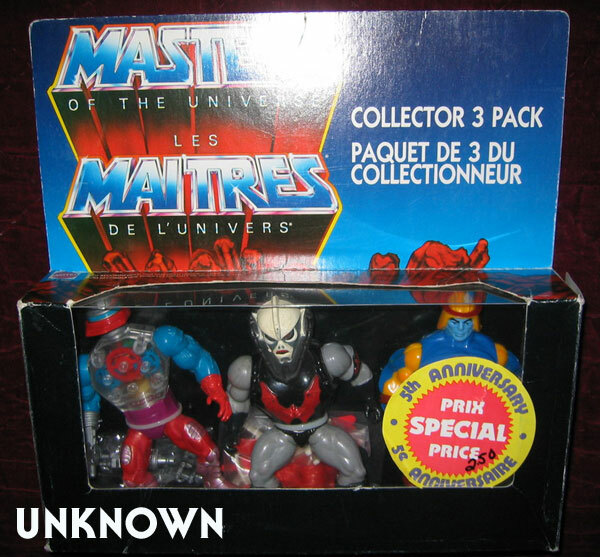 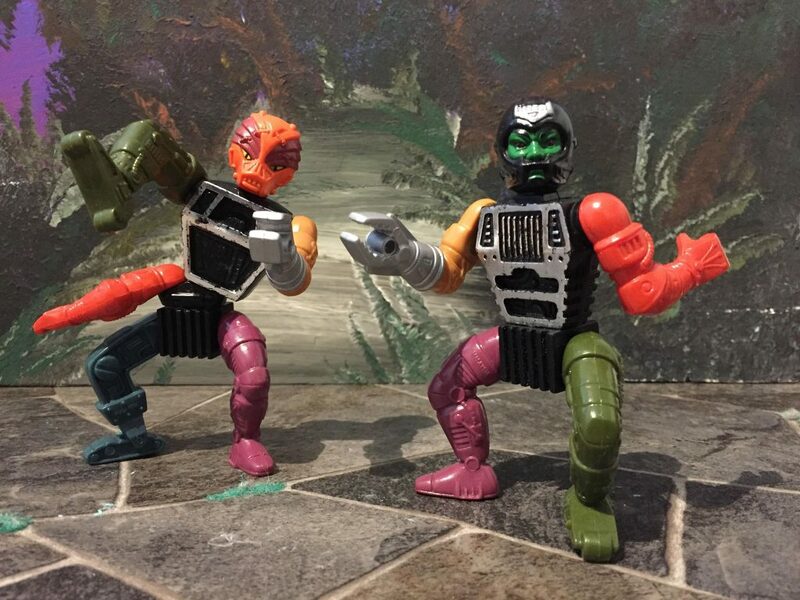 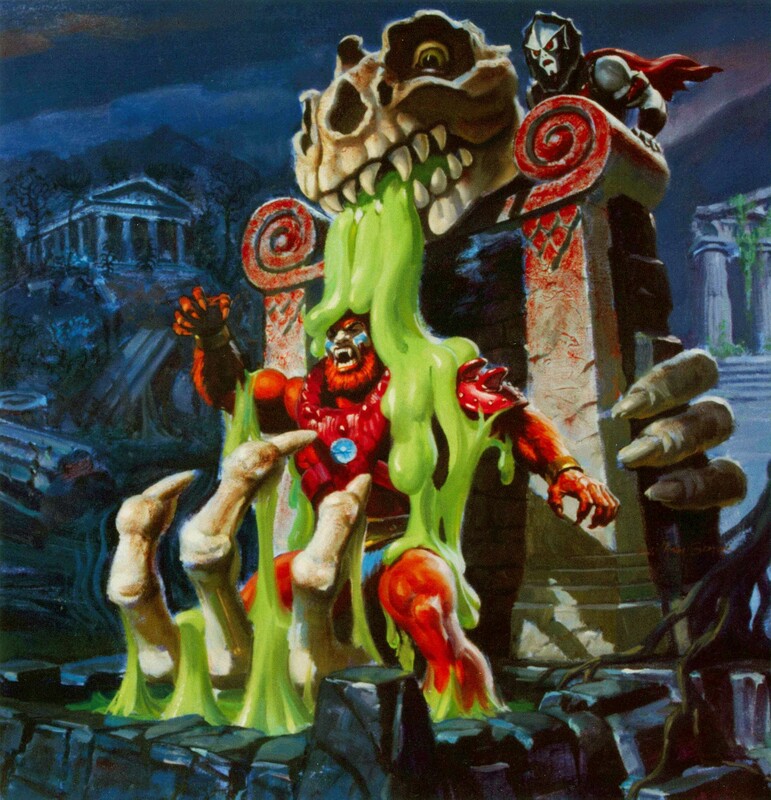 With a predominantly brown color scheme, he’s actually one of the least colorful characters in the MOTU universe, but he certainly “pops” in other ways. 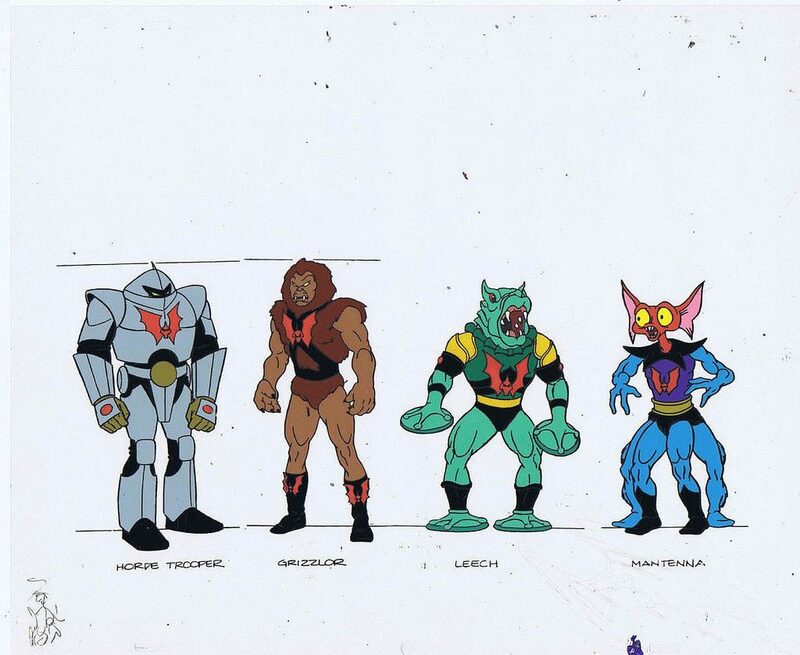 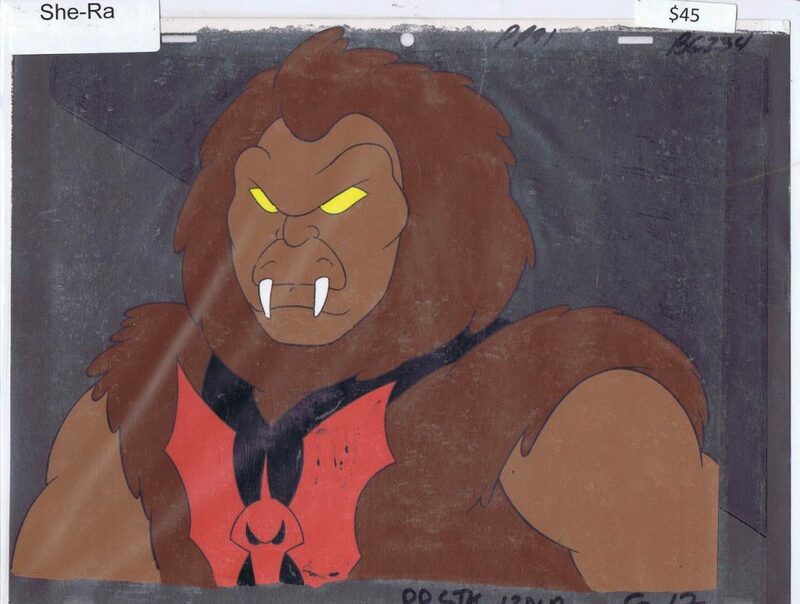 Grizzlor seems to have originated at Filmation. 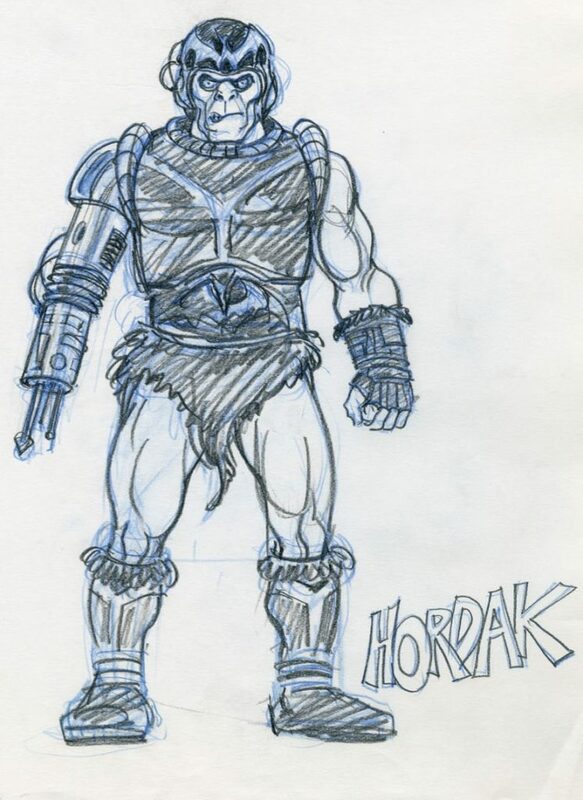 Several years back The Power and the Honor Foundation shared an early development image, reportedly created by Curtis Cim. 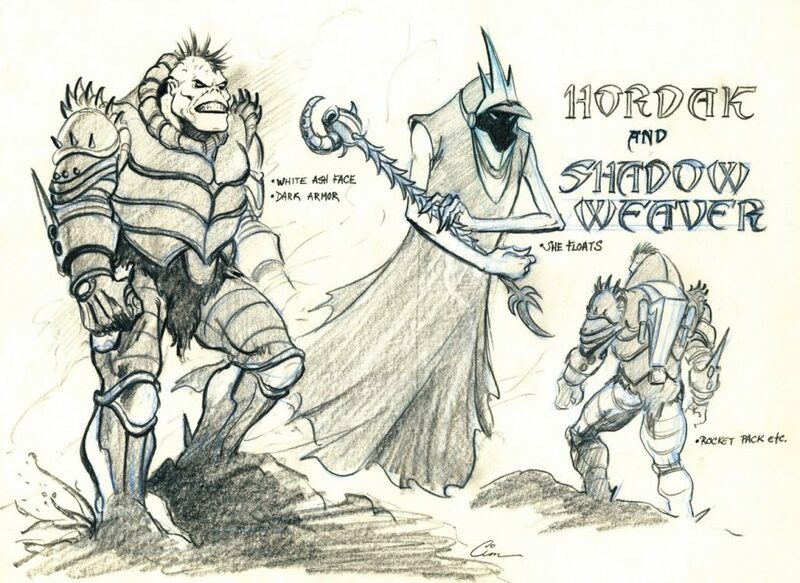 The concept (below) is already quite well developed. 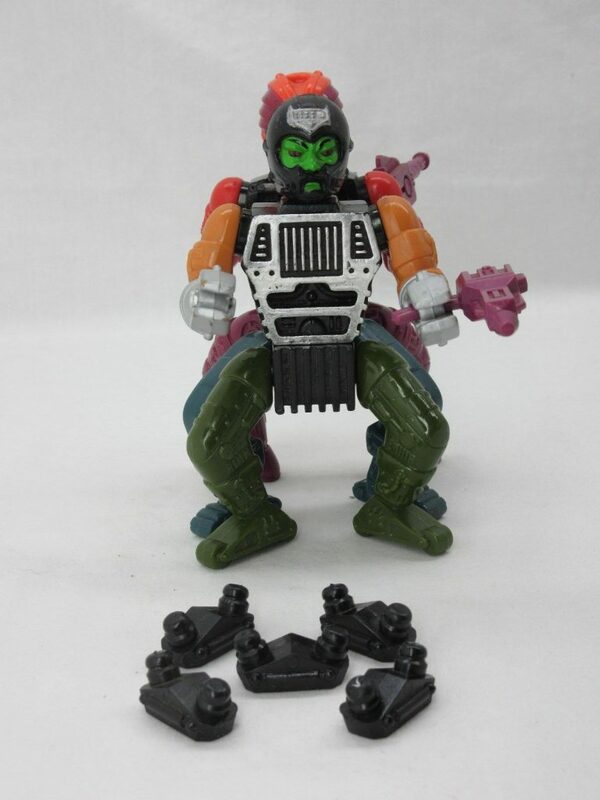 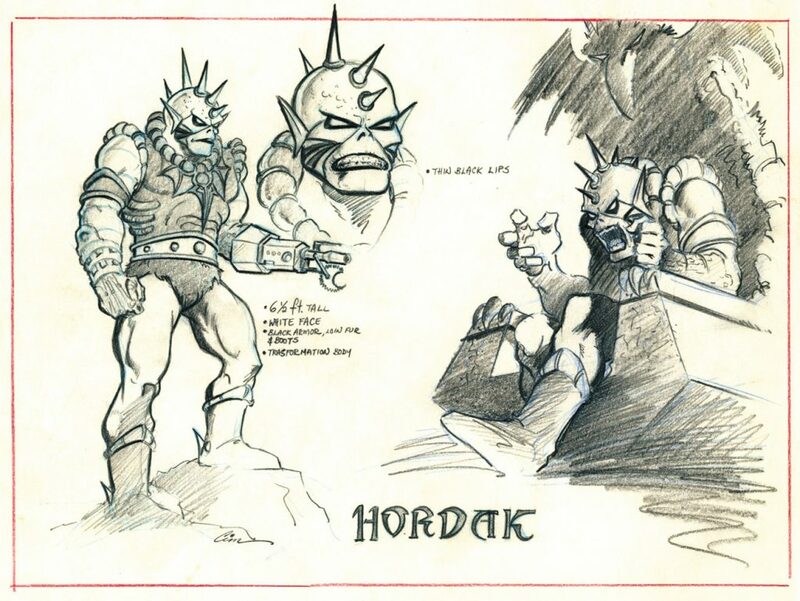 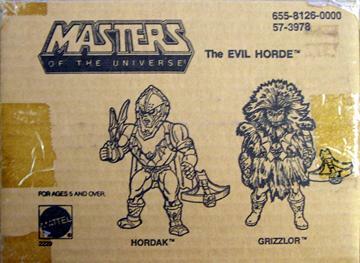 Grizzlor wears an early version of the Horde insignia, some extra spikes, and sports five fingers, but otherwise he looks very close to his finished form. 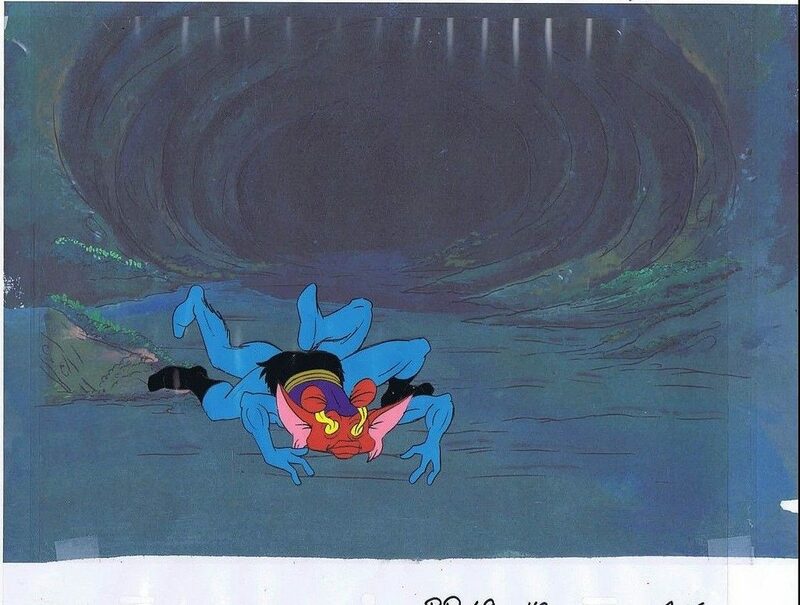 Image source: The Power and Honor Foundation. 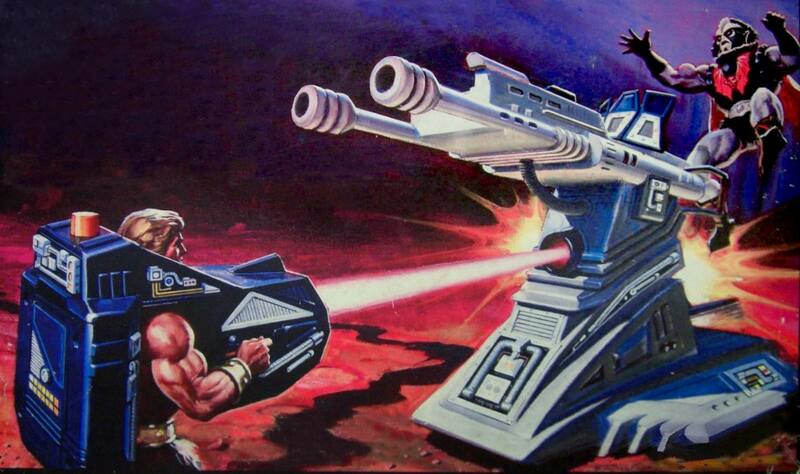 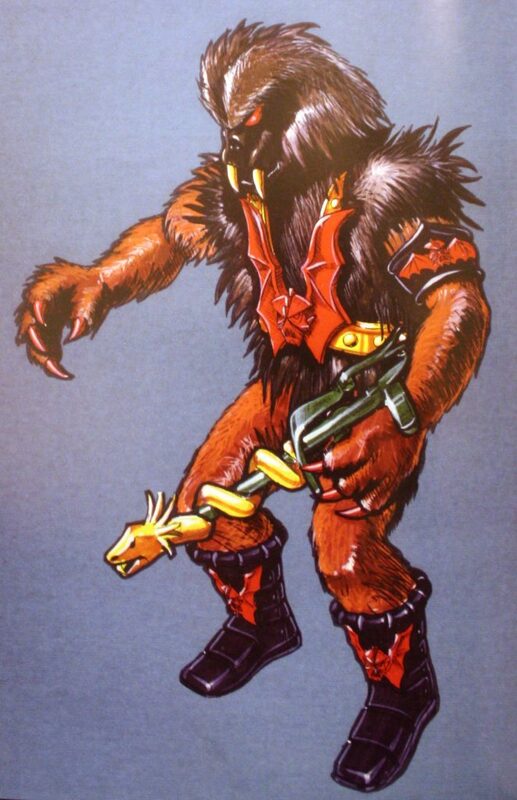 Shared by Dusan M.
In another image from The Power and the Honor Foundation, we see Grizzlor in full color as depicted by Ted Mayer. 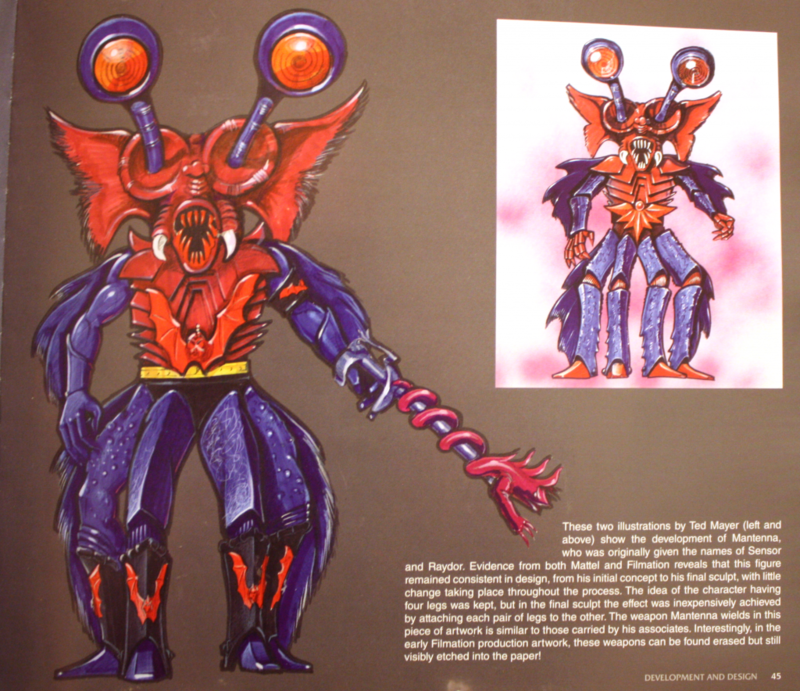 He looks very close to his final toy form, except that he is holding a rather strange-looking ornate weapon. 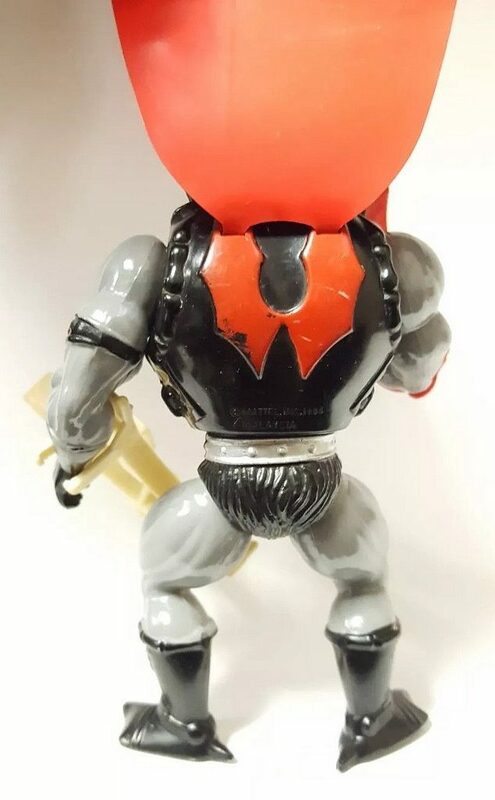 His face is quite a dark black/brown, which is how some version of the toy were colored, although most were produced in a lighter brown color. 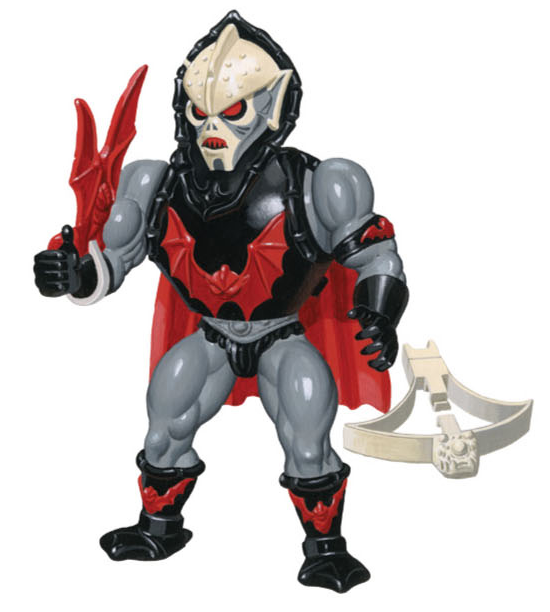 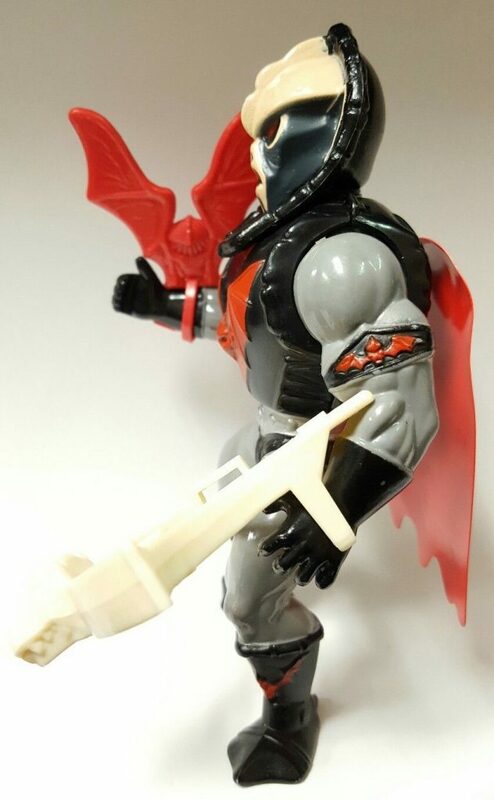 In this version he has two visible, prominent fangs, a hallmark of the look of the action figure. 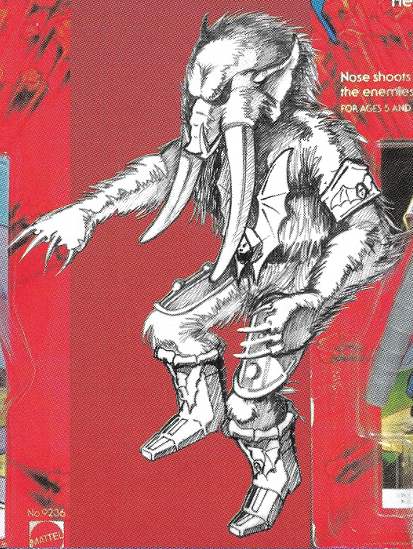 The other thing about the Horde Mammoth character is he has no trunk. 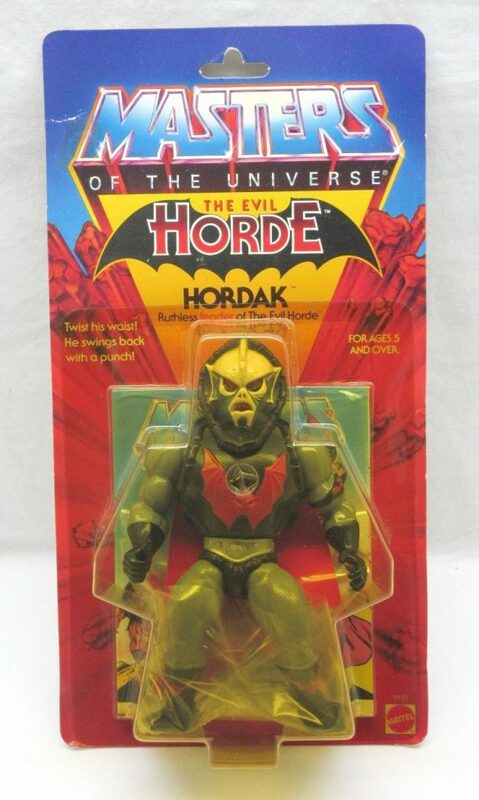 Other than the tusks, he looks quite like a wild boar. 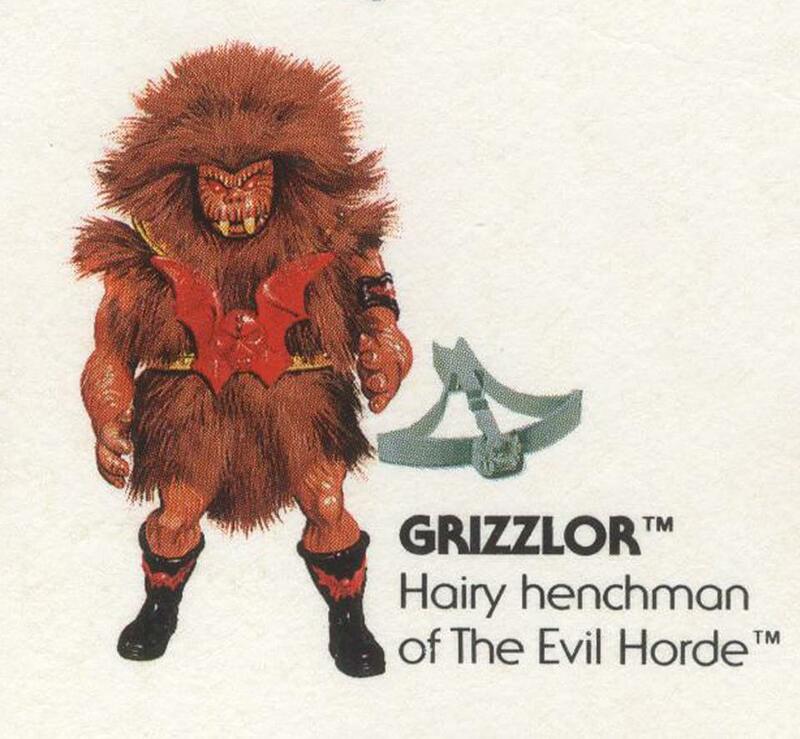 Grizzlor is described as a “wild boar” in the 1987 Style Guide, prompting both of us to wonder if these characters aren’t quite closely connected. 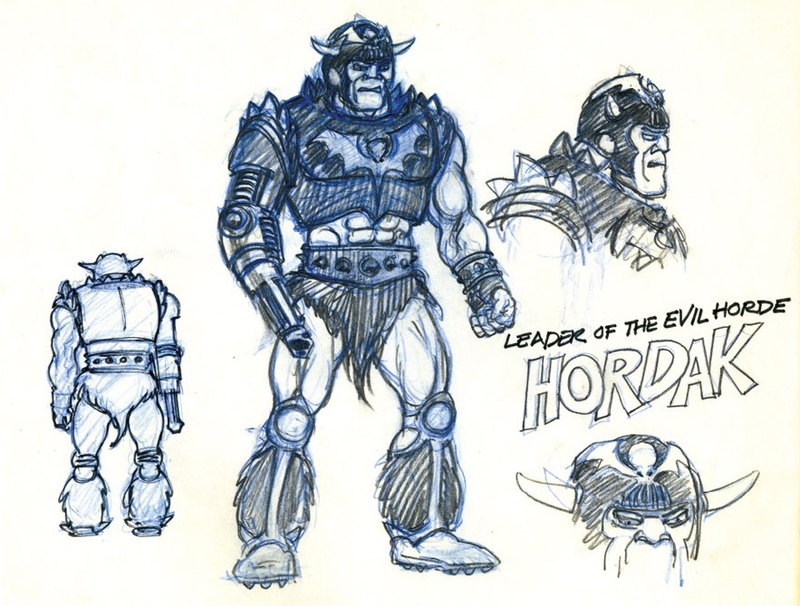 The Style Guide is discussed in more detail later in this post. 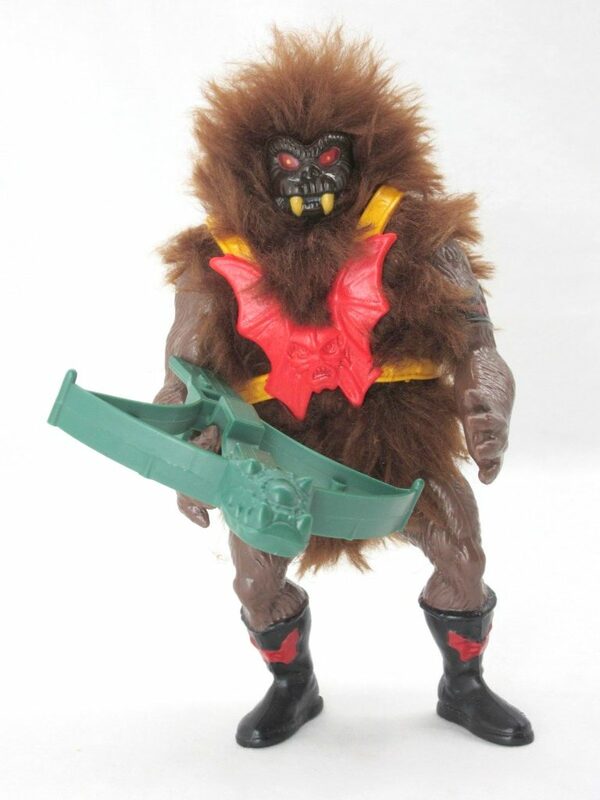 As mentioned earlier, the most common version of the toy was produced with light brown molded plastic, and there was a rarer, darker version that took after Ted Mayer’s depiction. 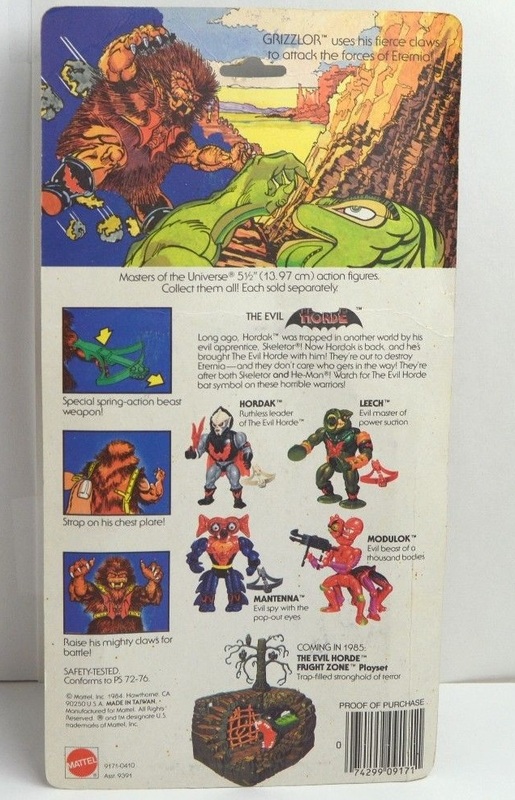 Both versions came with a green Horde crossbow with its spring-action gimmick. 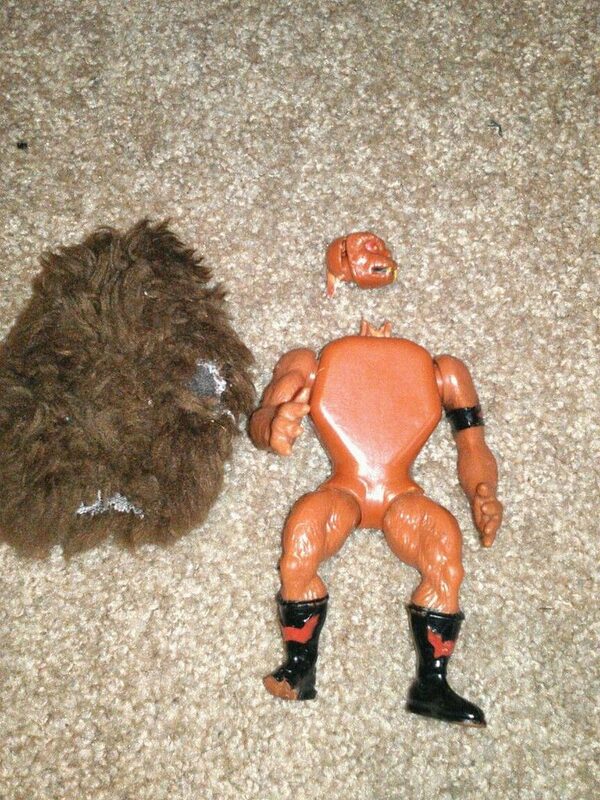 Due to his action feature (if you can call mounds of fur an action feature), he lacked waist articulation. 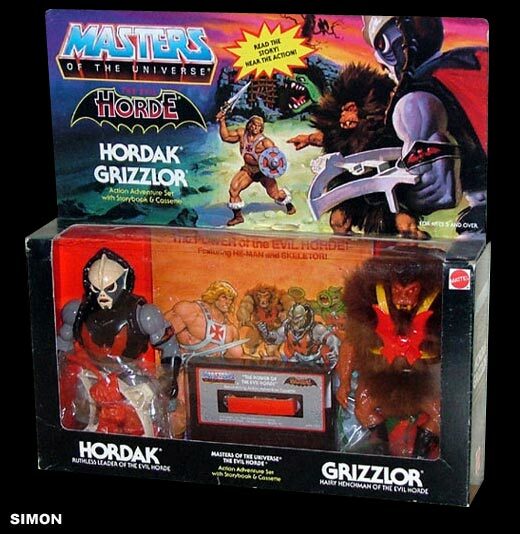 Grizzlor’s cross sell art depicts the more common version of the figure. 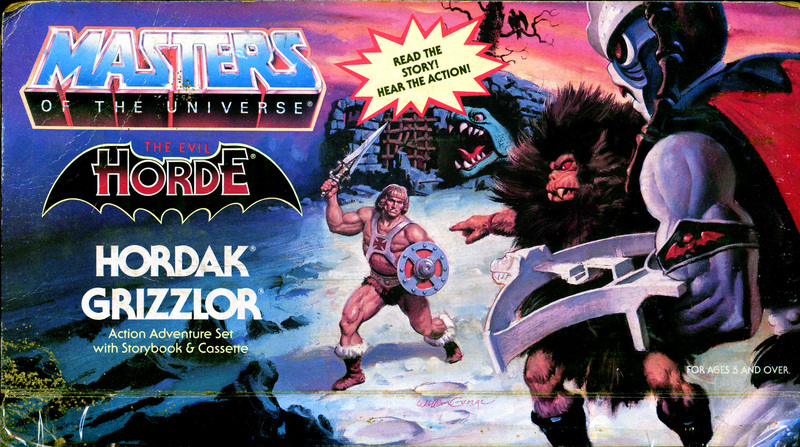 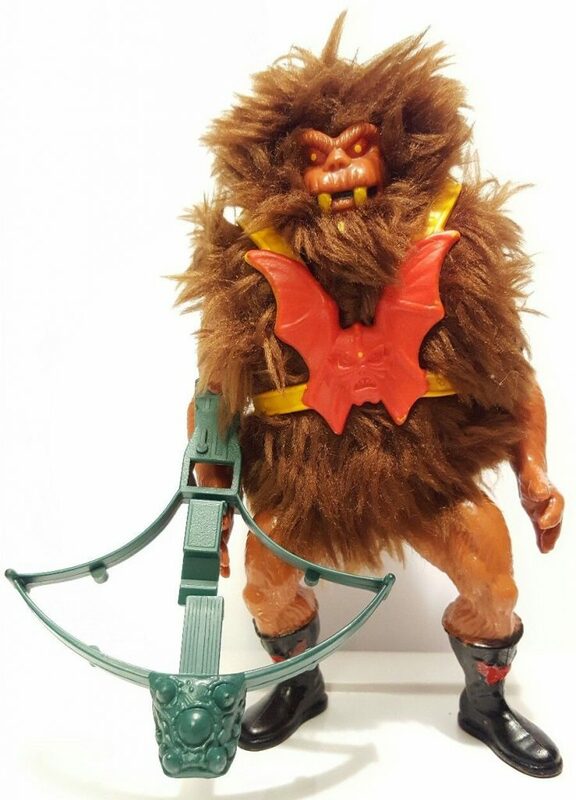 Note that Grizzlor’s unique crossbow appears in white here, rather than the final green. 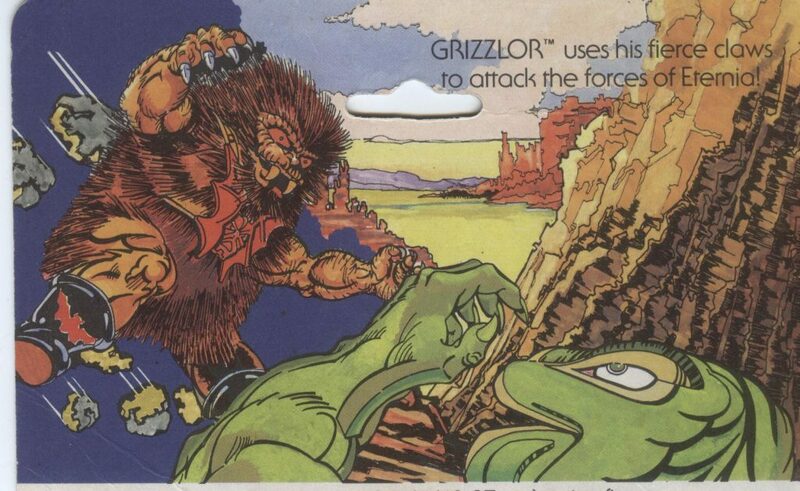 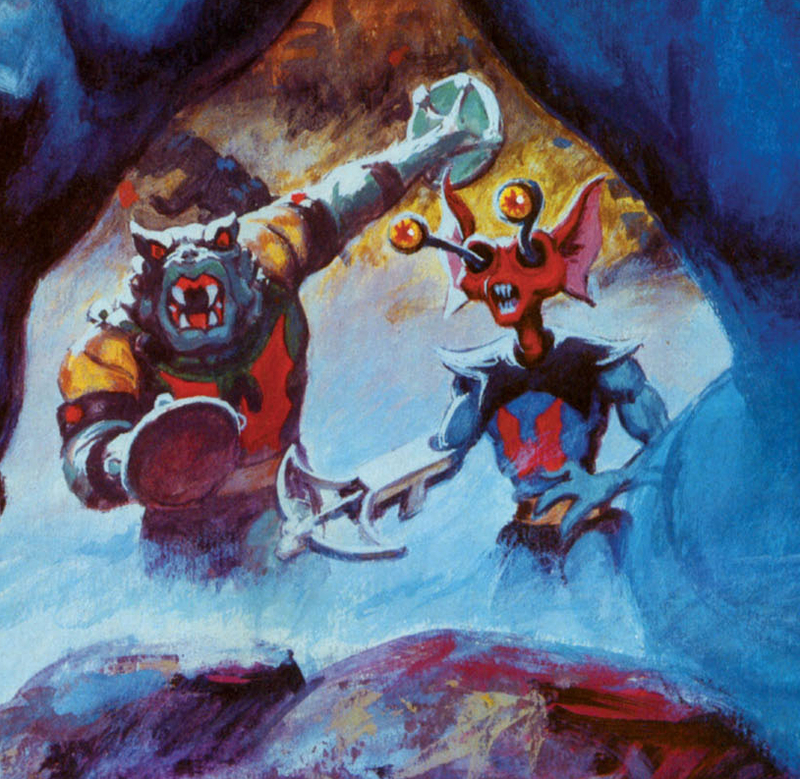 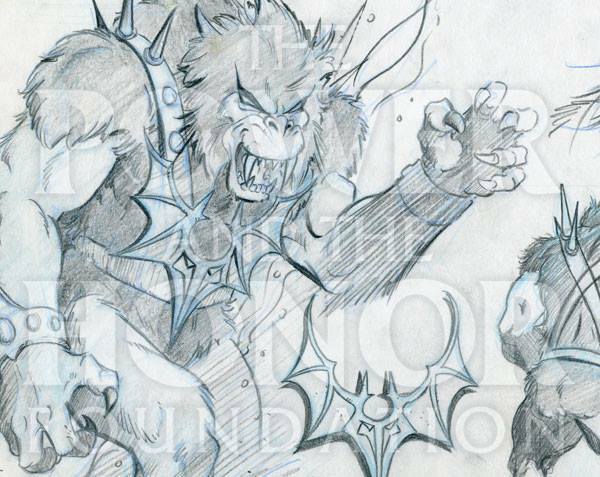 In the illustration on the back of Grizzlor’s card, he’s shown mid-leap in a surprise attack against Kobra Khan. 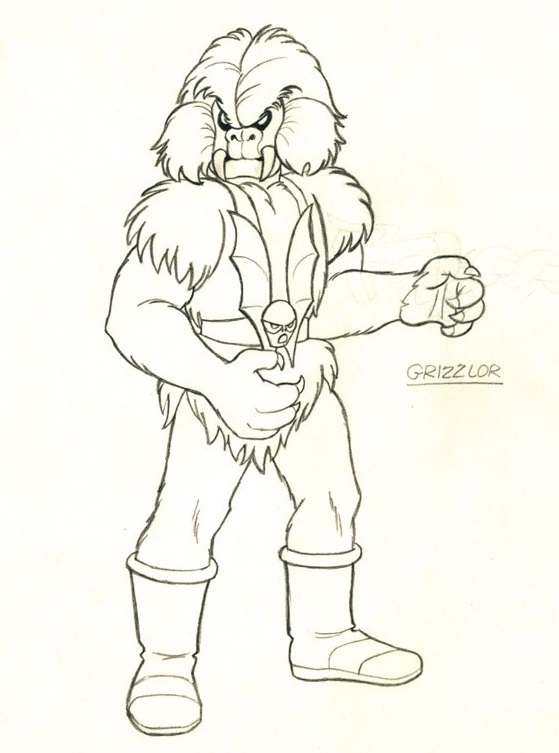 Grizzlor’s name was trademarked on September 10, 1984. 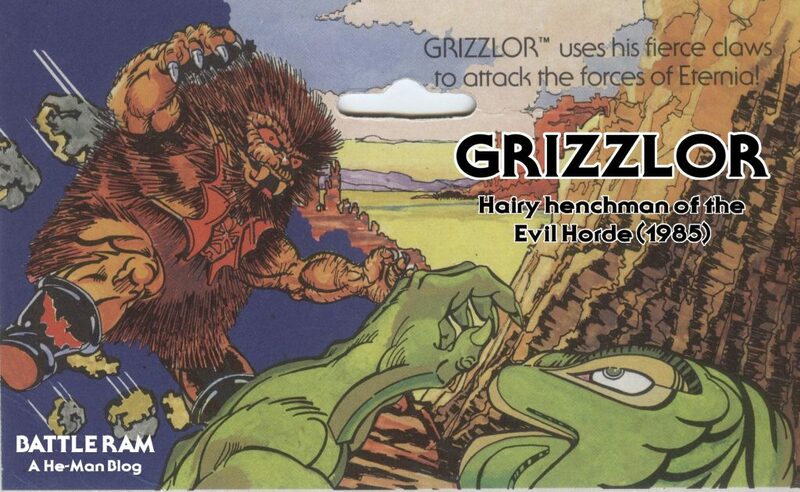 The name itself implies that he’s based on a grizzly bear, although looking I wouldn’t immediately associate him with that based on his face. 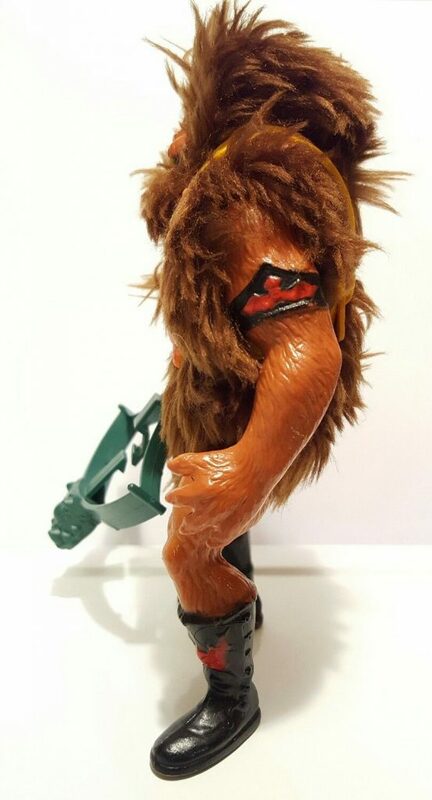 He’s big and furry, which is I suppose close enough. 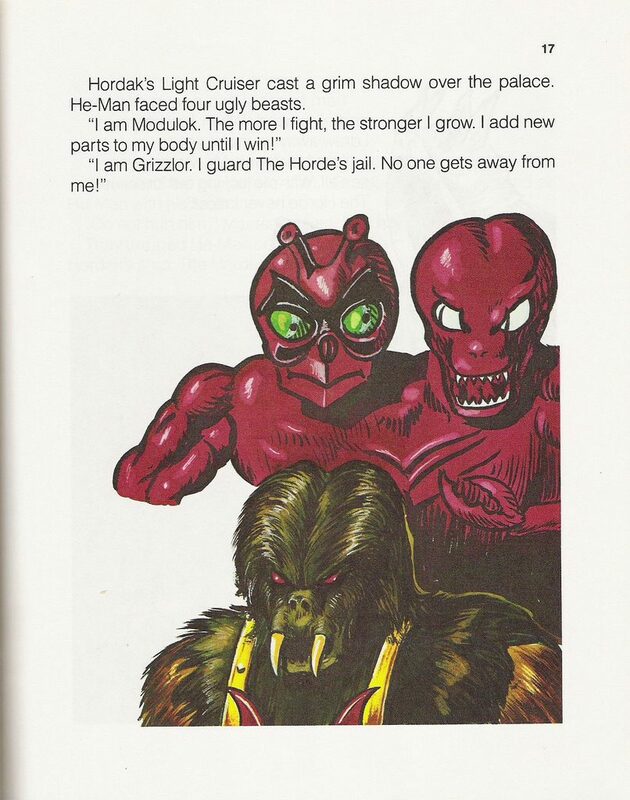 However, as mentioned earlier, according to the 1987 Style Guide (illustrated by Errol McCarthy) Grizzlor is actually a kind of wild boar-like creature. 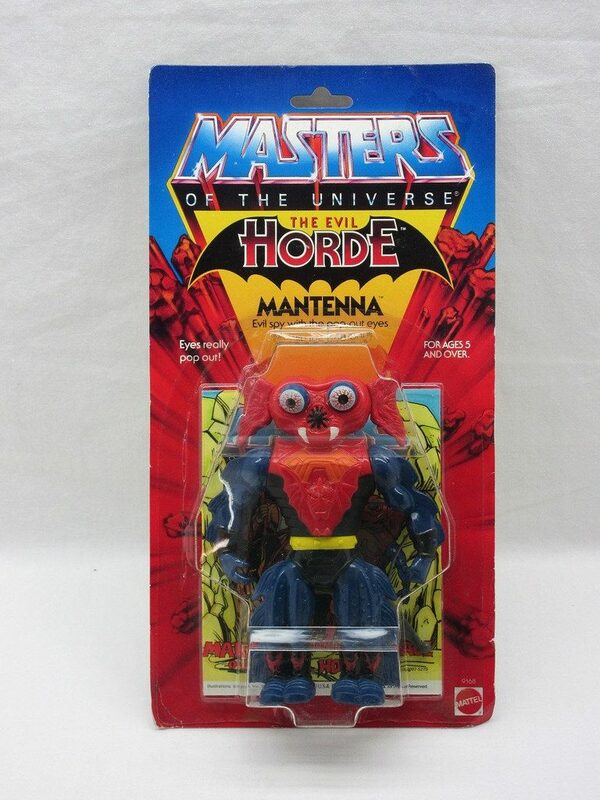 Again, this brings to mind Ted Mayer’s “Horde Mammoth” character. 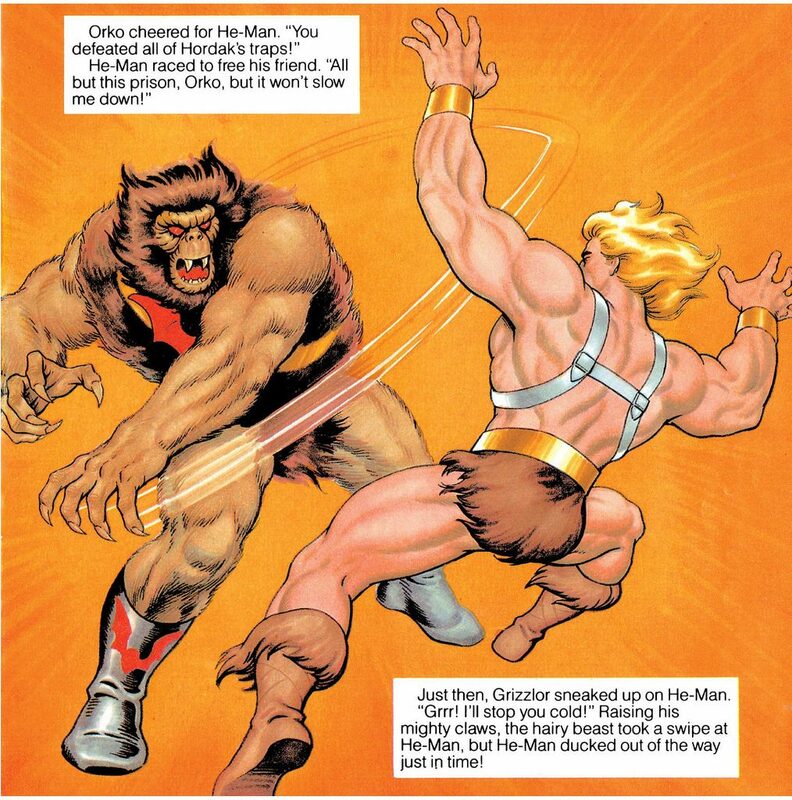 Power: Ability to ravage his foes with his wicked claws. 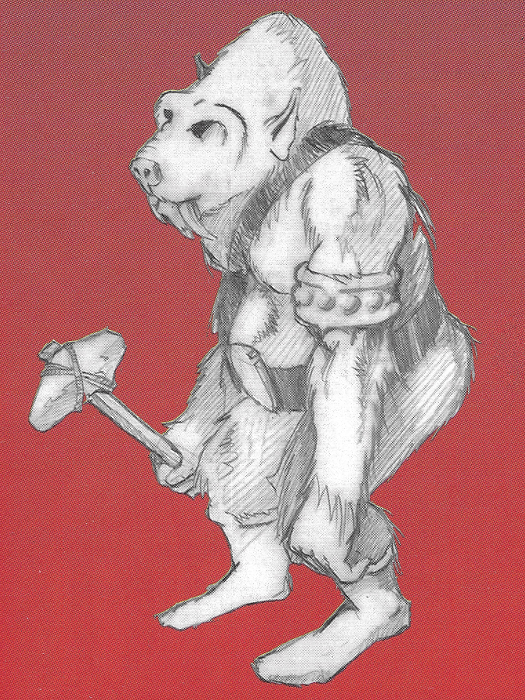 Character Profile: This humanoid boar has two sabretooth-like tusks and a large, shaggy body. He also has sharp, dangerous claws. 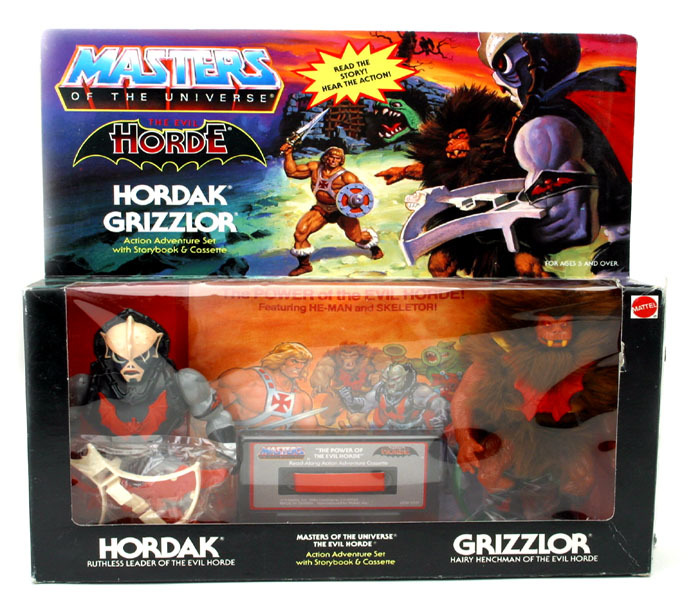 Grizzlor has the same strength and ferocity of a wild boar, but he is no the greatest in the smarts department. 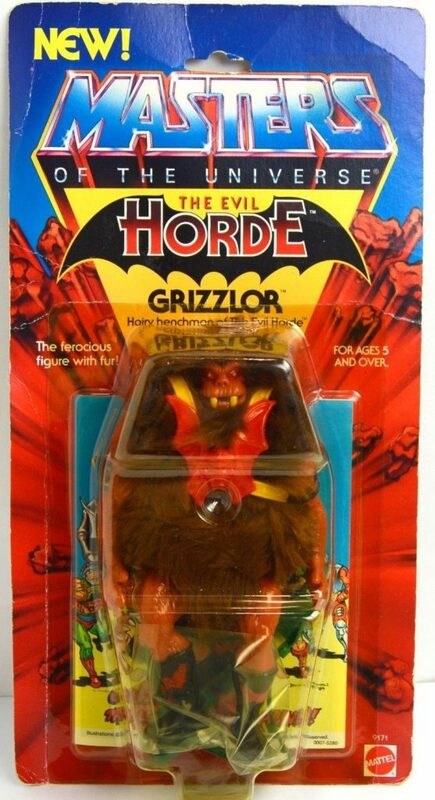 Grizzlor is the prison keeper of The Evil Horde. 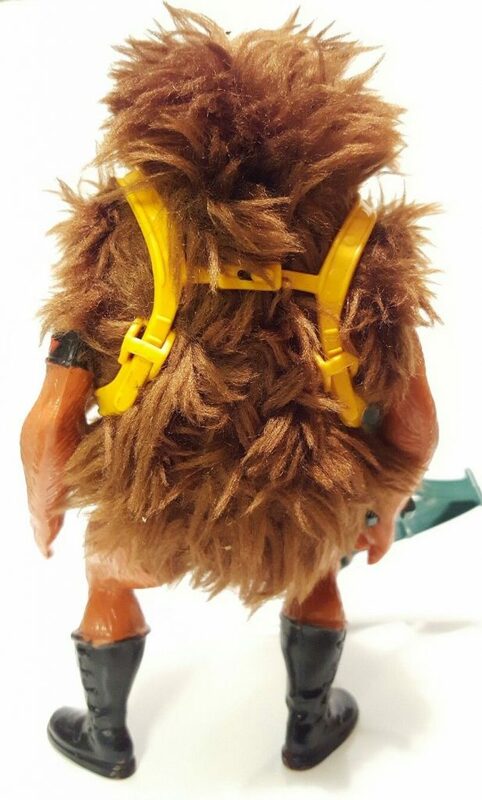 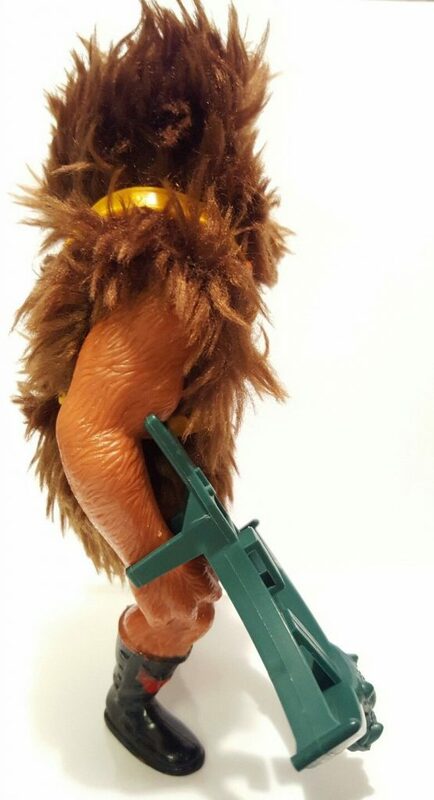 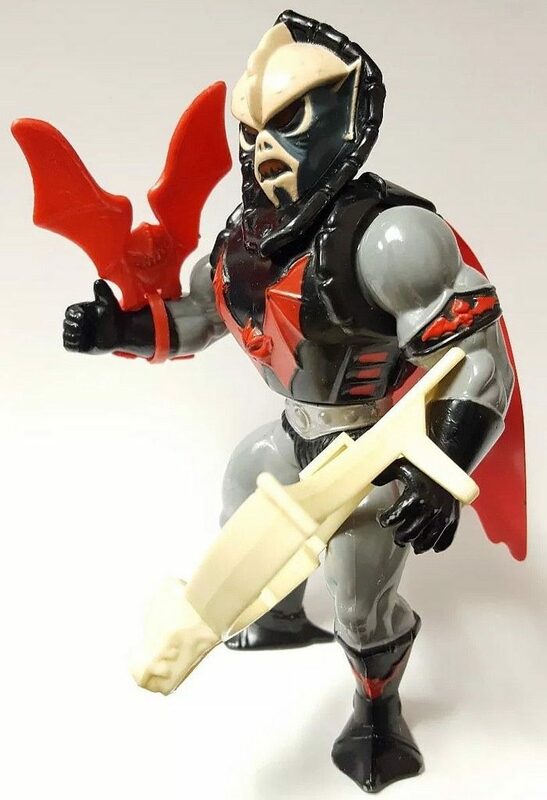 Grizzlor’s final look in the She-Ra cartoon series is somewhat more human-like than his action figure counterpart, and his harness is black rather than yellow, but it’s still a close resemblance. 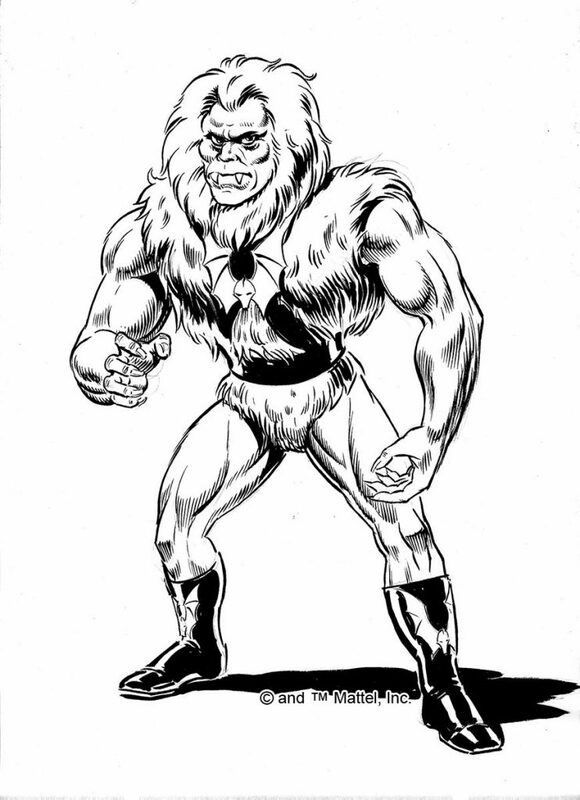 Grizzlor could be a bumbling underling or menacing henchman, depending upon the exigencies of the story, and also oversaw Beast Island. 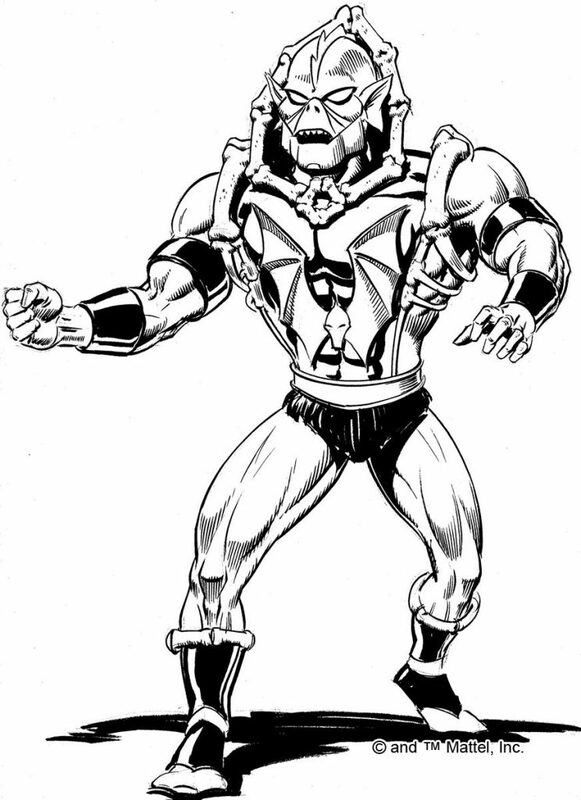 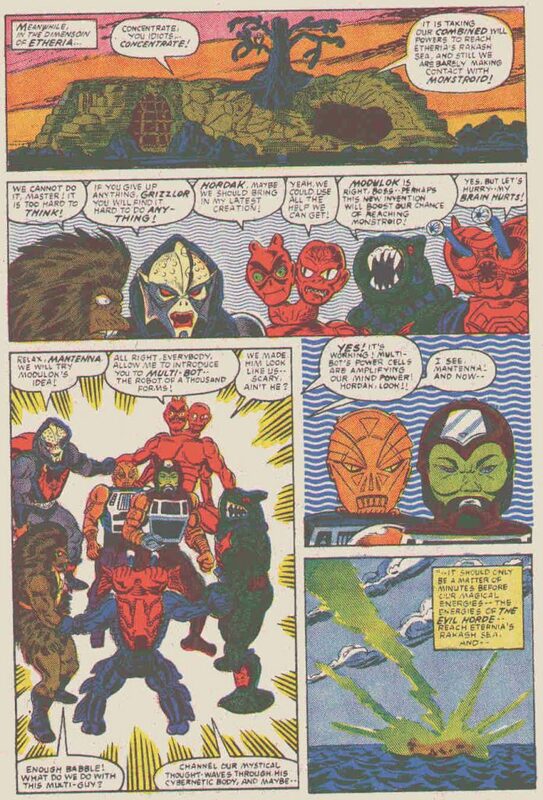 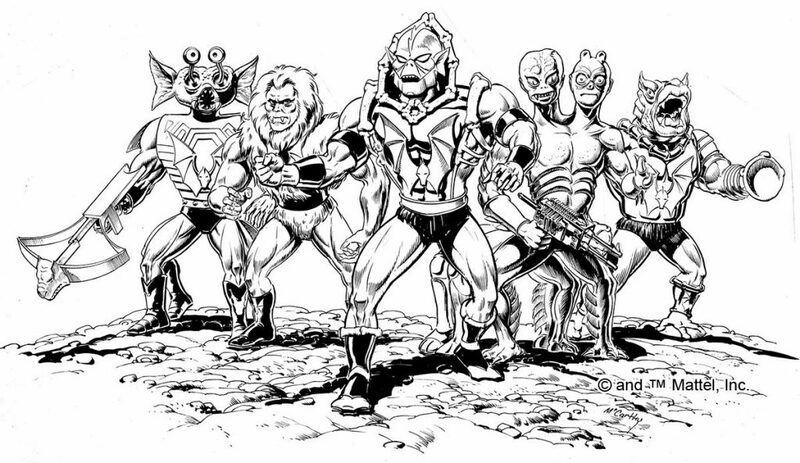 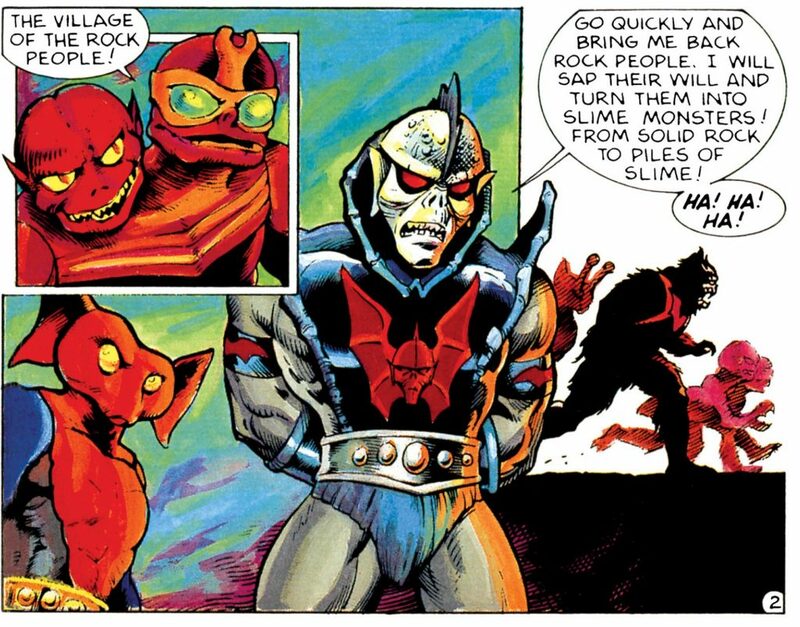 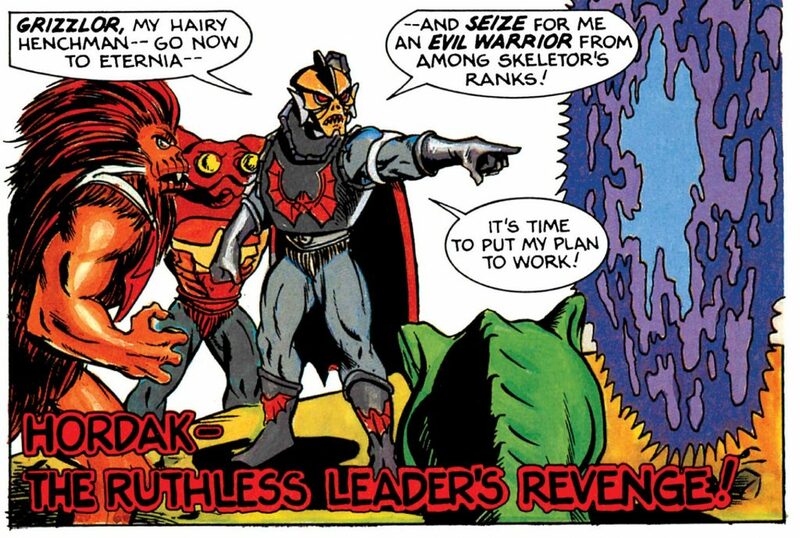 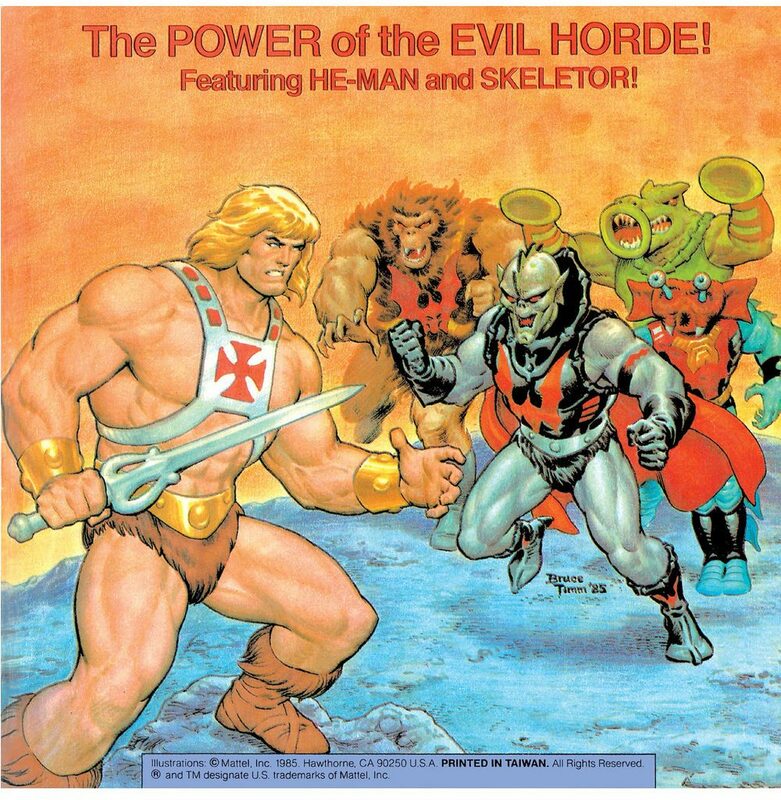 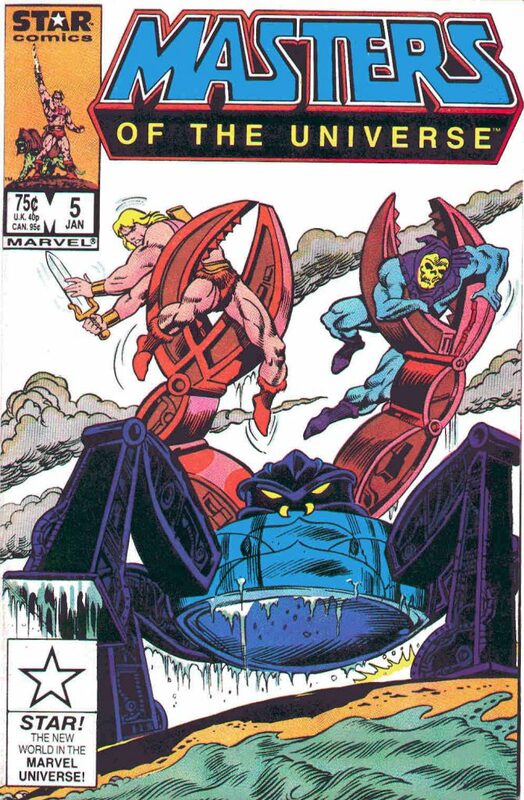 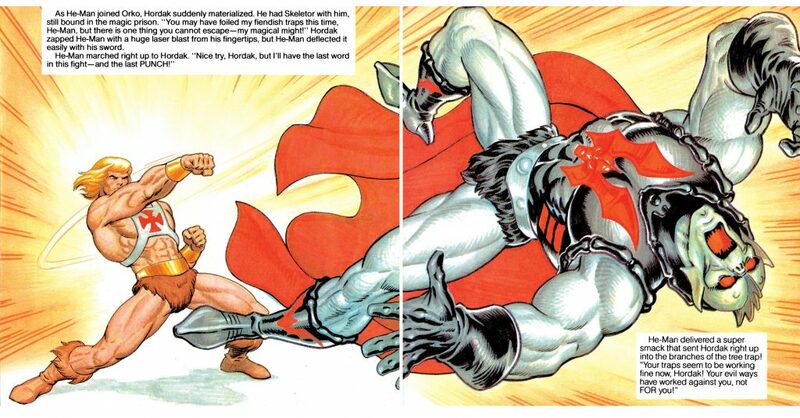 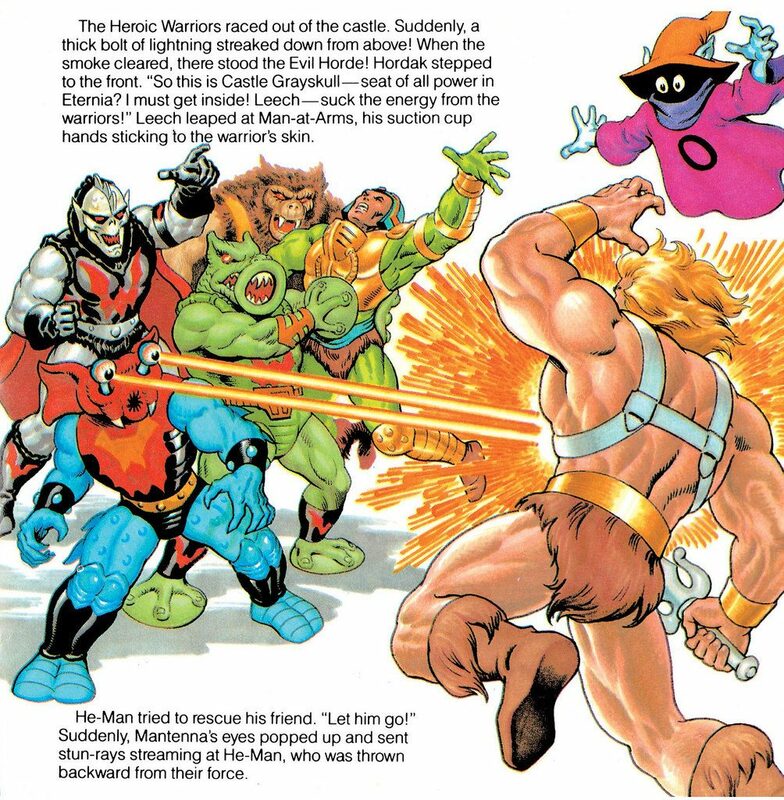 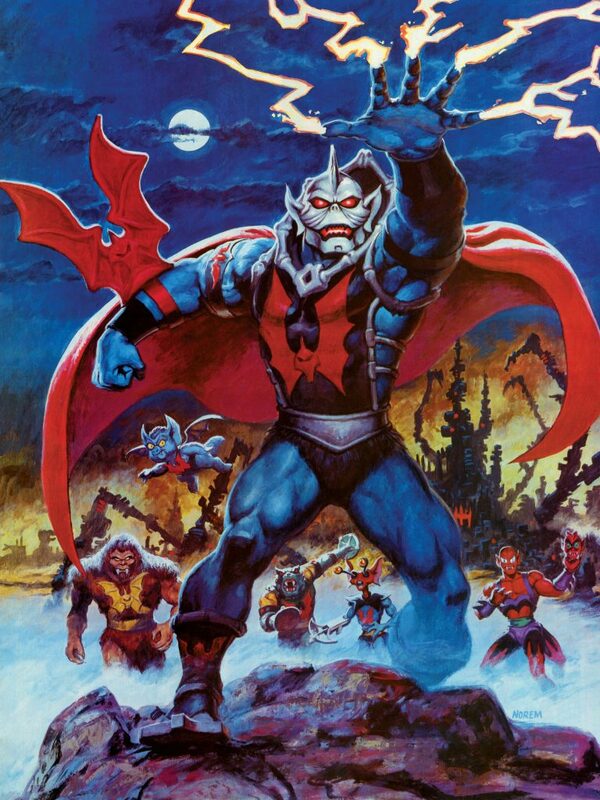 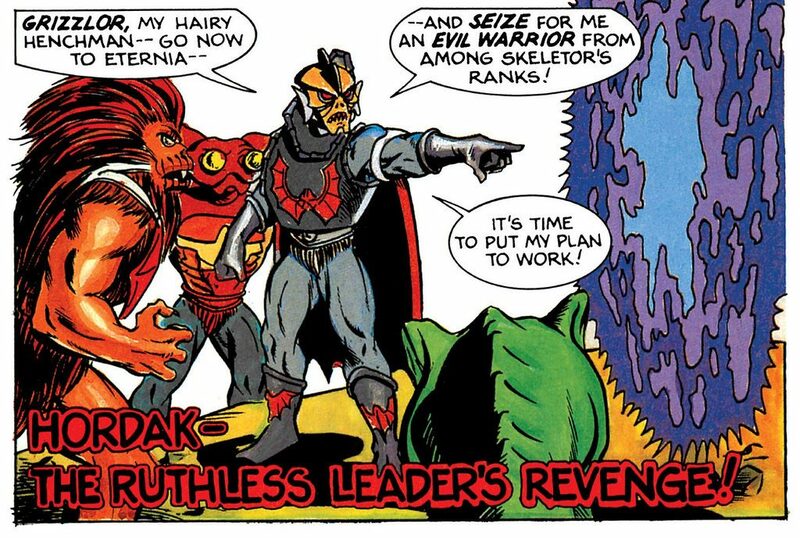 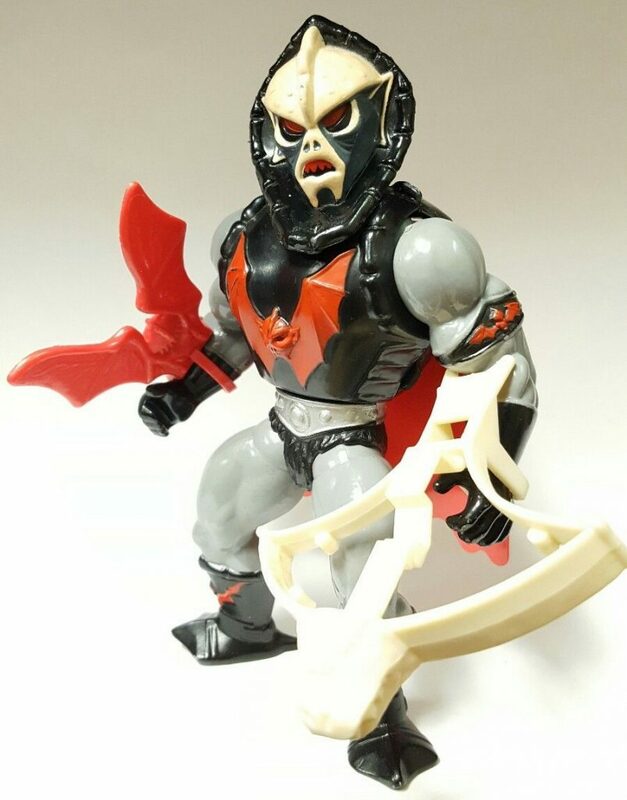 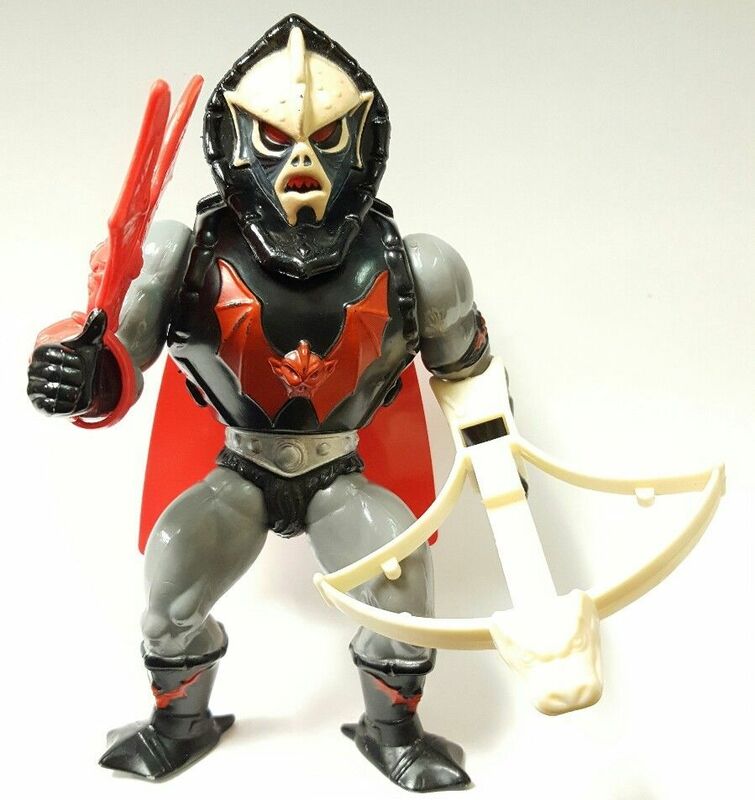 In some ways Grizzlor was the Beast Man to Hordak’s Skeletor. 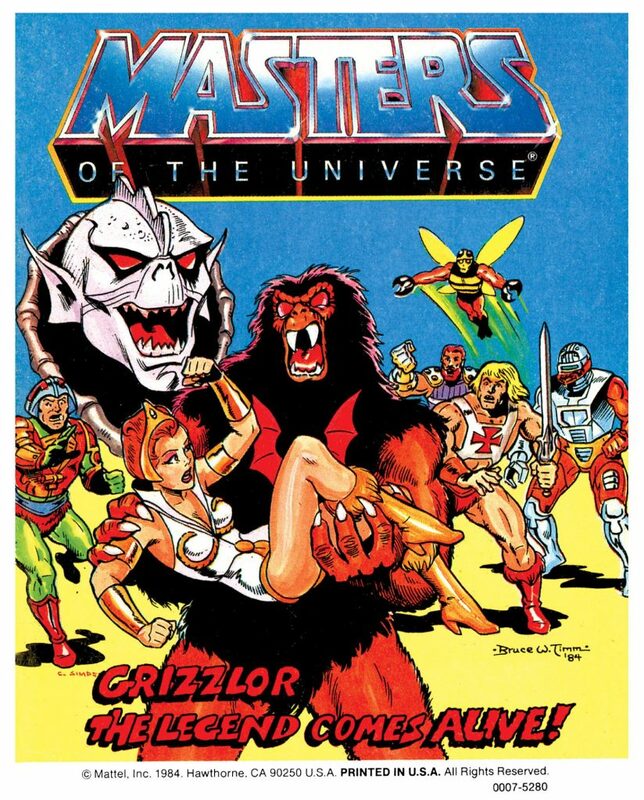 Grizzlor of course makes other appearances in a variety of comics and magazines, which is a topic I may explore in a future post.